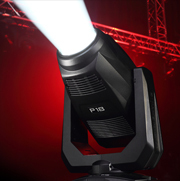 A group of professionals from across member organisations, manufacturers and designers in the live entertainment industry had a very productive meeting in Brussels on 17 May on the issue of Stage Lighting with the European Commission. As a result, we have agreed to channel our work into seeking to draft a specific, technically based, exemption for lighting uses in the Stage and Entertainment Industries in the new proposed Eco Regulations planned for 2020. This work needs to happen quickly with our collective comments being channelled through Pearle to the European Commission in advance of the next draft of the regulations due in late June. 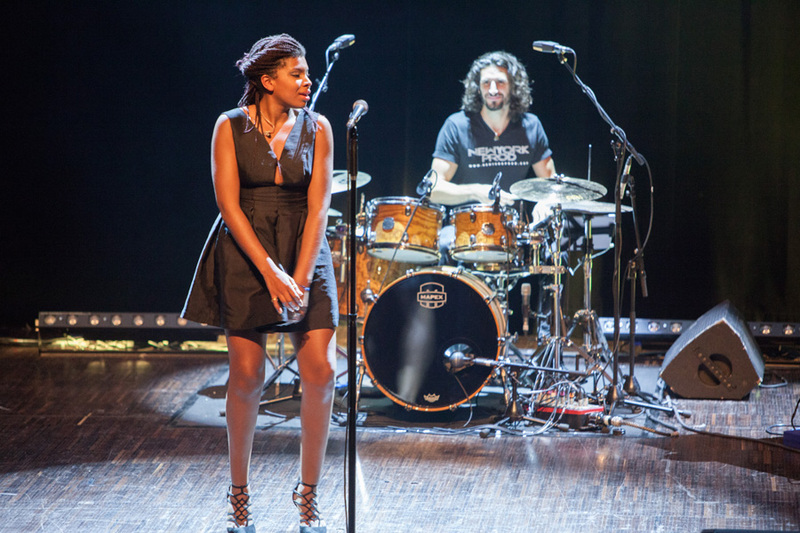 Pearle Live Performance Europe is the European federation based in Brussels representing its members in the field of music, theatre and other performing arts or live entertainment to the European Institutions. Powersoft unveiled at PL+S 2018 the new M-Force 301P01, the unique and innovative transducer updated with a series of additional features to simplify the workload of OEM partners. M-force is now available as the M-force 01 long throw linear motor for infra sub applications and the M-force 02 short throw linear motor for high acceleration applications. With longer linear displacement, M-Force 01 is the perfect tool for direct radiation and bandpass applications, enabling manufacturers to keep cabinet sizes to a minimum whilst allowing for flawless infra-bass reproduction. M-Force 02 is designed to grant reliability under extreme loads, such as bandpass applications and loaded horn configurations. Originally launched in 2013 in Frankfurt, Powersoft’s new M-Force is once again set to redefine the concept of infra bass. Based on a patented, moving magnet, linear motor structure, M-Force is purposely engineered to squeeze all available power granted by switching mode amplifiers to deliver unbelievable performance in terms of power handling, electromagnetic conversion, reliability and maximum SPL. 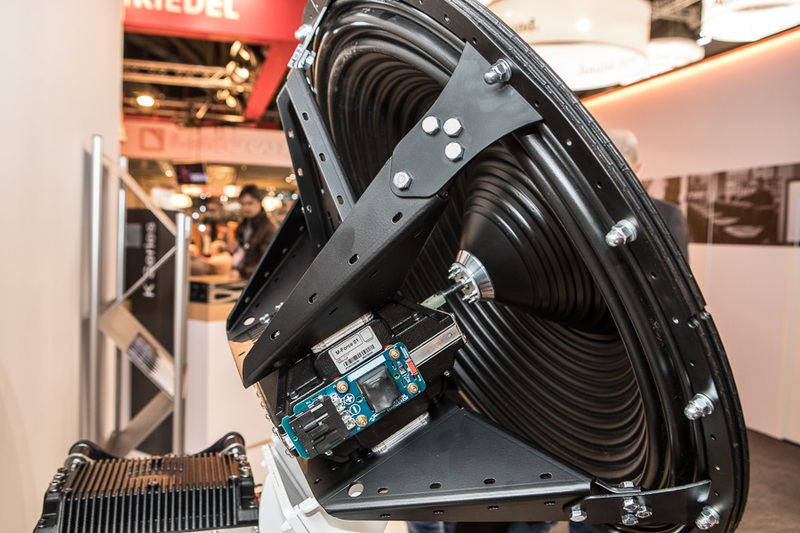 Generating linear movement with parallel moving magnets, M-Force transcends the possibilities available from the limited power and loads of traditional moving coils. M-Force 301P01 is engineered in a robust, factory assembled package, to simplify implementation. 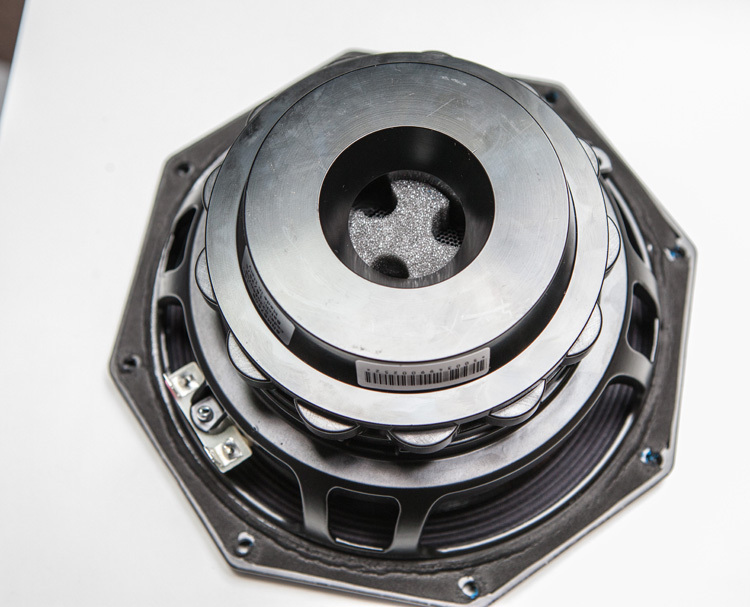 The motor is matched to the finest of tolerances to a purpose-built diaphragm, through a newly designed coupling and a lightweight chassis, thus also improving thermal dissipation. The need for an external spring has also been fully negated as magnetic spring action from linear movement is delivered by motor and magnets alone. As Claudio Lastrucci, Powersoft’s R&D Director, states “I’ve always considered power amplification, signal processing, and transducer design in loudspeaker to be one single entity in the pursuit of performance. There’s no division between one domain and another because this would limit the evolution of the products to small changes that don’t add up.” Please, check some facts from Claudio himself. 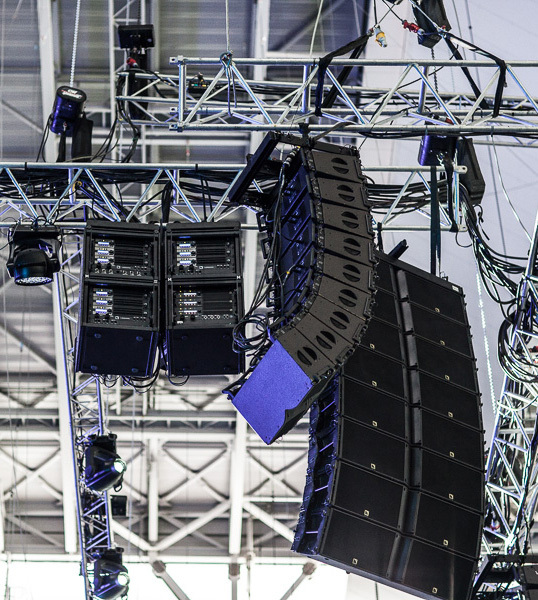 With over 20 years of experience in sound amplification and pro-audio developments, Powersoft understands the importance of making technology available to its OEM partners, while providing a strong support right from the design phase, to help maximise performance and reliability. On the Powersoft booth, the M-Force corner featuring Claudio Lastrucci. Electronics being the heart of any active system, good integration makes the difference between a good and a great end product. M-Force is configurable as a full system, comprised of M-Drive which fully exploits the potential of M-force to squeeze all of the available power granted by switching mode amplifiers. The most powerful amp module ever built, M-Drive is uniquely conceived to drive reactive loads. M-Drive can be equipped with any Powersoft or third-party DSP solution, and integrates Differential Pressure Control Sensor technology (DPC) used in both IPAL and M-Force systems. Powersoft’s patented DPC allows a differential pressure signal, acoustically obtained from the two sides of the moving loudspeaker membrane, to be fed to the amplifier just as any other electrical feedback signal, thus overcoming one of the greatest limitations to the achievement of outstanding acoustical performance. In turn, Powersoft’s Zero Latency DSP provides an innovative architecture that ensures an astonishing 10μs latency on the critical feedback paths allows analogue type feedback approach with the flexibility of a DSP core. The M-Drive, a whole lot of power, and on top of it, the DPC, which allows a differential pressure signal, to be fed to the amplifier. Each element of the M-Force system, indeed every OEM product from Powersoft, is configurable with Armonía ProManager, Powersoft’s dedicated software tool. With Armonía Pro Manager, OEM manufacturers can initialize the system so that it shows proprietary brand information in Armonía, including series and model name, image and the serial number of the product. 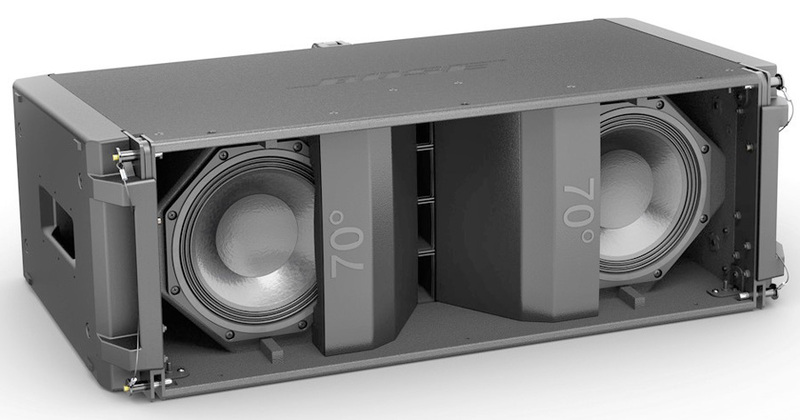 The unmatched power versatility and simplicity of Powersoft’s robust OEM technology has already been embraced by many leading loudspeaker brands. M-Force is at the heart of major applications, including the world’s largest sub installation at the Avalon nightclub (Los Angeles, USA), and has been instrumental to a number of concerts and tours (Red Hot Chili Peppers, Caparezza), music festivals (Ultra Miami, Raumarock, Helsinki Pride), as well as global events such as the Super Bowl and the Grammy Awards. Its versatility is such that it is also used in cinema applications while in Iceland, M-Force recreates earthquake movements in the LAVA Centre. The Powersoft trad fair Team resting and cheering ! 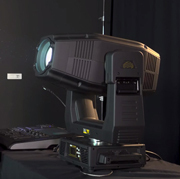 Before the launch at Prolight+Sound, Ayrton unveils a video presentation of Mistral-TC, a brand new 300 W LED module spot luminaire, C.M.Y colors mixing system, a zoom range of 7° to 53°, variable C.T.O., color filters, 2 gobo weels, as small as Merak. With a CRI greater than 90, Mistral shows a great performance for a luminaire of its category. 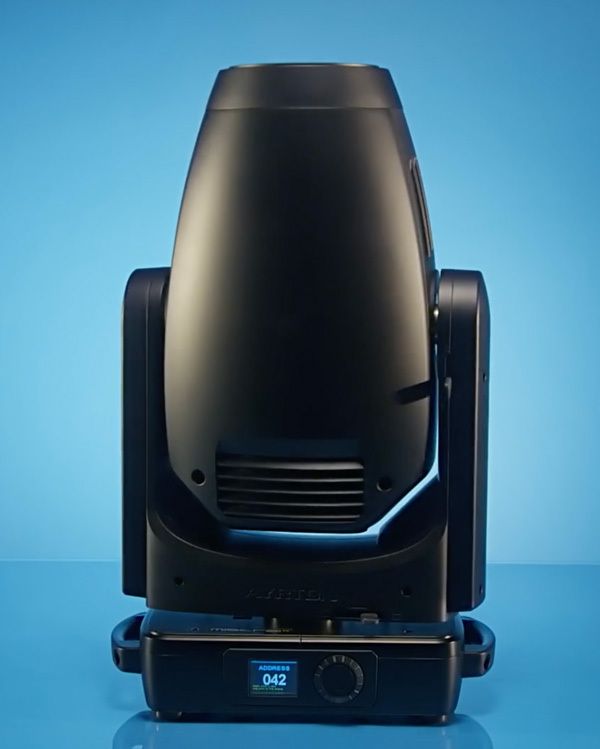 Equipped with an entirely new LED module using a monochromatic light source calibrated at 7000K with a native coloring index greater than 90, Mistral delivers a light output of over 14,000 lumens. The optics uses 13 high quality anti-reflective coated lenses delivering a 8:1 zoom ratio and a zoom range of 7° to 53°. The 119mm frontal lens produces a flat beam. A C.M.Y colors mixing system combined with a variable C.T.O. and a seven positions complementary color weel, produces an infinite pallet of saturated and pastel colors. 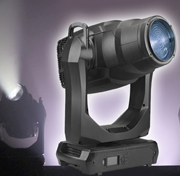 The luminaire effects system consists of two weels fitted with interchangeable abstract or volumetric HD glass gobos. 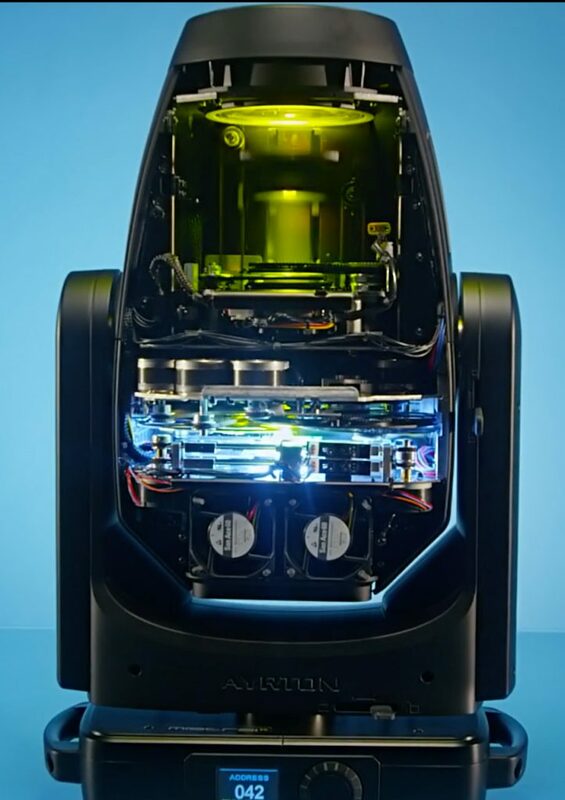 One weel has 7 indexable rotating gobos, and the other has 9 fixed gobos. Using these two gobos weels in combination can achieve incredible morphing and graphical effects. Mistral also features a 15 blades iris diaphragm, a 5 facet rotating and indexable prism, a soft-edge frost filter, a strobe effect with speed adjustment ranging from 1 to 25 flashes per second, a dynamic animation effect and an electronic dimmer from 0 to 100% without color variation. All of these features are standard. 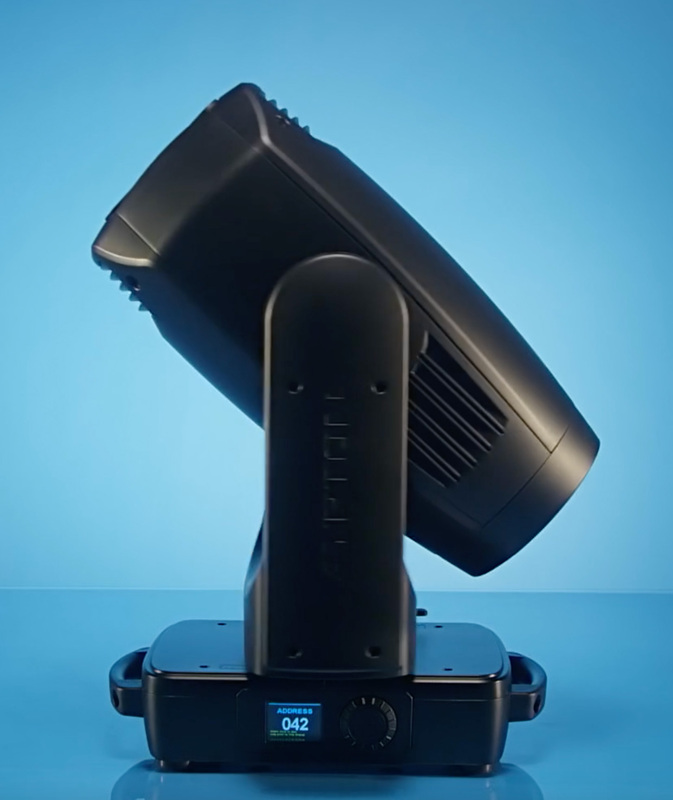 For optimum cooling and stability, Mistral is equipped with a new liquid cooling system using a heat pipe that includes a silent mode designed for studio and theater applications and can be controlled by DMX-RDM, or wireless with the standard Timo from LumenRadio. The icing on the cake? Christian Heil granted us an interview. We reviewed the essence of the L-ISA project, the IT tools needed to implement it and, finally, his vision of modern amplified sound. 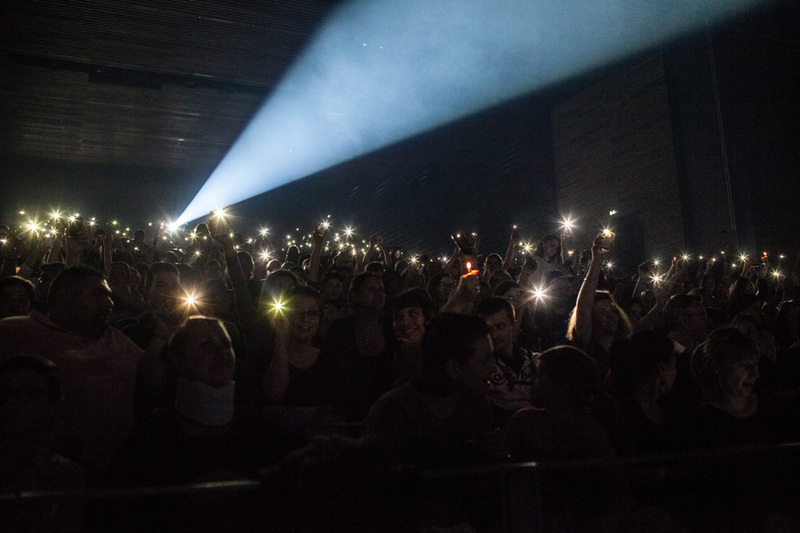 SLU: A persistent legend would have it that you had the idea for L-ISA one day after a concert where you, like 90% of the audience, were poorly positioned. 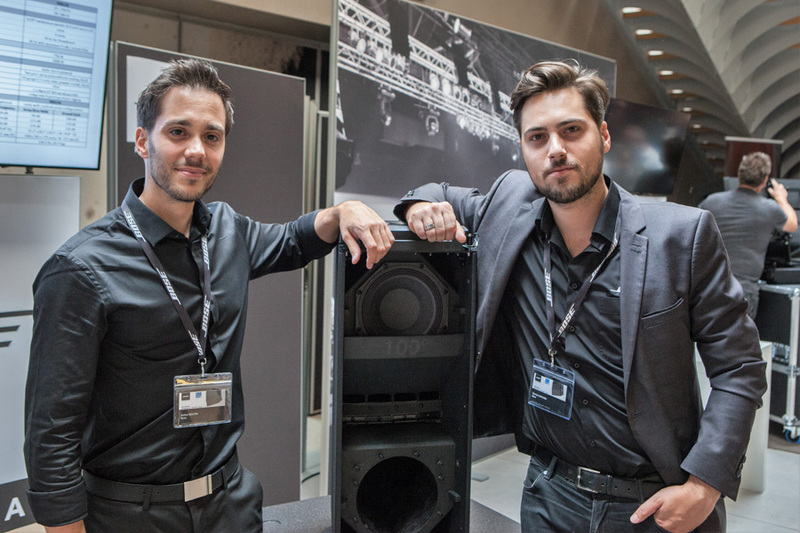 Christian Heil (President L-Acoustics…): It didn’t happen in one day; it’s been a problem for a very long time. When I founded my company 30 years ago, I didn’t know what sound reinforcement or live production were, I was only interested in the technology that we were helping to move forward and that satisfied us for many years. Little by little, I put together teams of sound engineers and application engineers. I worked closely with friends in show business, and I noticed that they were often happy with the work they were doing because they occupied a privileged place in the theater, but the people in the audience weren’t enjoying that same level of satisfaction. So I put myself in the shoes of the spectator, and I realized that I was frustrated. I had to concentrate to connect the sound with what my eyes were seeing, a process that spoiled the artistic experience of the show for me. Unlike a technician, a spectator is looking for enjoyment, spontaneity, sensation and realism. He doesn’t try to understand if the treble is clean or if the phase is coherent, and that’s what made me gradually think about refocusing on sound and image, to merge them. Another factor which pushed me on is the enlargement of stage-fronts to provide more room for set and lights, which in turn relegates the sound to the sides and disassociates sound and image. Christian Heil: We try to do that but it doesn’t work very well. So I told myself that we had to try to enter the multidimensional and hyperrealistic realm, correcting the historical error of putting speakers on the left and right, while the people are in the center. Christian Heil: It was a very good idea! Then we had to fall into the illusion of stereo, while we never stopped using dual mono. The solution to try and change the game could only come from a respected, innovative and well-established manufacturer. But it’s not going to be easy. 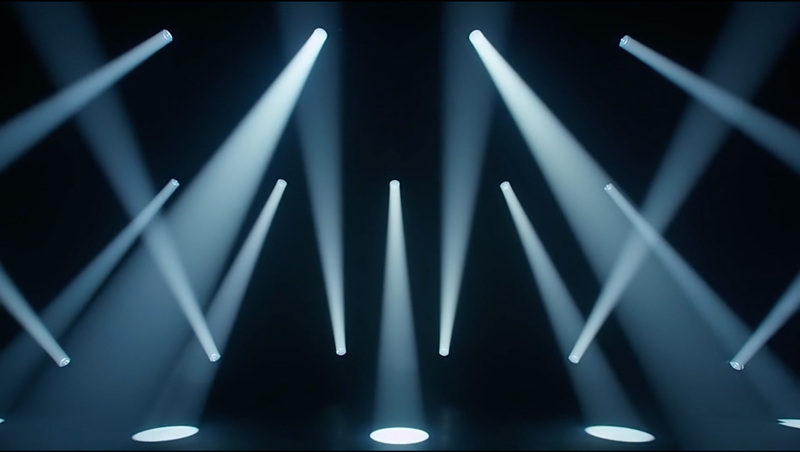 We’re not going up against other speaker manufacturers – instead, we’ll be opposed by lighting designers and scenographers who won’t want arrays of speakers in the field of vision. I’ll tell you a story. I was invited to the London concert of a world-famous artist. The show starts and I can’t see him. The huge video wall projects psychedelic images. It ends up showing him, very small and at the center of the stage. Is this really doing justice to the artist, who was returning to the stage after a long absence? A review of how L-ISA works. The “spatialized” zone offers any listener within it an immersion in the mix with a precise correlation between the location of the source on the stage and the amplified sound it generates. 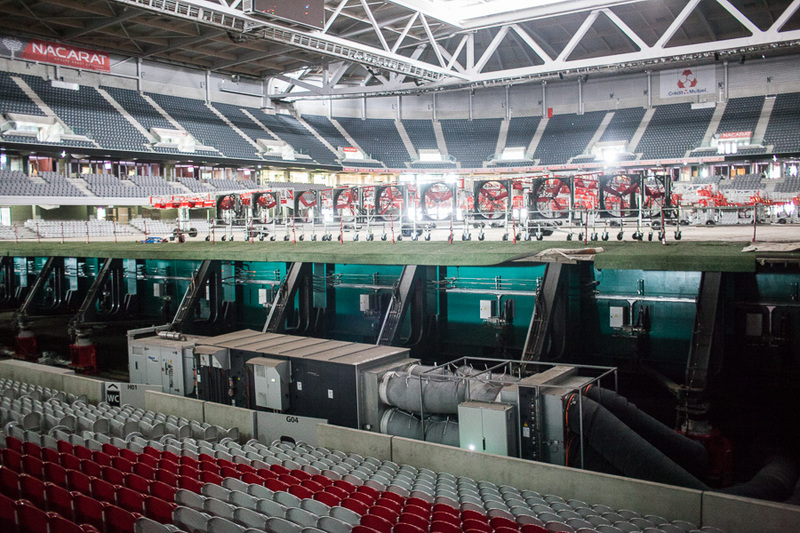 Here is what a standard left/right would provide in the Lille Arena. The light green area represents the zone where the stereo image and the phase are optimal, the dark green area is where the listener is covered in dual mono, interfering also with the out-fills and, finally, the yellow area is where only the out-fills are heard. The portion where the audience receives a stereo signal is no more than 8%. The same prediction, but with the L-ISA system. The dark green here is the interfering zone between L-ISA and K2 side hangs. 26% of the public receives a signal in phase and with a spatialized image. The experience of a concert is not “sonic” enough anymore. L-ISA is a gamble that needs the support of sound engineers, but the ones who undertake this choice are still rare. François Gabert, Stéphane Evrard and the entire ONL team took the plunge – let’s call that a perfect alignment of planets. SLU: When did L-ISA take shape? Christian Heil: We started in 2012 with Sherif El Barbari – our field man, who specified the project and participated actively in the development – and with Guillaume le Nost, who took charge of the development and built the necessary team for that. For a few years we worked in the shadows of a laboratory, doing algorithmic tests and compatibility tests to create sound designs. We had the systems, but switching from left/right to multichannel meant changing their size. That said, we have the necessary models, between Kara, Kiva II and Syva. We should have had Kiva II for today’s production, but unfortunately it is too recent a product, and we couldn’t find the number of enclosures necessary in time. François Gabert’s FoH, with his Lawo and his pair of PCM96s. At the top, the seven arrays of the L-ISA system, extended beyond the stage. SLU: I must say that in the extended version, with seven arrays, it really starts to perform! How many are needed for a typical deployment? Christian Heil: L-ISA has two parts. 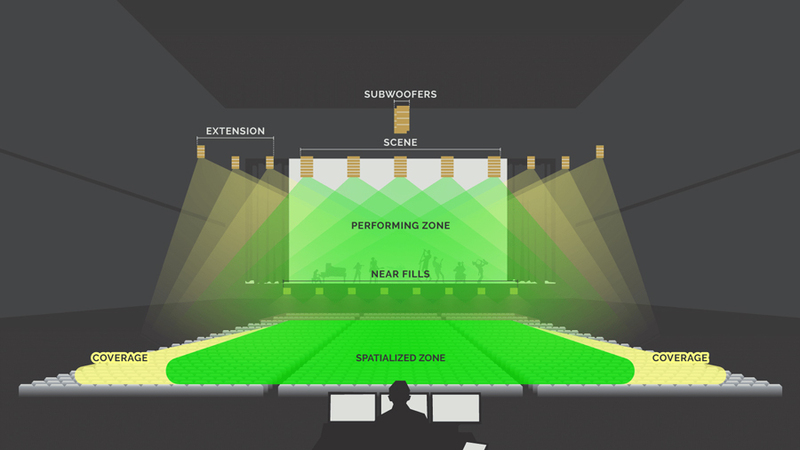 The first, called the Scene system, uses five or more arrays to cover the width of the performance area where the musicians are. The second, called the Extension zone, offers a wider panorama in which we will put reverberations, ambiance, some synths and choruses. A kind of outer panorama. It’s not necessary for the Scene and Extension systems to have the same density. If you were touring with a big rock band in arenas like the AccorHotels in Paris or the O2 in London, it wouldn’t be unthinkable to hang K2, which opens very wide, naturally has more contour and would immediately reassure the sound engineers, who would be in their comfort zone. The major disadvantage is that, instead of hanging two big classic arrays, we would put five slightly shorter ones. Add the Extension and the budget will no longer be feasible. We work according to a scale ratio and a number of specific components, whether they are K2 or Kiva II. Christian Heil: Absolutely. Tonight, for example, this is a configuration where the need for classical music contour is not very high, but even in case of more demanding music, the amount of equipment would not drastically change. To better understand, let’s go back a bit to basic acoustics. When you put the hundred or so 15-inch or 18-inch membranes of a traditional system into an audience, there’s a little chaos, sort of like what was done before the V-DOSC when you multiplied the number of boxes. Suspended bass sources combine only in the plane that bisects the line between them, and when you get outside of that, you have problems. When you add some subs, which are occasionally arranged frontally for a more distributed result, you don’t gain much energy because of the losses in efficiency due to the linear configuration. Eight KS28 flown centrally, cardioid and endfire. It may seem like little, but their placement, their impact and their incredible sensitivity make this number more than enough, especially for classical music. The concept of L-ISA specifies that all of the bass and the infra be located in the center, because everyone knows that if we could place all sources of bass in the same place, within a distance of one half-wavelength, we would have the punch throughout the whole room. 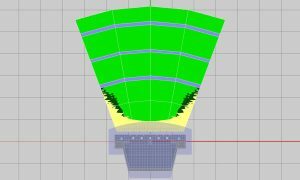 Ideally, even if it’s not going to please the lighting people, hanging the subs in a central point, when technically possible, is good for the sound. When this isn’t possible, one solution may be to decouple the sources to avoid interference, but for that you have to convince sound engineers who naturally prefer their comfort zone. Madje Malki, the hyperrealist immersion adventurer and Christian Heil’s long-time accomplice! Even a friend and adventurer like Madje, who used L-ISA for a long Renaud tour (a well known and highly appreciated French pop singer – ed. ), sometimes feels the need to return to a more conventional mix. Finally, it seems to me that, in the low end of the spectrum, we’re reaching overkill. A well-known heavy metal band used 64 subs at the AccorHotels Arena recently. I think it works, in a bit of a….. chaotic way. (he laughs). SLU: Fortunately, otherwise it would be intolerable! If I understand you correctly, you want to entrust the bass and the infrabass to a single central point of emission, and the rest of the spectrum would go to L-ISA arrays. Christian Heil: Everything below 100 Hz can be grouped in one place, which allows you to use smaller arrays. That’s why there is no K2 in the central array. We connect everything in the center with subs, which also work as bass cabinets. SLU: Do they have a specific preset? Christian Heil: They have to go up to 100 Hz. We did some outdoor tests, and even if I take the outermost array in Kara in relation to a single source point of bass and infra, it still works better than if I hang K2 and I add some subs in the center, because they interfere. This, of course, can’t be extended infinitely because of the relative distance between subs and heads. It would create problems of delay and level. 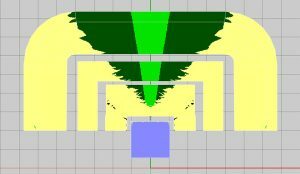 So I’m not saying that in a stadium, with a central system and a stagefront of 70 meters, we would place Kara 30 meters from the bass point, but in many other places, we would have a better result than with the left/right. SLU: Kara is therefore the reference enclosure for L-ISA. A single 3” driver is not a problem? Christian Heil: The number of drivers doesn’t matter, it’s a line-source system, we use as many enclosures as it takes. SLU: How does one determine the number of enclosures with L-ISA, exactly? Christian Heil: We begin the L-ISA design from the base, the left/right. Here in Lille we looked at the 2016 design, the SPL mapping, and we proposed the “same thing ” but with another system. We provide the same energy, distributed in the room. L-ISA is providing the same distributed energy as a traditional system. But better. SLU: So, I’ll ask the question to the designer and engineer: is the 60-120 Hz octave reproduced by a system of small speakers equivalent in impact and in qualitative feeling to that delivered by a system with an equal emissive surface but using, for example, 12” cones? Christian Heil: We asked ourselves this question, too. The answer is somewhere between yes and no. I think that, first and foremost, it’s about mixing references, but at the same time I’m not a mixing engineer, and if Madje were here, he might not agree (he laughs!). With everything between 60 Hz and 100 Hz, I will always prefer the reproduction from a 15-inch and even an 18-inch transducer, which has less distortion. Once you go above 100 Hz, I don’t see the difference anymore. Now look at the problem in reverse: do I not prefer to divide the sound energy in the 80 to 120 Hz band over a series of 8-inch transducers, rather than concentrating all that energy on two 15-inch speakers? This time, the answer is not so clear. If I put a single signal on an 8″ membrane and a 15″ membrane, I would prefer the 15″. But it’s not the same thing at all with music. When I combine a lot of different signals and I drive them all into a 15″ membrane, their combination is not ideal; I prefer more and smaller membranes. When we talk about Madje and Renaud (Madje and the sound company Potar Hurlant have used L-ISA on a long Renaud tour– ed. ), as wel as all good pop and rock mixers, they all tend to bring their mix back to the center. Renaud’s stop in Paris at the Zenith. Six KS28 in a cardioid configuration and a central array of 14 Kara. Christian Heil : Exactly, except that, if we put kick drum, bass, in short, the fundamental elements in few Kara and only in the center, the system will suffer more than, for example, in a line of K2. We must learn to expand and better exploit the number of enclosures in the air, which the classical sound engineers are doing very well. That said, if Madje doesn’t agree, I’m sure he’d be happy to express his opinion here! SLU: He’s welcome whenever he wants and he knows it (Madje, if you’re listening…). Is that why you prefer L-ISA for pop shows that are a little more “calm”? Christian Heil: Certainly, it’s more appropriate for a style of music that takes advantage of spatialization and not so much of power in the way that we have just mentioned. I’m thinking of Jean-Michel Jarre, for example. The very nature of his music would work excellently with L-ISA. Christian Heil: Of course, there are plenty of possibilities with the movements that, in some music, could add a lot. SLU: Don’t you think that the current limit of L-ISA is Kara, because of its rather limited impact in the bass, its dynamics and, especially, its dispersion, which at 110° doesn’t have the appropriate coverage for your multichannel technology… in other words, wouldn’t it be better to have a specific enclosure for L-ISA in order to help it succeed? At least 140° of dispersion from Syva up to above 10 kHz. 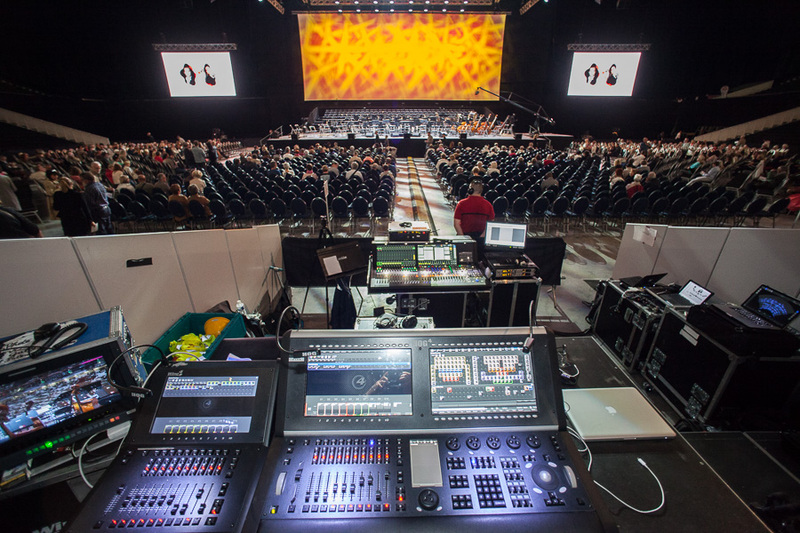 Just what is needed for L-ISA and for a lead vocal amplified only from the center array to reach the entire audience. Christian Heil: Of course Ludo, but all in good time. The answer is clear. If L-ISA and multidimensional systems in general catch on, we will have to reinvent sound systems to make them lighter, quicker to install and with wider coverage. If we meet with success beyond the enthusiasm of the public – namely the willingness of the productions to take the leap –we’ll likely have to go back to the drawing board. I think now it’s still premature. In any case, it’s the sound companies who will demand systems from us that are designed specifically for multidimensional deployment. 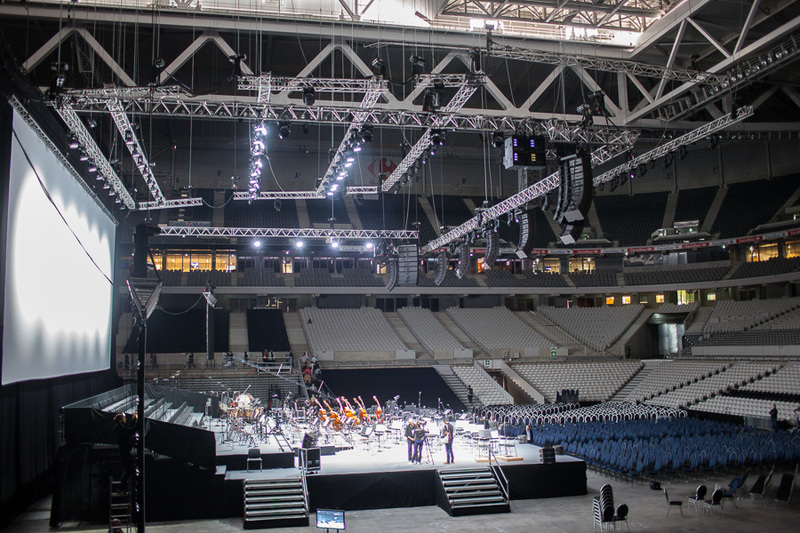 SLU: With its very wide dispersion, it is the only one in the L-Acoustics catalog that perfectly corresponds to the L-ISA principle, which requires that each group of the frontal system optimally cover a common area representing more than 75% of the audience area. Christian Heil: This enclosure was a gamble and the results are very good, in residential applications and in live. Its nominal horizontal dispersion is 140° and effectively guarantees excellent coverage, which is the key to L-ISA. SLU: Where are you in the development of the IT tools to manage L-ISA? Christian Heil: We are advancing in parallel. Today, the latest generation of Soundvision is able to qualitatively analyze a multidimensional design because we know that it is different and necessarily complex. We have been doing left/right for 40 or 50 years without asking ourselves very often the question of where it overlaps, how far the central stereo – which is actually closer to being a dual mono – goes.. In fact, no one knows what the percentage is of each category. A view of the L-ISA gauge. The number of criteria is such that it would be difficult or impossible to make it “stick to the walls”. The GUI of this gauge is still provisional. SLU: Yes, you can see it with Soundvision. 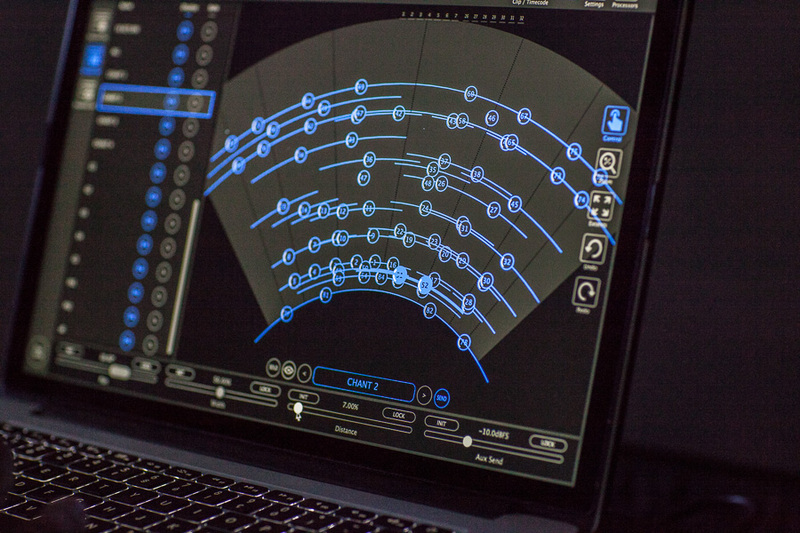 Christian Heil: Right, we now have a layer in Soundvision that is practically a certification of our own designs, whether they are left/right or multidimensional, and this by means of a score. This new layer is the result of various criteria identified as the percentage of the audience covered, the one to which all signals converge. There is an SPL distribution criterion. 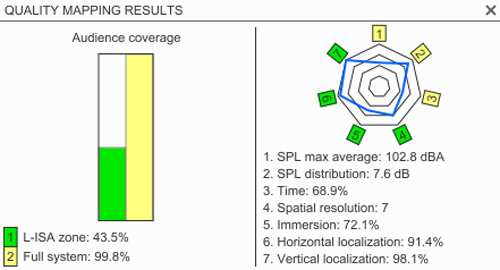 We also check – and this is new – the temporal impact related to different acoustic paths, depending on where the listener is positioned in the room. We’ve gotten used to it, but in dual mono, as in stereo, we live with comb filtering and the sonic pollution of the second source. We also have a criterion that is related to the resolution of the sources: the ability of a spectator to recognize and separate the sources he hears. It’s a kind of spatial resolution, like a pixel in an image. We will also look at the angular deviation that exists between the real source and the sound source. A score is given to the horizontal and vertical deflection. Due to the placement of the arrays, often where it errs the most is in the vertical deflection, which pushes us to negotiate the lowest possible hangs. But this is difficult because a show combines sound, lights, images and scenery, and everything must coexist for the entire audience. All of these aggregate scores provide a final score. No more lying to ourselves… we know exactly and objectively where we stand from a qualitative point of view. Christian Heil with, on the right, Stéphane Evrard, the Technical Director of the ONL. Christian Heil: Yes, but I’m doing what I used to do with the V-DOSC twenty years ago. L-ISA works on principles that we establish almost like school rules – rules made to be outdated later on. The technicians who use this system will go outside of the box and will invent countless other uses. The Puy du Fou, with its circular stage, and other theme parks loved the possibilities offered by L-ISA. L-ISA, work in progress ? SLU: Will the L-ISA processor algorithms evolve further? Christian Heil: Guillaume le Nost, who develops it, and Sherif El Barbari, who utilizes it, have spent nearly three years working on the way audio is manipulated in the processor. Sherif El Barbari assists François Gabert and answers all his questions about L-ISA, which he knows like the back of his measurement microphones. Christian Heil: There have been subsequent generations of presets – as I recall, there have been seven – and now we understand what needs to be done. SLU: How do you harmonize what the hanged and stacked enclosures reproduce? SLU: What should you do for the sides, where a lot of people tend to be positioned? At the moment there is K2 here in Lille, and even on the Renaud tour. Could you not attempt to create even a reduced effect of spatialization? Christian Heil: We thought about it; we tried a certain form of duplication but, for the moment, we haven’t found the right solution because the pollution that it causes far outweighs providing quality sound to more people. Returning to L-ISA in general, we bring substantial improvements over what was done before, but we can’t remove some defects. The need to see the stage and the video screens for the spectators in the stands, and a certain obsession with the “speakers being ugly” on the part of the scenographers, force the systems to be moved far out to the sides and, in the case of L-ISA, to be hung very high – a little too high. A difficult problem to solve. Verticality, that is, the distance from the audience, will always be a problem. A musical where the speakers are placed very high doesn’t work as well as it should with L-ISA, but no worse than with current systems. We are simply used to it and, essentially, we will always find more defects in a new system than in the one we know. Syva during one of its first outings, in the expert hands of Alain Français, just a year ago in the heart of the Louvre in Paris. Christian Heil: No, that would be a lie, but we are pretty damned far along. We started in 2012 and we didn’t just do theory, we put our ideas into practice in the field – so L-ISA is quite ready to be marketed. The second phase, which will start in parallel, is its adoption by sound engineers. 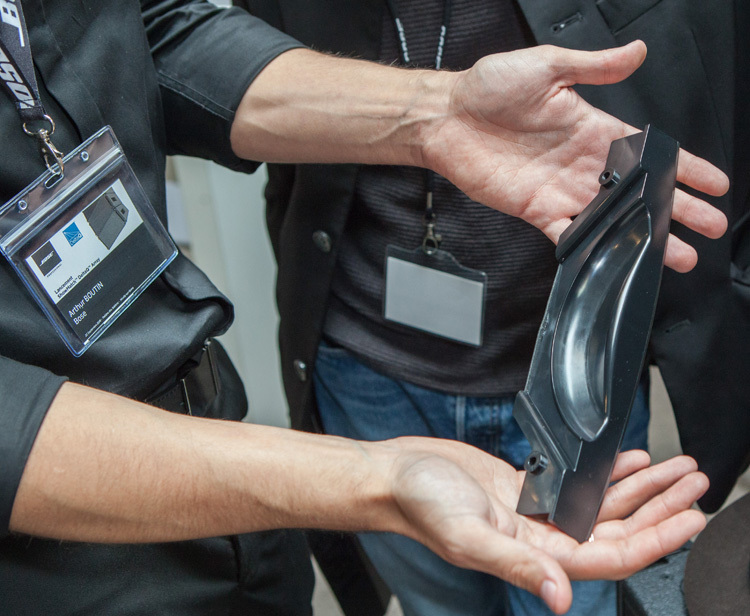 SLU: Can we say that L-ISA is the latest news from and the future of L-Acoustics? 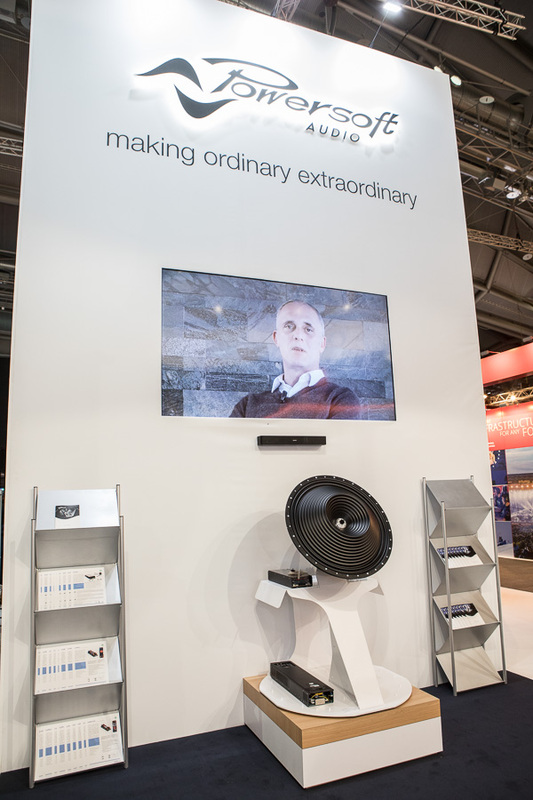 Christian Heil: The latest from the audio system manufacturer L-Acoustics is Syva. First and foremost, we are introducing a different branch in the group that deals with sound design, which focuses on what the product does when it is put into a situation and not just what it delivers in terms of coverage or SPL. 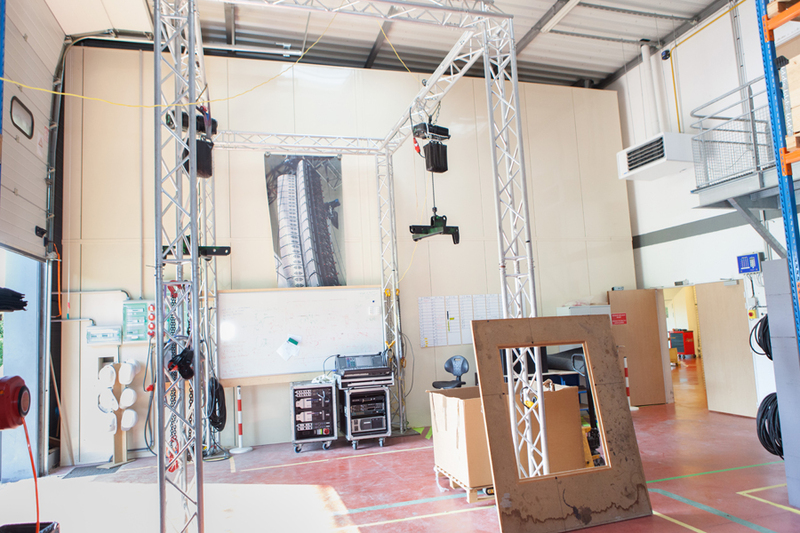 I would say that L-Acoustics is more and more interested in the application and the implementation of its products. L-ISA is at the head of what we would like to do in multi-channel FoH sound design that’s easy to deploy. In this respect, the merit of this L-ISA installation in Lille goes to Fred Bailly and Sherif. My contribution was basically the #1 and #7 boxes, the ones that extend it (he laughs!). 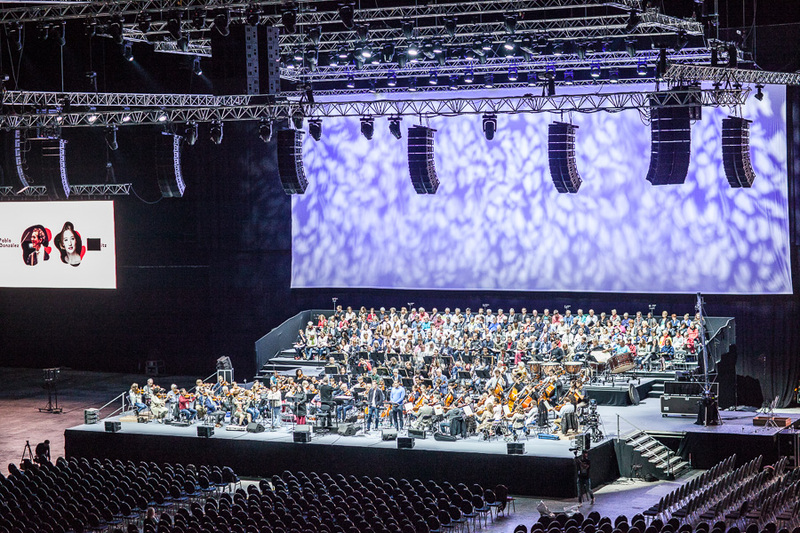 You have to cheat – stretch the orchestra to fill a room this big. The L-ISA Processor knows how to generate 32 outputs, of which six are pre-assigned to downmixes. 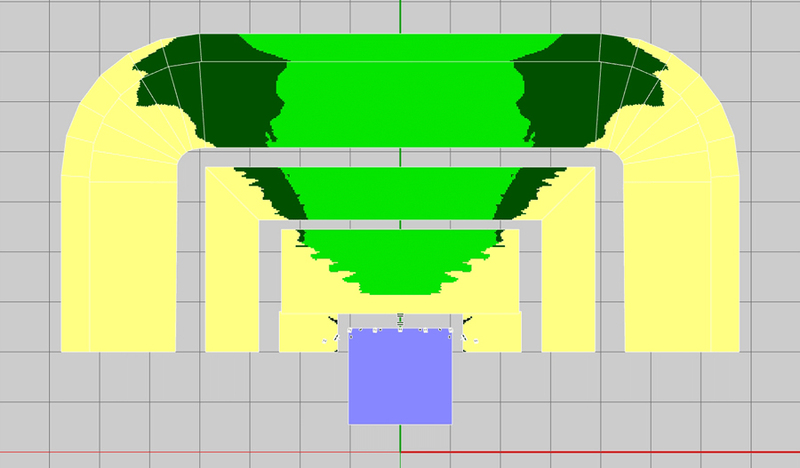 One of the flaws pointed out by Christian and visualized on this rendering, the vertical localization, namely the gap between the stage and the coverage. Note that, for many seats facing the stage, it reaches and exceeds 60°, which is too similar to a shower, and that the lip-fills provide only imperfect coverage since they don’t integrate the particular distribution of L-ISA. Christian Heil: There are four meters for a question of fluidity. There could be a little more since we are operating over quite large distances. Beyond a certain distance, the sound does not couple well between one cluster and another and especially if, for example, it is necessary to follow the movement of an artist with a tracker, you lose fluidity in the transition between the clusters and it becomes a “magnetic” effect of jumping from one to the other. It also depends on the dispersion angle of the speaker enclosures but, anyway, it is purely for acoustic and design reasons. SLU: Yet, we can open the same signal up onto several arrays via the controller! Christian Heil: Indeed, there is a mechanism in the algorithm that attempts to minimize interference issues and corrects the tone to ensure that the two systems sound like one, which is otherwise not the case. It is also necessary to do the off-axis coloration and the phase rotation to avoid interference. We spent years developing it with sharp people who listened and split hairs. The algorithm is good. What could be improved even here today is the vertical distance and therefore the realism for the front rows. The L-ISA plugin, which can be incorporated into VST or AAX environments and operates dynamically in the project and with the automation of the digital editor. This plugin then delivers its instructions to the L-ISA Processor via a simple network cable. SLU: I agree completely. The coupling and the sound in the first rows is not optimal. It is better to be further back and in the coverage of L-ISA alone. Christian Heil: Whoever invents near-fills that work and are effective for the first five rows, I’ll take my hat off to him. I attend many shows in London, where I live, but very few shows where the near field is convincing. Christian Heil: Of course. Sherif and Guillaume have worked to make this agreement with DiGiCo, and this makes the system even easier and more convenient to implement. L-ISA is an adventure that began five years ago and whose maturity will interest productions. I am not convinced that the pace will pick up all at once. It is necessary for people who have confidence in me and in the brand, and those who have power, to take the first step… people, for example, like Stéphane Plisson in France but also the sound engineer of Adèle or of Radiohead. From left to right: Christian Heil, François Gabert, Erdo Groot and François Bou, the general manager of the ONL. The concert has just ended and everyone is sincerely delighted. Let us first render unto Caesar the things that are François Gabert’s. The most perfect sound reinforcement system is not much use if one pushes it into the bizarre. Fortunately, this man is as serene and balanced as his mix. We feasted for an hour, savoring in great detail the work of Jean-Claude Casadesus and the Orchestre National de Lille. Also, hats off to the architects who designed the “showbiz” version of the Pierre Mauroy stadium. The versatility of this room is a staggering reality. Especially regarding the acoustics. The capacity, the accessibility, the rigging possibilities, but especially the solid acoustic architecture make it a remarkable venue, an Arena with a capital ‘A’. What is L-ISA? To put it simply, I would say that it is the best compromise possible in a field that is all compromises. L-ISA is the most economically viable and acoustically efficient way to obtain an immersive, coherent and spectacular sound front in terms of coverage area, frequency response, phase, dynamics and SPL. The idea and the technology behind it are not new, but their integration into a powerful processor, driven by a very sophisticated algorithm and controlled by an object controller, are quite new. When a juggernaut like L-Acoustics gets involved in a project, it’s never taken lightly, and L-ISA is no exception. Several questions then arise. Is L-ISA good for everything? Theoretically, yes. Offering a vast sound field and precise localization of sources to more than half of the audience, and in some cases even more, it is good for all applications and musical styles. In addition, the simple and remotely controllable management of objects, which can also be automated, opens up an infinity of creative possibilities. Faced with soloists that were too bright, too forward in the mix and probably too “amplified” sounding, François Gabert, for example, made the choice during the concert to move them back in space, a simple way to make them blend more into the mix and give them more authenticity. L-ISA is a key that technicians, but also artists, can appropriate. Let’s not forget that it was through the influence of Pink Floyd that quadraphonic sound existed on a large scale. Kiva II, an enclosure that can be found often in L-ISA deployments. Passive, 16 ohms, 138 dB SPL max, all in a 14 kg cabinet and with 100° dispersion. Can L-ISA also excel in styles that are demanding in terms of speakers and SPL? Once again the answer is “yes”, taking advantage of the enclosures already in the catalog, but it would probably be even easier with a dedicated model: a speaker enclosure with specific forms and specific functions able to reproduce, with modern power and dynamics, the spectrum from 100 Hz to 16 kHz, with a very wide dispersion and maybe adjustable waveguides, a speaker able to deliver more SPL but with a limited number of boxes, in order to facilitate its visual integration. 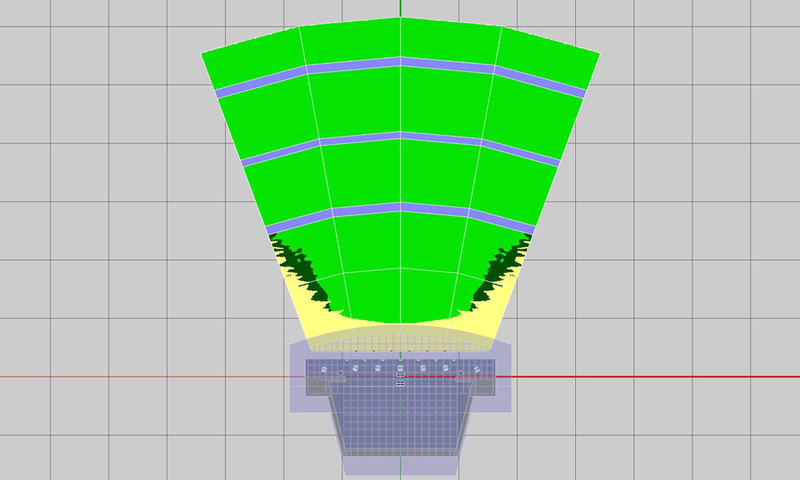 Finally, it would have to be an enclosure with a cardioid dispersion to allow it to be placed vertically, without the risk of impacting the stage, which would offer a wider L-ISA coverage and which would also serve the front rows. A punchy and modern enclosure that would help sound engineers get away from such a monophonic vision. What is true for the high end is also true for the low end of the spectrum. For the lows, it would ideally be a very powerful box, combining bass and sub reinforcement, able to fully reproduce the first two octaves with a native cardioid directivity, in order to concentrate a factory of bass in a small and central space. Is L-ISA creative and easy to use? The answer to the first part of the question is clearly “yes” but, even more, it is also a mixing tool in its own right that has its place in a console and not just relegated to its screen and mouse. 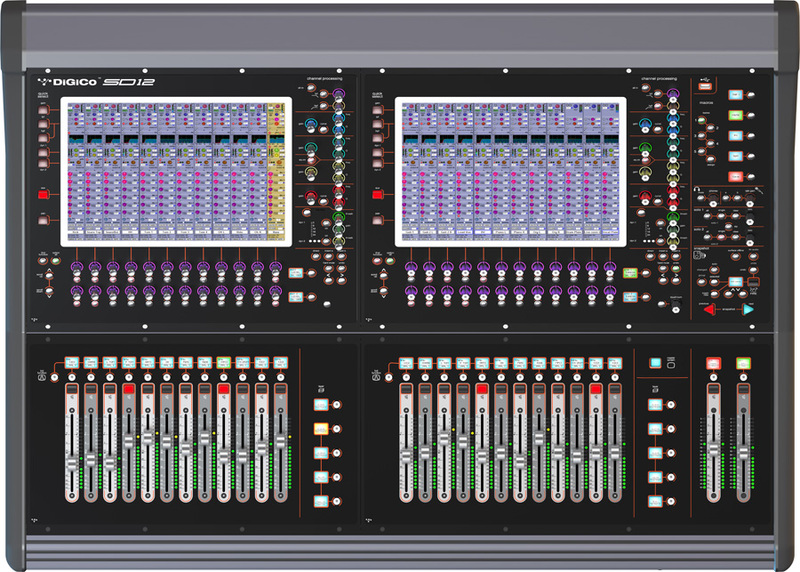 Its integration into DiGiCo consoles will be very beneficial and should be emulated. Simple to use… maybe not if you are on the design side. 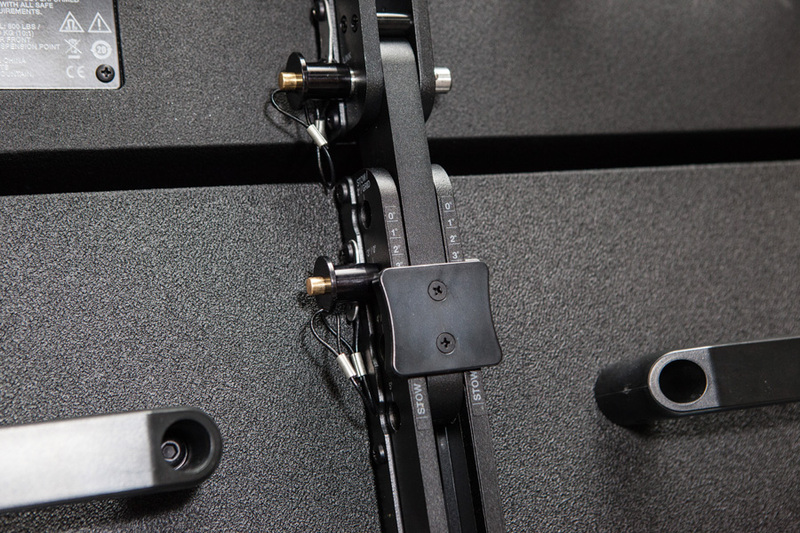 The need, for example, to concentrate the bass cabinets in a single point makes it difficult to deploy outdoors or anywhere there are problems with rigging point weight limits. It will also take some time for the sound engineer to get a feel for the set of speakers and their layout to open their mix and, especially, to understand that we must use more enclosures to get the pressure that any show requires. Does L-ISA sound good? Here the answer is once again “yes”. The strategies deployed within the processor make it possible to combine the same signals as constructively as possible in two or more spaced lines. It isn’t obvious on paper. Yet it works much better than what is currently given by two main line sources, which already don’t love each other very much, and to which we add the down-fills, out-fills, lip-fills, front-fills, the flown bass cabinets and the subs on the floor. Let’s be honest. We are used to it, but it is very often “interferenceland”… So yes, sometimes we perceive some artifacts, but the whole is infinitely more faithful and generous in coverage and audio quality than the usual left/right. A 4000-seat amphitheater, the perfect place for L-ISA. 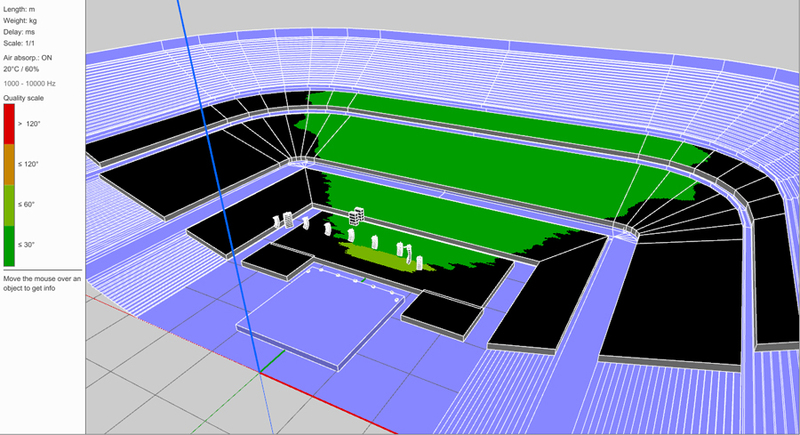 Here the left/right version with 12 K2s, providing a comfort zone to 25% of the audience. The same shed in Santa Barbara, this time with an L-ISA deployment of five Stage arrays of 12 Kara each and two Extended arrays with eight Kara each. The comfort zone reaches 87% with a true spatialization. Finally, is L-ISA a good answer to the new standards for levels? Without hesitation, yes. By the fullness of its performance at reasonable pressures, and by playing away from the audience with a single group of point-source speakers the part of the spectrum that has just appeared on the screens of analyzers henceforth touchy to dBC, L-ISA will feast the public, as well as the public authorities. In fact, the Requiem at its magnificent fortissimi reached only 98 dBA and just above that in C-weighted. At 4 dB from the limiters. Another advantage that makes life easier for the mixer is that the output at FoH is not boosted +6 dB as usual, since heads as well as subs distribute the SPL better. In fact, we could start asking ourselves a simple question. What if left/right is a thing of the past? 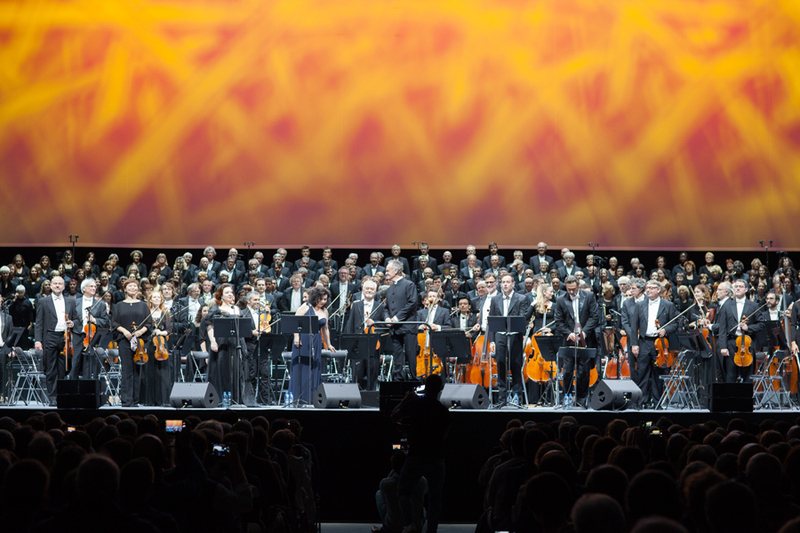 JJean-Claude Casadesus and the Lille National Orchestra. 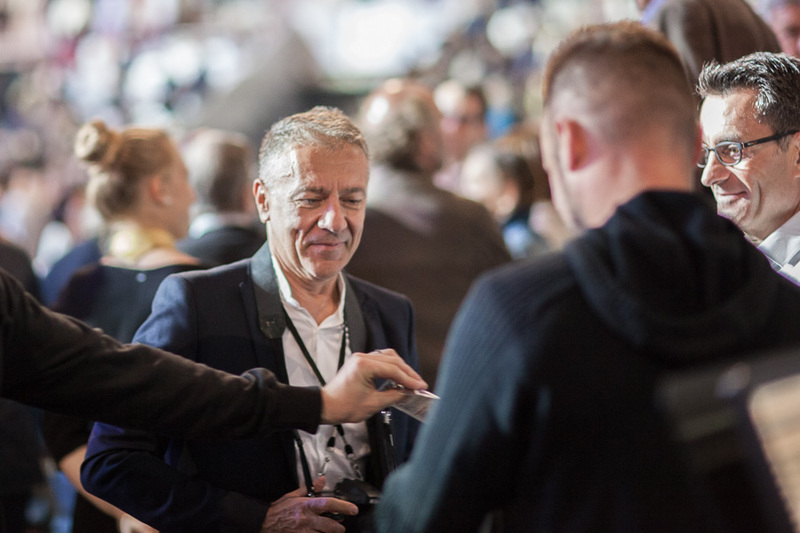 Present at the Pierre Mauroy stadium – and as sought after as Christian Heil – was Guillaume le Nost, head of R&D at L-ISA, who answered our questions as well as he possibly could – not that he doesn’t know, but that he knows too much… far too much. Guillaume le Nost : We try to make it easy to use, without too many configurations while, at the same time, there are enough possibilities to let the user achieve his goals. All of this is done within a framework of design rules that are put in place and refined with time and experience. The fundamental principles of the algorithms are established and validated. Up at the top it’s good; what about down below? SLU : Will the algorithms allow a smoother transition between the flown system and the various reinforcements on the floor? Guillaume le Nost : Unlike some other multichannel systems – which have algorithms that are very well adapted to fills, but less to main systems – we took a somewhat opposite approach by throwing all our efforts into the main system. We have plenty of ideas for everything regarding the fills, but we can’t forget the old saying “the best sound comes from a single source”. We know it and we see it very clearly in simulation and measurement, the addition of speakers immediately degrades the performance of the main system. Guillaume le Nost : We know that and we’re working on it. L-ISA is anything but fixed and will continue to evolve. The platform is very scalable and, without any problem, we can make improvements without changing the hardware. A view of the KIVA II lip-fills with the difficult task of coupling in phase with the flown system, as well as in tonal and impulse response. SLU : Wouldn’t it be possible to do better than mono for the fills? Guillaume le Nost : This room is large and therefore begs the question: what sound-image width do we want to have in relation to the visual width. Typically, we could have started deploying multichannel fills here. We have LCR downmixes, which could, for example, have been used for the flown laterals, but with two constraints. The more points of diffusion we hang, the more it pollutes the reproduction – this is true in all designs and we don’t pretend to have a magic wand that will fix it. Plus, it increases and complicates the installation. Our mission is to provide sound to 100% of the audience while maximizing the L-ISA coverage zone. Whatever happens with the fills, at the very least, we are at the same level as what is done traditionally. Guillaume le Nost : Exactly. It wouldn’t necessarily be coherent, being 80° off the side of the stage, to have a spatialized sound image. No doubt, it could work for a musical, much less for rock. A view of the stage during the rehearsals. The L-ISA zone is large, but the organizers also need to study a way to offer even more seats facing the stage and fewer on the sides. SLU : Is L-ISA rather conceptual and open, benefiting from the development cycles of any manufacturer? Guillaume le Nost : Of course. We are working on a pipeline of features that we will keep us busy in implementations over the next two years. Our job is to prioritize which features will be the most important and fastest for users, so we are constantly listening to feedback from the field. As a result, the product has evolved significantly over the last 12 months, with the improvements being developed very quickly. SLU : You mentioned a very small team… how many of you are there? Guillaume le Nost : There are six of us in R&D, plus Sherif El Barbari and Christian. We also have a team dedicated to Private applications, namely the design and installation of exceptional private facilities. SLU : I imagine that the difficulty in this, apart from the legitimate cost of such a private installation, is having the discrete sources to be able to exploit it fully. Guillaume le Nost : Think again (he smiles). We are experimenting with a lot of. I can’t say any more, but I am confident that, even in residential installations, it will be possible to have fun with L-ISA. We already have upmix solutions to convert from stereo to more channels. These are very convincing, except perhaps with classical, and can be heard in our showroom London. L-ISA has huge potential, even in residential applications. SLU : Tell us about how L-ISA was born, from within? Guillaume le Nost : It started from a three-person team in a small space next to the warehouse in Marcoussis, where we spent a lot of time, a whole lot… (he smiles). SLU : And commandeered a package of Kara! Guillaume le Nost : We’ve definitely got the full support from within the company in general and from the applications department in particular. L-ISA may not be appropriate for all applications or for certain aesthetic choices of shows. We are used to hearing rock shows with two big systems, it will take time to change the situation. We will have to mix while asking ourselves “how do I use the natural properties of the brain to distinguish different sources in space”. These properties are usually very under-exploited in sound reinforcement, yet they work very well. 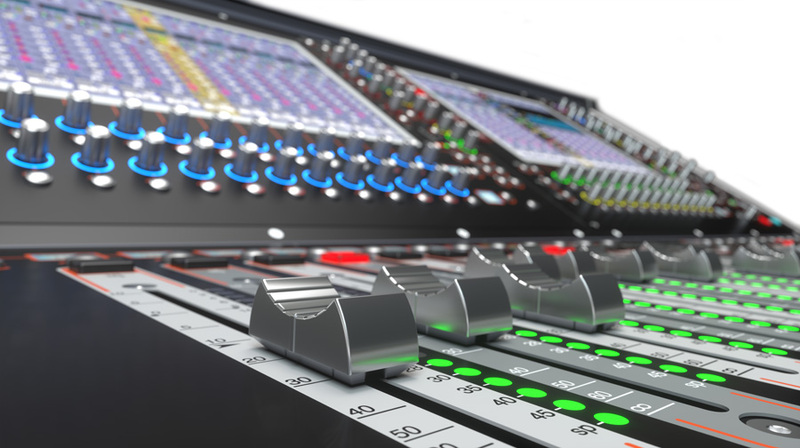 Some sound engineers, who have tried it, almost no longer touch their faders since, spatially, we localize the instrument without the need to highlight it by level or other means. L-ISA. Controller or mixing console? 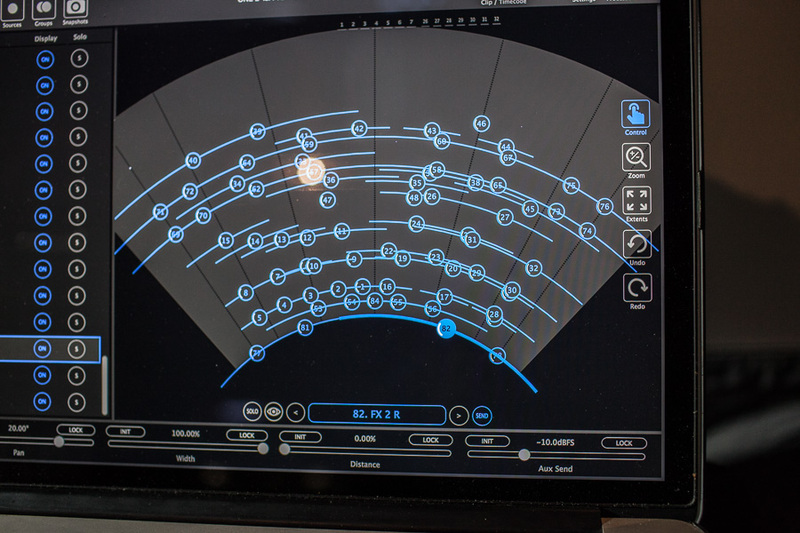 A view of the L-ISA controller with the points highlighting the different microphones picking up the choirs. This automates a number of functions, such as “width”, the width of the sonic image of each point, or “distance”, the distance of the sound from “behind” in the mix determined by its attenuation in level, its brilliance in the high end, and the increase of the amount of reverb compared to the direct signal. It is therefore quite easy to intervene creatively in the mix. 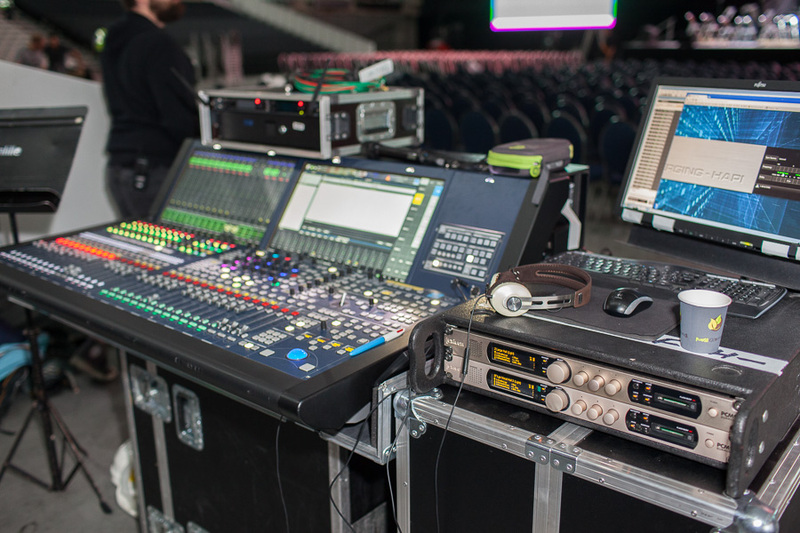 SLU : How would you reinvent the mixing console for L-ISA? Guillaume le Nost : For us, the L-ISA processor is just a spatializer. All the functions of a mixing console – EQ, gain, dynamics and effects – remain fully relevant and necessary, but inside the console. SLU : But, for example, couldn’t the linear faders become knobs and leave this space for functions specific to L-ISA? Guillaume le Nost : Yes, for example it would be convenient to map the distance function of L-ISA onto the faders. We are currently working with DiGiCo to integrate and map the controls. We are in the testing phase and, by the end of 2017, DiGiCo should release an update with a L-ISA mode for the entire SD range. It turns out that we chose communication protocols that are very similar, so the link is natural, especially since both teams are based in London. 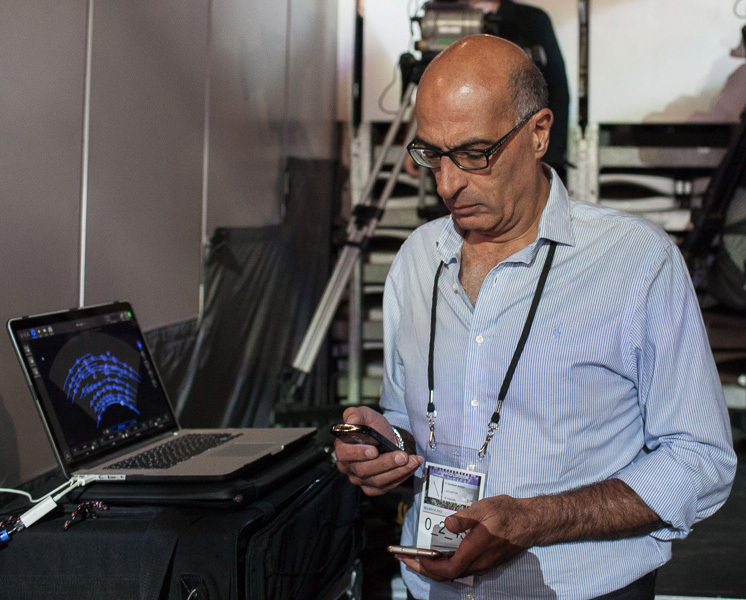 Sherif has always had a good connection with DiGiCo. SLU : Could you give some examples of functions that will be integrated into the console? The implementation of L-ISA on a DiGiCo console with the specific controls immediately available. Guillaume le Nost : For each channel on the console, the user will be able to operate in normal mode, with a pan, or in L-ISA mode with, in the small slice of screen, a small object that can be directly controlled with a zoom. All the parameters will be directly accessible, the pan, the width, the distance and the elevation, plus an output dedicated, for example, to the sub or, if you choose, to drive the outfills from this auxiliary. It will be possible either to drive the subs individually from this output or to select the outfills. SLU : But what do you manipulate, the groups or the channels? Guillaume le Nost : We started from the idea that “1 input/microphone = 1 object”. This provides perfect and very direct control, and the visualization will be very elaborate, without the need to go look on another screen – our controller screen – except when you want to have an overview of the signals in the space. Guillaume le Nost : Ideally we would, but it would require integration of the L-ISA controller software into their console. For now, we have chosen to integrate a kind of small L-ISA plugin in each channel. SLU : Who controls the movements of the objects? Guillaume le Nost : First of all, we put the package on the movements to provide flexibility and ease of implementation. For example, movements can be implemented over a network, and not just simply within the controller. 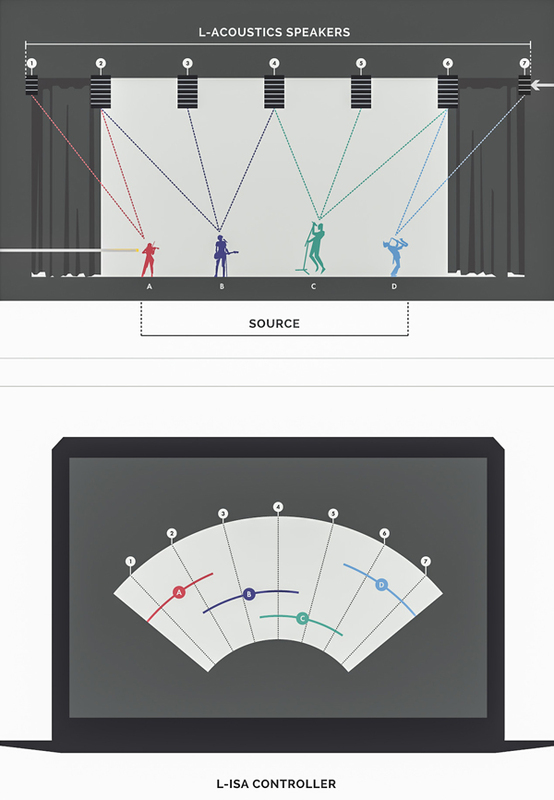 You can have musicians on stage that trigger interaction sequences via a dedicated plugin. Working with objects greatly simplifies the use of spatialization, since the position of these objects and the diffusion configuration are completely independent of one another. SLU : Is the movement of objects – which requires a lot of processing resources – limited in speed or number? I’m thinking of an artist who would be given this command and who would make a very intense use of it. Guillaume le Nost : We’ve anticipated everything and conducted a lot of stress tests. We have crossfade times that make moving from one situation to another very smooth. A sort of a compromise between precision and absence of clicks. Guillaume le Nost : Yes, this is one of the latest features, where we achieve truly 3D setups. L-ISA is much more flexible compared to Atmos – which is nothing more than 7.1 plus a few objects that move, which also remains formatted for cinema and designed for rooms with well-defined shapes. 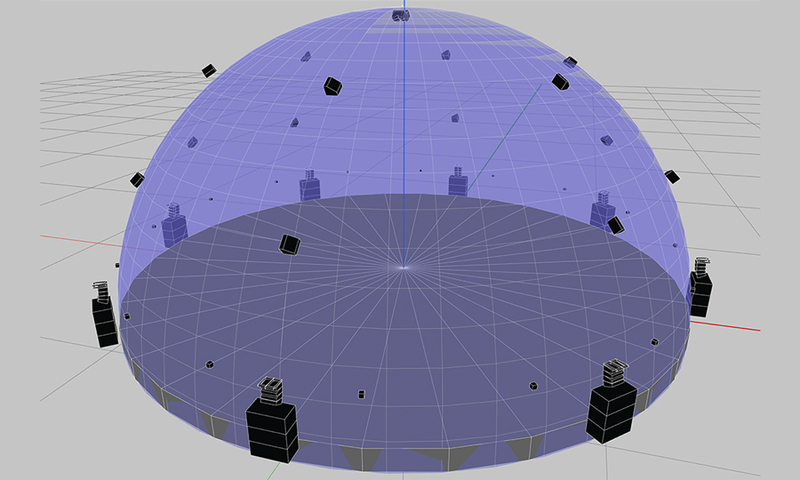 The 360° L-ISA installation with many elevation points, installed for the LAB, a domed venue at the New York Panorama Festival. We can go from a very limited and very simple flat deployment to what we did this year for Coachella: a half-sphere like the Géode, but much larger and with countless video projections. 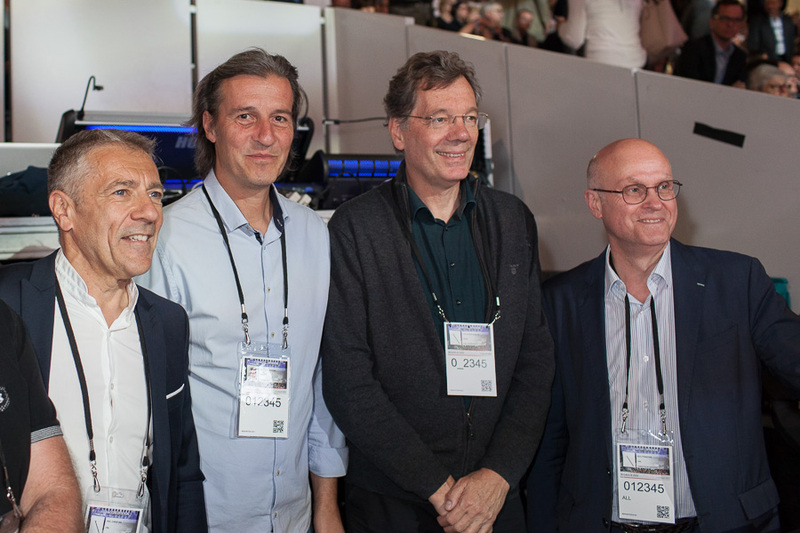 Guillaume le Nost : Here, instead, we wanted to achieve an L-ISA Live reference deployment, with a guarantee of results and respect for the sound and the audience. We’re looking to achieve a qualitative standard, but creative designers are also interested in the possibilities offered by L-ISA. This is the third applications branch called Creative – after Live and Private – and it will include museums, events and contemporary art, for example. The users love the workflow based on objects, since the design and pre-production phase is facilitated by a configuration, for example, using nine points, before switching to 20 points, simply changing the setup of the speakers. An isometric view of the L-ISA installation at Lille. To allow the ONL to discover the principle of hyperrealistic immersion, small stacks of three Kara each were placed in the Nouveau Siècle auditorium, the resident hall of the Orchestra, for a full-scale test. 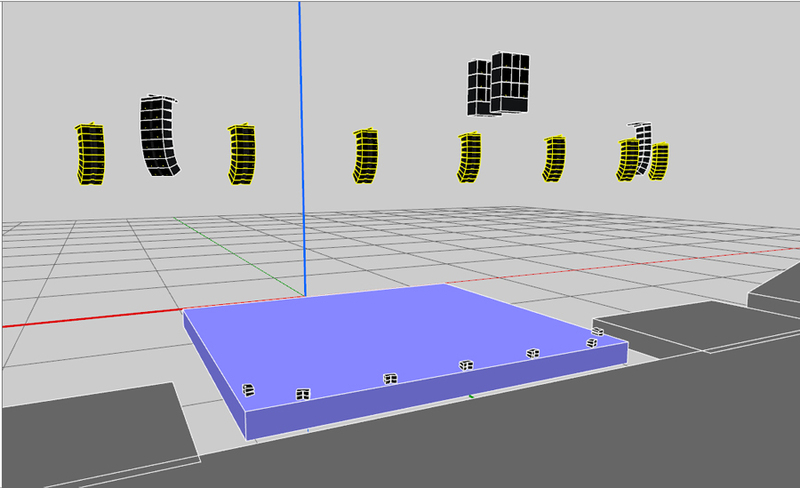 You can simulate a 360° space in the studio and work on spatialization with only four points. You will have more precision and latitude of movement in the final system, while a four-point deployment only works if you are right in the center. 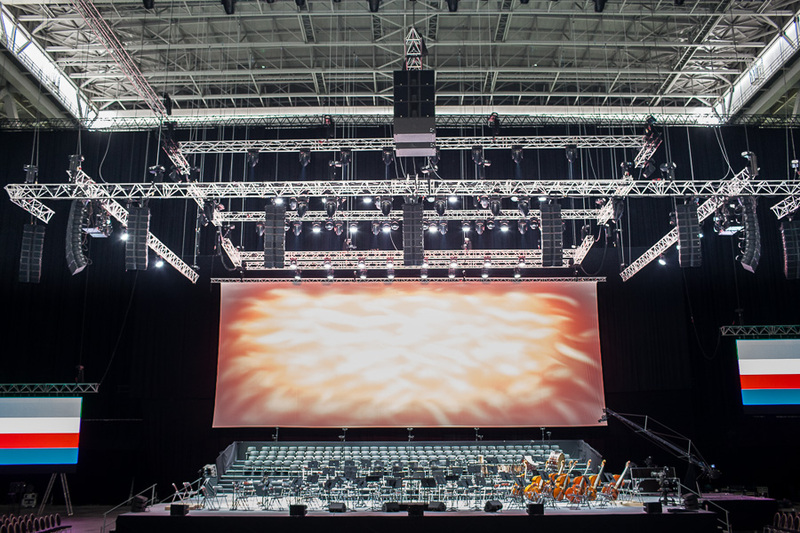 L-Acoustics’ advantage is also the know-how in large scale installations. It’s not just about coming out with a clever processor, but about setting up rules, training and supporting users so they can benefit fully from its advantages, especially in Live. Guillaume le Nost : There is no formal, planned training at the moment but, of course, we train all those who will be working on L-ISA configurations. At the same time, we are developing a specific training center, especially since it is an aspect that is very important for Christian and, on in addition to knowing how to operate the controller, the sound design of the system must also be understood. A new way to conceive mixing. The singer (green) will be amplified by three arrays – 4, 5 and 6 – and this is shown on the controller screen where the green object ‘C’ has a “Width” that extends beyond the three lines representing the three arrays of speakers. He will also be in the foreground. The other musicians will be reproduced by other arrays and also by those that amplify the singer. Remember that the seven arrays each open at 110° (or more with Syva enclosures) and overlap. Guillaume le Nost : Mixing is quite simple and intuitive. I think that we’ll start with the training on the deployment of the system, especially since this is where we can do instructive demonstrations for touring system engineers, installers and decision makers, and we will show that L-ISA is no more expensive than a traditional system, only a different logic of energy distribution at equal SPL. I am also convinced that we have to forge closer links with sound schools to reach younger generations, who are more flexible and open to new things. SLU : Do you think we should also talk about sound aesthetics? Guillaume le Nost : Actually, it’s essential that we do. 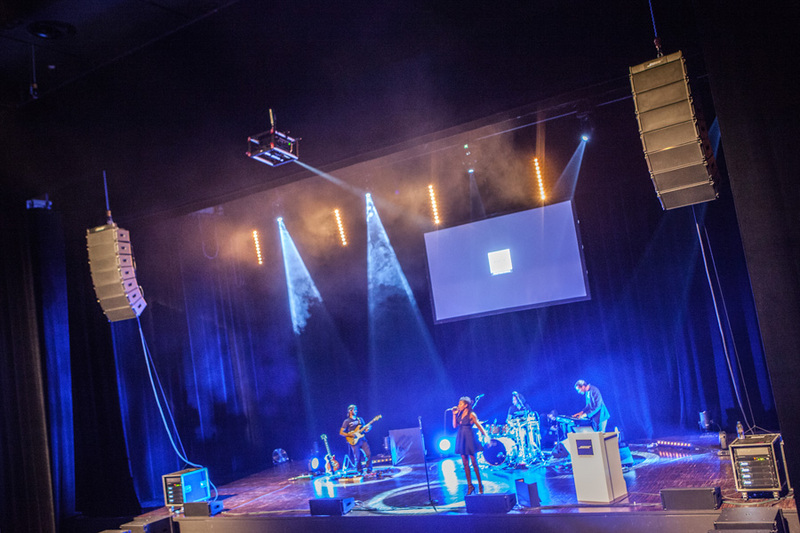 With L-ISA we can localize the amplified source directly above where the acoustic one is visually, which generates a result that is both natural and transparent, but we can also choose another path, where the sound becomes immersive and localized off-stage. We can oscillate between an aesthetic that is almost imperceptible to another that is obviously very amplified. 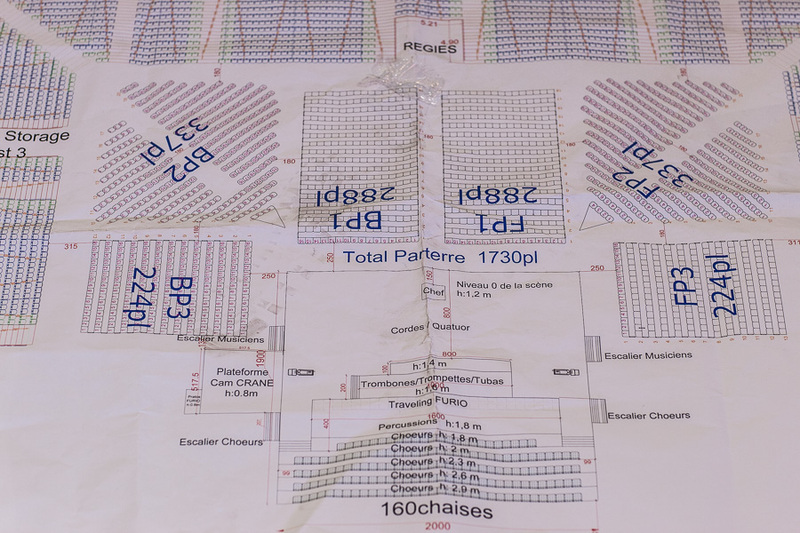 Or, we can perform technological feats that go almost unnoticed, like in the show “Le Dernier Panache” at the Puy du Fou theme park, where the scene turns but the sound remains with the audience, thanks to the use of a grandstand tracker and 24 active channels. The funny thing was that, on the first day, we had a bug that turned the system in the opposite direction of the scene. It was a sign problem in the code that we settled in less than half an hour (he laughs). Guillaume le Nost : We have very high level parameters in the software to define the sections of the space that will contribute to this signal, in order to preserve temporal alignment with the heads. If a source is completely in the back, it will not be at all in sync with the sub, and we may perceive two sounds, which can be disturbing. For example, you can decide that only the frontal sphere contributes to the sub, and the setups will manage this in a very gradual way for the group of objects. We try to limit the number of parameters for each object, since they multiply the number of processing channels by 96 each time. A pop/rock application of L-ISA, on the Renaud tour. Number 19 is the “Renaud object” (I don’t think he would like being called this – ed. ), placed alone and completely in front of the others. Behind him, we see the different stems. No Pan and very little Width. Notice also how Madje (Malki, FoH for Renaud – ed.) made the choice to modify the spatialization for each song. SLU : On the other hand, you don’t change the spectral response of what goes in the background. The sound will then be clean of any sub contribution and will “resume” when it comes back into an acoustically compatible area. Guillaume le Nost : That’s a choice. We don’t know if this is the best approach, but it works well. Guillaume le Nost : In rock, we don’t necessarily want to correct the space, and this control is not an aesthetic reverb. We conceived it as a tool for merging the system into the global space. This is not very interesting in reverberant rooms but, for example, here in Lille it works well, and François makes very good use of it. It works on the parameters of level, EQ and the ratio between direct and reverberant fields. SLU : Are stereo and LCR downmixes mono-compatible, and is the phase of this little world clean? Guillaume le Nost : Absolutely. We worked a lot on the phase, especially for the main system where an object can be very punctual in one array – and therefore present no danger – but can also be extended and therefore reproduced by several points of diffusion. For this we have our internal recipes – algorithms with a philosophy that has guided all our choices and with the priority to preserve the impact. We have tried different strategies of spatialization, and the one on which we concentrated the most maintains this impact and the line array effect to which all our clients are accustomed. The L-ISA Processor or, more prosaically, the core where 96 MADI streams are processed and redirected to 32 outputs, still in MADI. The rest is hush-hush and buttoned lips. One system is very coherent and, as soon as one expands into the two adjacent ones or beyond, there are no problems or very few. We minimize them. This is one of the successes of this development. We spend our time asking ourselves what is gained in becoming more complex and what do we lose by keeping it simple. SLU : The choice of 96 in and 32 out – of which 7 are dedicated – was this easy to make? Guillaume le Nost : We thought about this a lot. There are other products on the market that are 64×64 but, as we want to push mainly live applications, we prefer to process more sources and limit the diffusion points, the latter of which also require a lot of time and financial means to implement. Also, putting out a lot of sound, for example in the rear – let’s say 16 points – is not rational because the people in the near field will perceive a high level, but those in front of the stage will have too little. We really want to rationalize multichannel design and, seeing where we want to hang them and how we want the diffusion points to work, we can’t go beyond 32. SLU : Yes, but we both know how the customers are. Will it be possible, if necessary, to link two processors? Guillaume le Nost : We can imagine a lot of things having more inputs or outputs. There is now a version of the L-ISA Processor for Creative applications that offers 96 inputs to 64 outputs. SLU : We understand that you have limited the operation of the processor. Is it therefore not possible to make it sound bad? Guillaume le Nost : Insanely bad, no; we have been quite restrictive on this point. The strangest thing one can do is open a source to 90°. That’s wide, but we did not want to go, for example, to 360°, although, technically, the algorithms would allow it. Enlargement in width is the most complicated function in terms of calculation. For the time being, it is preferable to limit this possibility in order to guarantee the most qualitative operation possible. A Renaud tour date with a large number of Kara in five flown arrays. 11 each in arrays 1, 2, 4 and 5 and 13 in the central one dedicated to the voice and, habitually in rock, to bass and drums. These habits will evolve so as not to limit the surface of the membranes moving the air and, therefore, the SPL. SLU : But you have to know how to “open” your sources to take advantage of the speaker configuration the device is driving, and exploit the theoretically available SPL. The drum set can’t come out of only the center array or from the one corresponding to its location on stage. Guillaume le Nost : I see you have understood… hence the need to rethink one’s mix for a certain configuration of speakers and no longer just for a simple left/right. If we hang clusters, it’s so that we can use them. This is an important point. SLU : What ratio of SPL increase do you achieve by using more than one array? Guillaume le Nost : I don’t have the formula memorized anymore but it is written down. SLU : Is L-ISA a possible answer to A/B sound designs for musicals? Guillaume le Nost : : I am convinced that it is a solution for A/B design. This does not solve the problem of elevation (which also exists in A/B – ed.) but for all the interactions that led to the adoption of that method – which is rather bulky and constraining to implement and control on a daily basis – L-ISA is a solution. We are currently working on this issue specific to musicals but natively, if each microphone feeds one array, the question of comb filtering is settled. However, we can do even better (and his eyes sparkle- ed.). 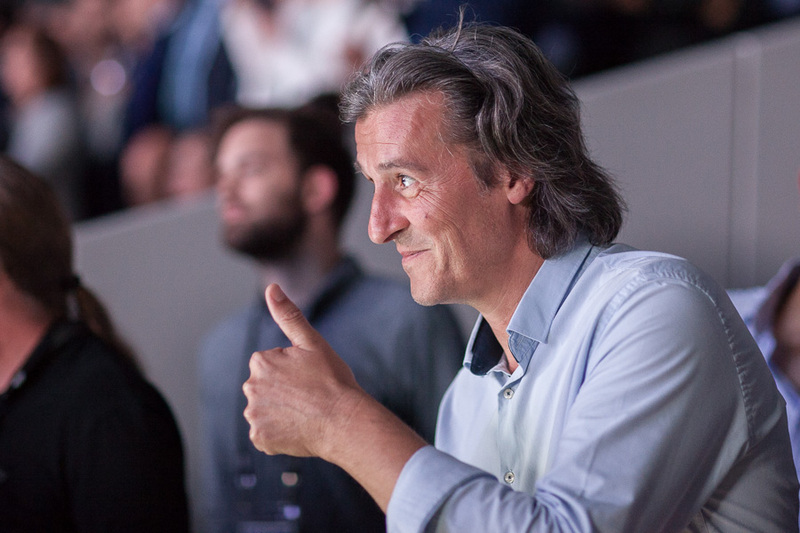 An excellent salesman of concepts as well as creator of them, Guillaume le Nost, at P. Mauroy stadium. SLU : Is L-ISA a system whose time has come? Guillaume le Nost : Clearly. We listen a lot to binaural headphones. Virtual reality is here. Surround and Atmos are becoming more and more popular. Consequently, listeners have expectations that change too, especially when we look at the price of a show. We expect a higher quality sound experience. There is, of course, an SPL below which people do not have fun, a “physiological” rule that we will not bring back into question, but between this level and 10 dB more, we prefer to propose something more interesting and creative. SLU : You seem passionate about L-ISA. Guillaume le Nost : This is a very interesting project that touches a bit on sound design, that calls for the ideal speaker enclosure for this mode of diffusion, that requires changing mixing habits… there are very complex themes for which there are still plenty of answers to find. Here ends the second part of our report on L-ISA. 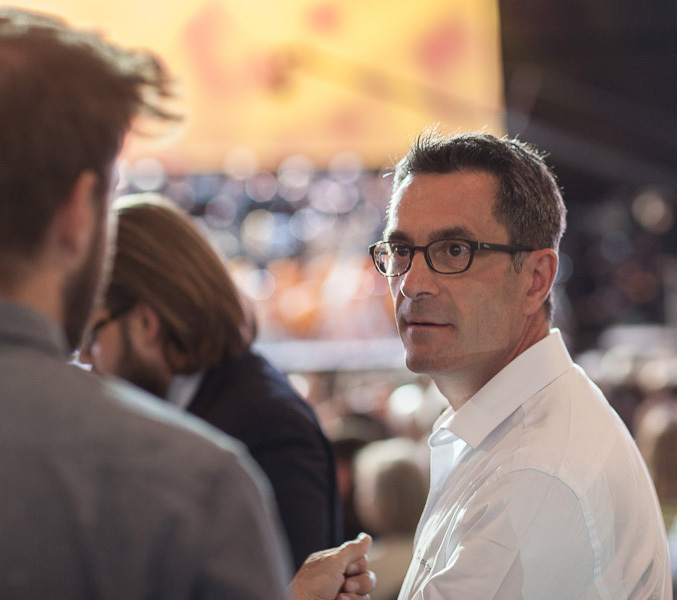 If you missed the first, see the link here..
Dulcis in fundo, we had the pleasure of interviewing Christian Heil, with his exciting and uncompromising analysis, explaining why audio must evolve and offer more and better to take back its importance. Like, for example, L-ISA. See you soon for this third and last part. The orchestra and choirs during rehearsal, nearly 300 artists for a masterful opus. L-ISA, Immersive Sound Art is Christian Heil’s latest sonic undertaking, with which he intends to restore the nobility of audio, the link between the artist and sound reinforcement. In this three-part report, we discover the innovation of L-ISA and its great potential. 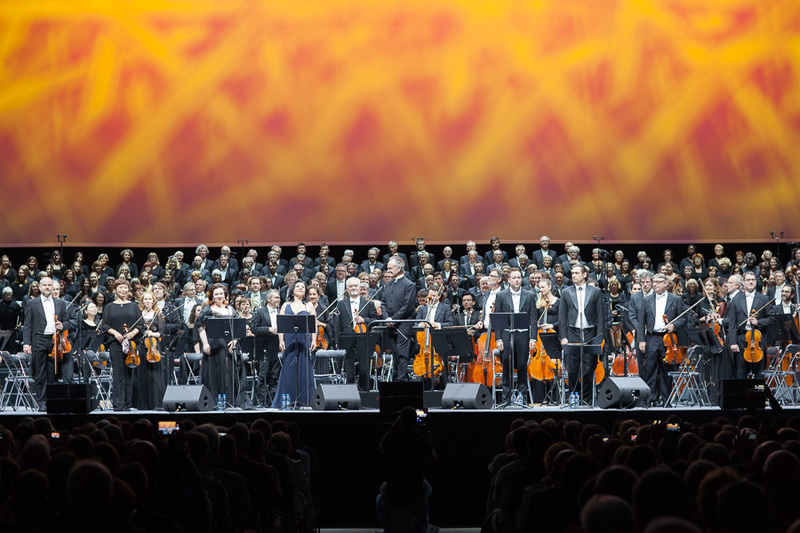 Verdi’s Requiem, Jean-Claude Casadesus and the Orchestre National de Lille (ONL), and Lille’s Mauroy Stadium served as a showcase for L-ISA, the new multichannel system driven by the L-ISA Controller. We had the pleasure of exploring this system during a long day of listening, interviews and informal exchanges – each of them fascinating – with ONL management and sound and the L-ISA team, including an appearance – rare enough to be worth the trip – by Christian Heil. 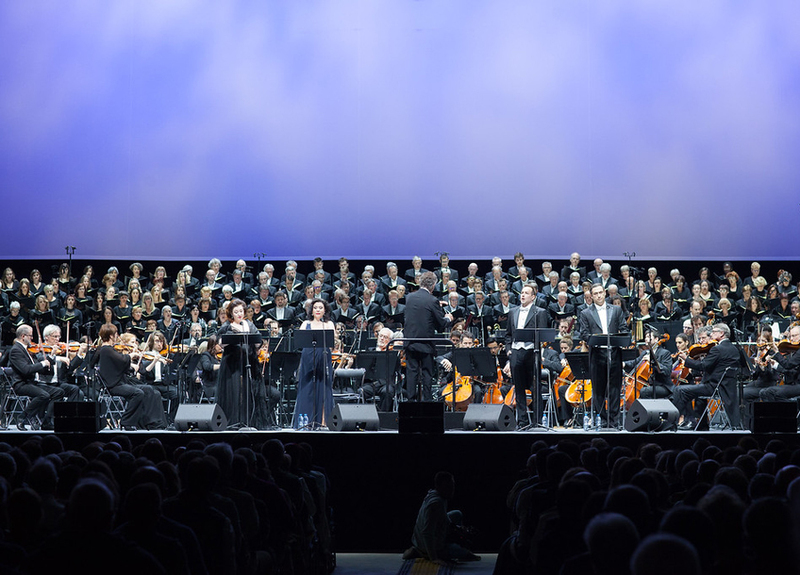 The team who brought color back to Verdi. 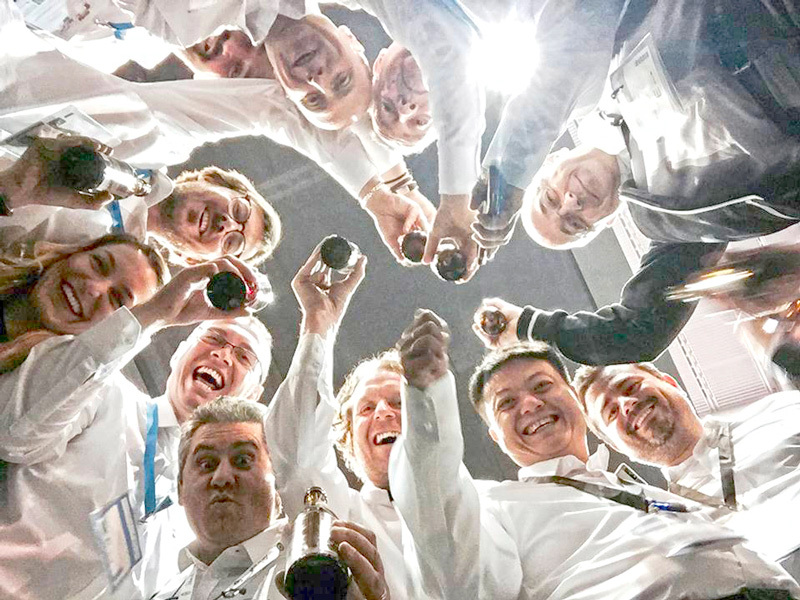 From left to right: William Duvet, systems engineer and liaison between ONL and L-Acoustics; Guillaume le Nost, L-ISA head of R&D; Fred Bailly, applications engineer, touring for L-Acoustics; Christian Heil, founder and president of L-Acoustics, father of coherent wave fronts etc, etc; Sherif El Barbari, head of application at L-ISA; François Gabert, sound engineer for ONL and mixer for the Requiem performance; Erdo Groot, producer and classical sound engineer in charge of following the score with François; and finally Stéphane Evrard, technical director for ONL. 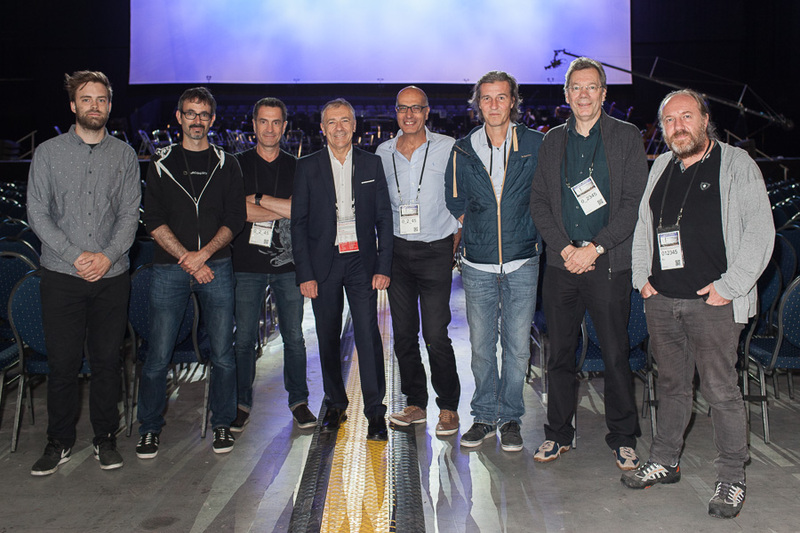 The first, here below, deals with the specific implementation of L-ISA for this event, talking with the users Frédéric Blanc-Garin and François Gabert, sound technicians for ONL, as well as William Duvet, who served as the facilitator between L-Acoustics and ONL. The second part features Guillaume le Nost, head of R&D at L-ISA, a person whose talent and skills shine like a well-lit disco ball. Finally, the third part is dedicated to Christian Heil’s interview and our conclusions. Three installments to help you know everything about sonic hyperrealism technology that could put a nail in the coffin of good old left/right. The location is magnificent. Imagine a large, covered football stadium with 50,000 seats. Take the turf off the playing field, lift it, and slide it over the other half of the field using machinery that is as improbable as it is hydraulic. 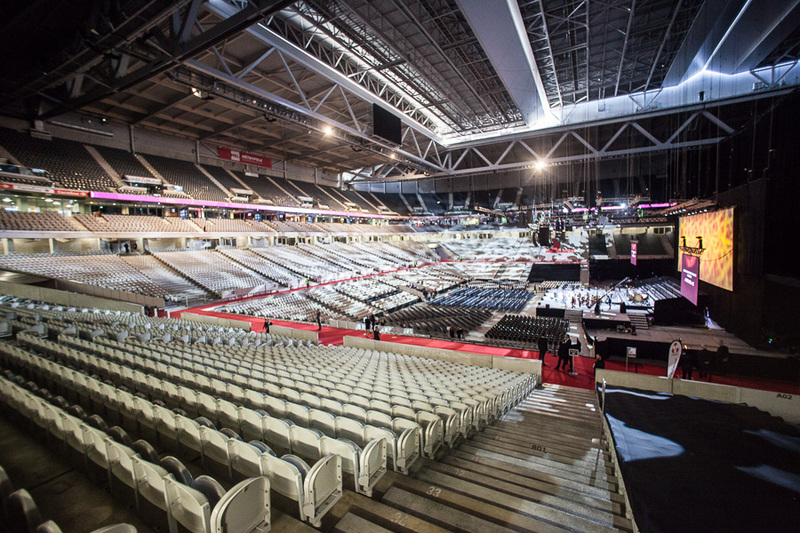 Deploy a heavy hanging partition to divide the two huge volumes, magically conjure up some new retractable grandstands, and you get the “arena configuration” of Pierre Mauroy Stadium. 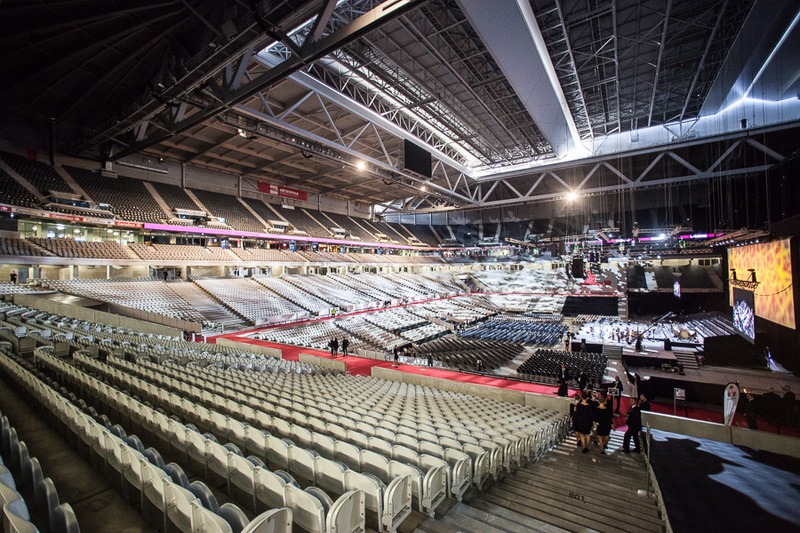 25,000 seats – a total success with good, viable acoustics, plenty of rigging points, and a concrete floor ready to load everything in. When we arrive in the morning the rehearsals are already in full swing, which allows us to understand the wide coverage area of the L-ISA deployment and how the K2 side hangs and the Kiva covering the first rows would behave with the inevitable zones of interference. We’ll come back to this later, but now, let’s take a moment to tip our hat to François Gabert, at the helm of the Lawo mc²56. Between the morning rehearsals and the evening Requiem – a unique piece, uninterrupted and without the slightest pause – his mix went from shadow to light. Enthralling. A quick reminder that the ONL is well and thoroughly equipped with Lawo consoles and Neumann, Sennheiser and Schoeps digital and analog microphones in order to be able to record its work. Two mixers reside in ONL’s home auditorium, ‘Le Nouveau Siècle’, in the heart of Lille, and it’s is only natural for them to be here in the Pierre Mauroy Arena for this concert. 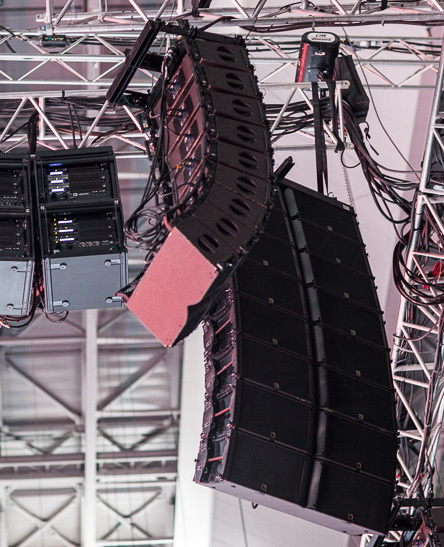 The L-ISA system comprises five arrays spaced above the stage, with two additional extension arrays flown outside of the stage area. Each of the seven arrays is composed of nine Kara which are reinforced by a single central point of subs hanging vertically above the first rows, consisting of two arrays of four KS28 each, in cardioid configuration. 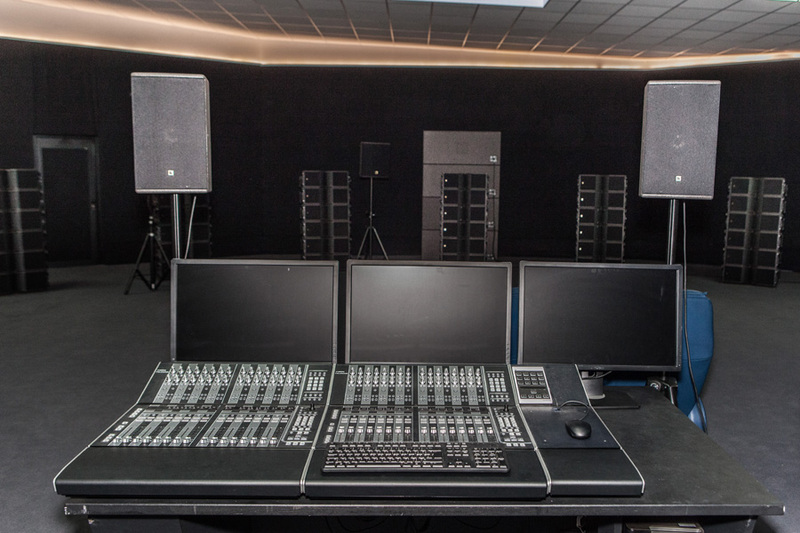 The L-ISA system and its seven arrays of nine Kara each – 63 speakers in all – reinforced by a cardioid array of eight KS28 subwoofers and, finally, by two side hangs of eight K2 each, one for each side. The amplification, at least in part, is flown close to the systems. One of the LA-RAKs is the “II” version and includes three LA12X amplified controllers, which are essential for the KS28 units. Knowing the power of the KS28 – which the manufacturer rates at 3 dB SPL more than the SB28, but when driven by the LA12X gives much more, not to mention its dynamics – we will not be left wanting for the bottom end of the spectrum. 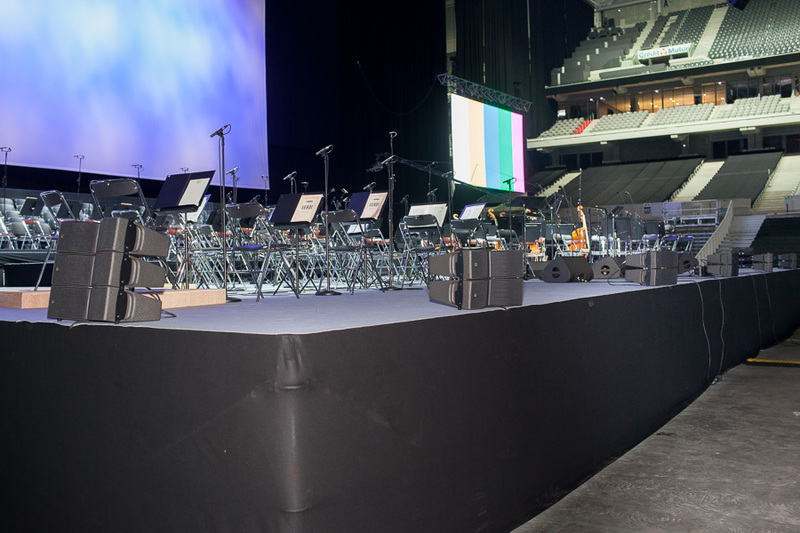 Two arrays of eight K2 each, one left and one right, provide the connection between the edges of the zone covered by the L-ISA system out to the last seats perpendicular to the stage – seats which will enjoy only a good monaural sound. On either side of the L-ISA deployment are four LA-RAKs, including an LA-RAK II for the KS28. The amplification for the front fills and side hangs, as well as for the monitors, is deployed on the floor. 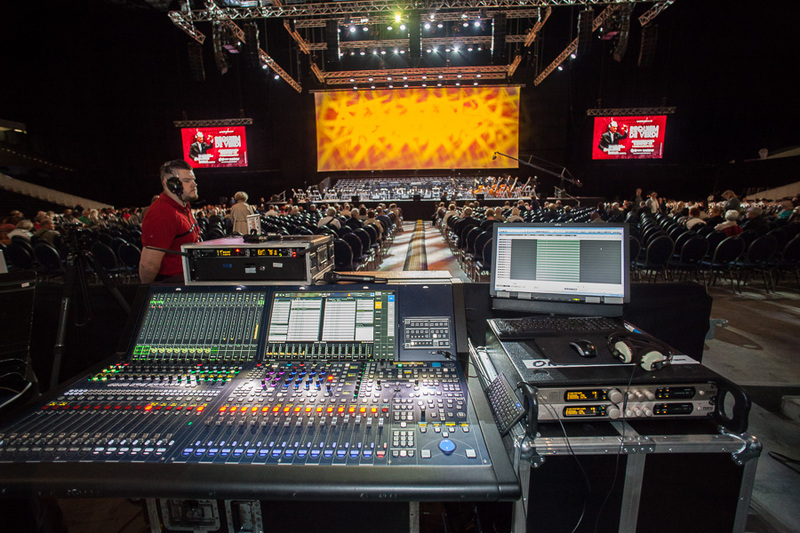 We’ll only be talking about the front-of-house sound in this article but, of course, carefully placed monitors allowed the chorus in particular to hear the orchestra, not just the timpani, drums and other brass that are positioned right in front of them! The first to answer our questions, despite a tight schedule, is Frédéric Blanc-Garin, the technical alter-ego of François Gabert with the ONL. Like Gabert, he is a contract technician and, alternating with François, he takes care of the Orchestra’s digital studio and, inevitably, of its outings like today. The two accomplices caught in the act. 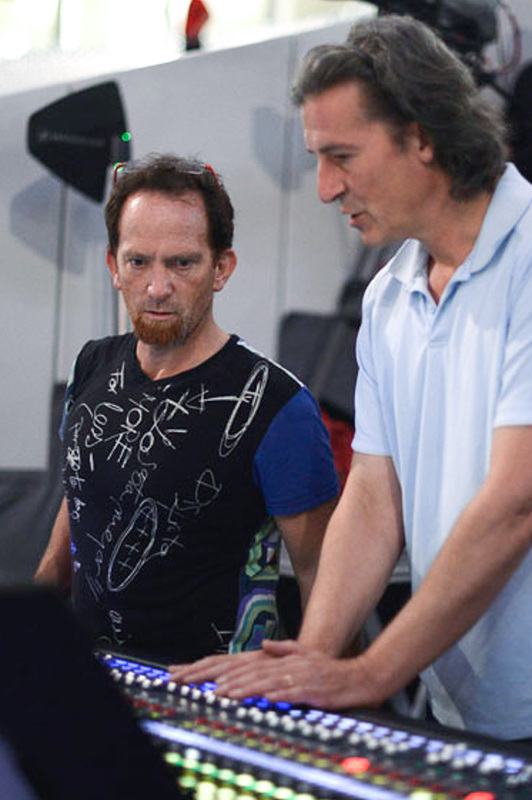 On the left, Frédéric Blanc-Garin and, with his hands on the faders, François Gabert. SLU : How did you find yourself at the helm of this little-known system and why L-ISA? Frédéric Blanc-Garin : While on tour with Paul Personne – I don’t mix only classical music – I had the opportunity to work with a Studer Vista that has a very interesting feature: the Virtual Sound Panner or VSP, which allows you to really open up your mix without affronting the audience and without losing energy as you would with a standard pan. I really enjoyed myself with guitars that maintain an understanding of the musical message while preserving a true identification of the sound source. My interest piqued, I spoke about it with the orchestra and François went to listen to it in the auditorium at Marcoussis. He came back convinced by the audio but less convinced by the workflow. 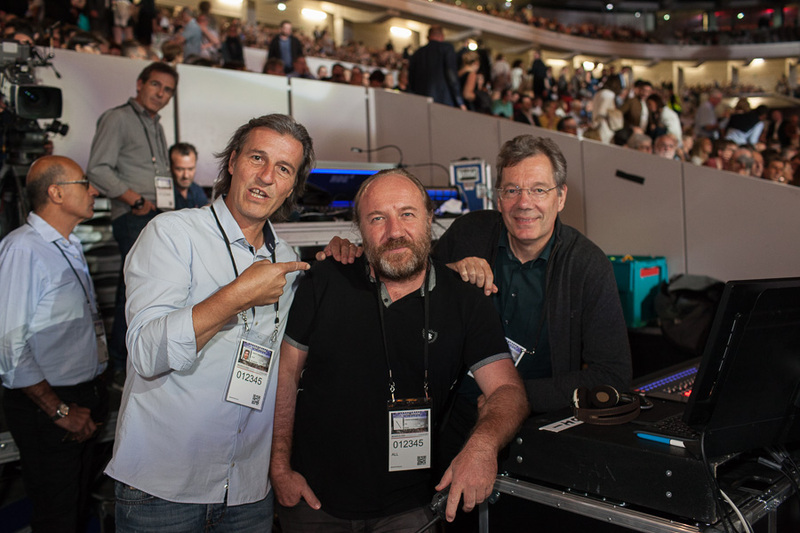 The next step was – again thanks to William and Fred Bailly of L-Acoustics – to deploy a mini L-ISA system in the auditorium at, Nouveau Siècle, so that François could mix and become familiar with it, and so our management could decide whether or not to adopt it. We mixed an L-ISA version and a stereo version, playing the latter at a higher level but only on the speakers of the 3rd and 5th arrays of the 1 to 7 extended deployment, the same we have tonight. A few minutes before the show, Fred Bailly speaks with William Duvet. SLU : What speaker enclosures did you use? Frédéric Blanc-Garin : Clusters of three Kara, each on pole mounts. We first played the stereo mix for our director who, seated in the balcony and at a good distance, found it quite narrow and a little closed. This was explained by the absence of the orchestra and the fact that we would normally reinforce what is missing. We then switched to the multichannel system. He then got up and wandered all along the balcony to listen to what would be perceived from each seat, and to verify the absence of any golden triangle as you would have in stereo. He then came back to me and said ” it sounds like the orchestra is here…. We got the green light, and it was technical director Stéphane Evrard who took over. SLU : L-Acoustics assures that the SPL and driver in the L-ISA system are not sold at a higher price than a traditional system. Stéphane Evrard between François Gabert (left) – who says “without him, tonight would be left/right!” – and Erdo Groot, who assists François in following the chart, which is nothing more than an annotated score. Frédéric Blanc-Garin : This is essential because it was necessary not to exceed the 2016 budget, in which we had flown four arrays of K2. The whole system, including the rigging, fits in the budget. SLU : I guess you’re talking about Alive, the audio vendor tonight. William Duvet, who was the intermediary, works there? Frédéric Blanc-Garin : Yes, he does contract work for Alive, with whom we collaborate regularly; I do a lot of things with him. He is a big believer in the Heil House (he smiles). SLU : L-ISA is an idea based on an algorithm. As far as the sound is concerned, do you find that the ratio of benefits to drawbacks is satisfactory or better than satisfactory? Frédéric Blanc-Garin : Yes. There are some phenomena, but these are slight and it deserves to be listened to with other pieces of music and in other places to get a better idea… and, then again, this algorithm is constantly evolving. This is a first experience that will lead to others. While walking around the room and in terms of emotion, I have a much more satisfying impression when I’m inside the coverage of L-ISA than outside it, and I’d have more to say about the problems generated by two standard arrays and the stereo beast than I do about this configuration. I had the same feeling about the digital microphones when we adopted them. 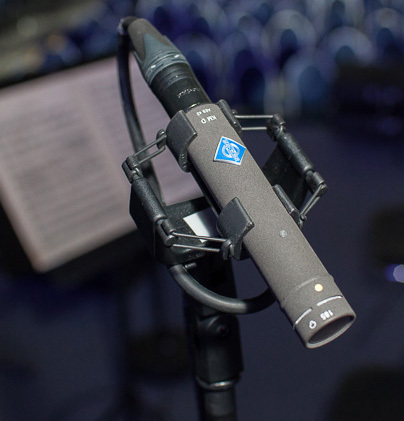 One of the many digital Neumann condensers, a KMD preamp used with a KM185 capsule sporting the now famous light blue badge and the inscription “AES42”, the standard for transporting digital audio signal stream and a service data stream that allows you to vary the settings directly from the Lawo console, which has also adopted it. Apart from quantifiably better performance, we’ve discovered that the digital microphones are more defined in the mix and the off-axis pickup is naturally attenuated without having to roll them back, so the sounds become cooperative and the mix comes together better. With L-ISA, we achieve the sensation of bringing the listener closer to the musician, without the need for opera glasses. We bring him more emotion, and that’s our mission. Finally, the rear attenuation of this system will allow us, if we continue, to bring a little more “air” to our sound by pulling the mics up a bit next year, including on the violins, which is always good in classical. A pair of MKH8090 mounted on their MZD8000 preamp/converters… or “how to digitize a great microphone”! 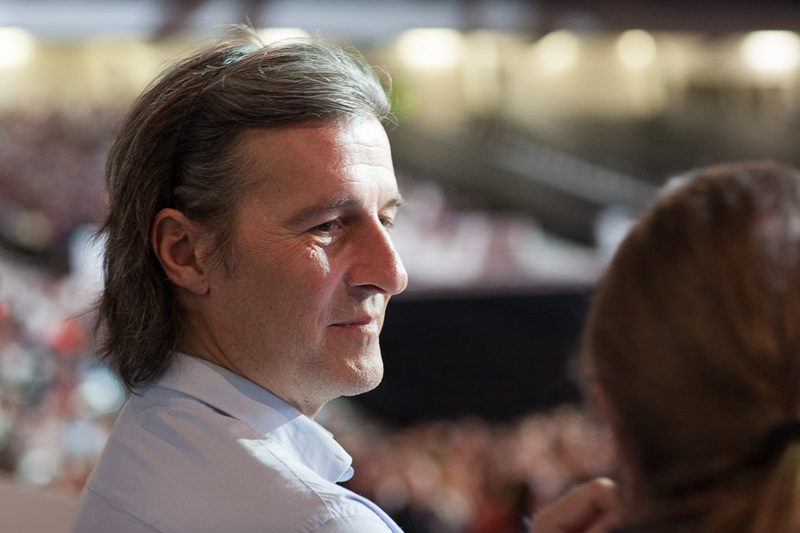 Frédéric Blanc-Garin : We mainly have digital Neumann and Sennheiser mics and, when a record label comes to make a recording of our orchestra bringing their own main pair, these allow us to add some closer-miced signals with different colors. For this Requiem, we’ve added about twenty transducers to our setup. The sound of the choirs is captured using pairs of MKH8090s mounted on MZD8000 preamp/converters and KM 183Ds for the outer pairs. Initially, we would have preferred to have only the Sennheisers but, since the Neumann has the same directivity and we were a little short on microphone pairs, we mixed them. The rest of the orchestra is also picked up using Neumann and Sennheiser digital microphones, including TLM 103Ds and MKH8040s. François Gabert, the man who runs 300 artists through 101 enclosures. We let Fred get on with his job, since François Gabert joins us to spend a few minutes behind the scenes, despite a schedule as packed as a semi on tour! SLU : How did your collaboration with the ONL come about? François Gabert : I started doing occasional jobs for them a good decade ago and, after Lille 2004, I left to do other things. Four years ago, I came back because Fred (Frédéric Blanc-Garin – ed.) – who is a pure technician, while I am much less – asked me to. He had the idea of a digital studio with the Lawo and 60 digital microphones that convinced the ONL because it brought a lot of notoriety through quality recordings. I’ll take this opportunity to say that we’re going to develop a specific YouTube channel for the Orchestra that will give it even more outreach. François Gabert : Don’t talk to me about that, it’s a problem for me too. SLU : Is amplifying a classical orchestra something natural and does L-ISA contribute to it? François Gabert : I’ve toured a lot with bands, 25 years of working with many different systems, and I always make sure that the audience can hear at least as well as I can, especially in the bass and infra-bass. For example, I’m a fan of the arced subs, even if this configuration softens the attack a little bit, but it makes up for it because it guarantees everyone an equal tonal balance. With L-ISA it’s a bit like that, we can allow 65, sometimes 70%, of the people to hear a realistic spatialization and true stereo. Real definition of the sources in the space. It’s a whole different thing than having a dual mono with two stacks or a stereo that is only effective for 10% of the audience. SLU : In this case it would have been better not to put seating perpendicular to the left and right of the stage (smile). 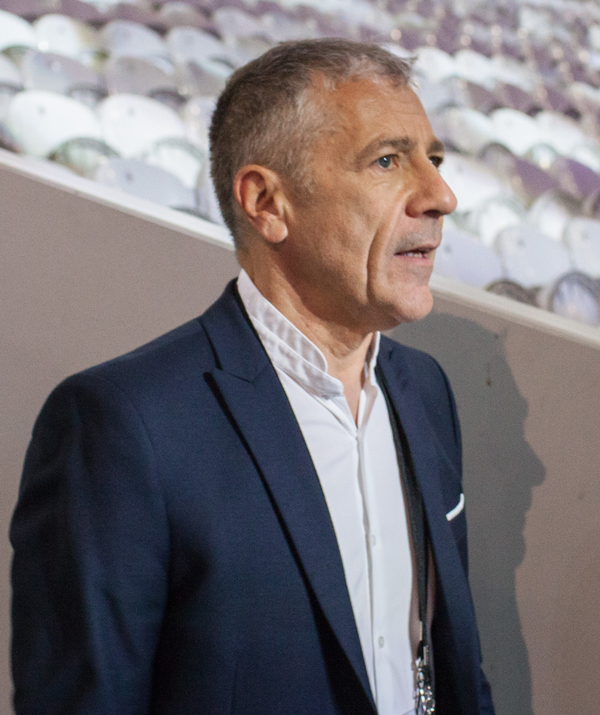 François Gabert : We can’t do everything just yet (he laughs), but in an ideal world, it would have been necessary to move the system back to gain some width in the coverage and more seats in the optimum sound zone. However, we will be playing for 14,000 people, so we even left the upper tier empty. We have coverage right up to the ring of sky boxes. The Pierre Mauroy Stadium in “arena mode”, photographed from the top of the second tier of bleachers. The third (upper) tier was not used for the Requiem, which attracted 14,970 spectators! SLU : This room is remarkable, by the way, it is almost dry. François Gabert : Without the audience it’s not, it’s a little live, but once it fills up, it indeed has a very short and clean reverberation time. It’s quite surprising. The first time we came here with the ONL, I almost got taken in and, at the beginning of the concert, I had to send much more reverb than during the soundcheck. SLU : Do you think that using L-ISA to localize the on-stage sources is a relevant and acoustically interesting solution? François Gabert : Much more so than with a stereo pan, where the choice of “placement” of the source is valid only for the spectators seated right in the center of the triangle. Physically, there is no ideal solution. 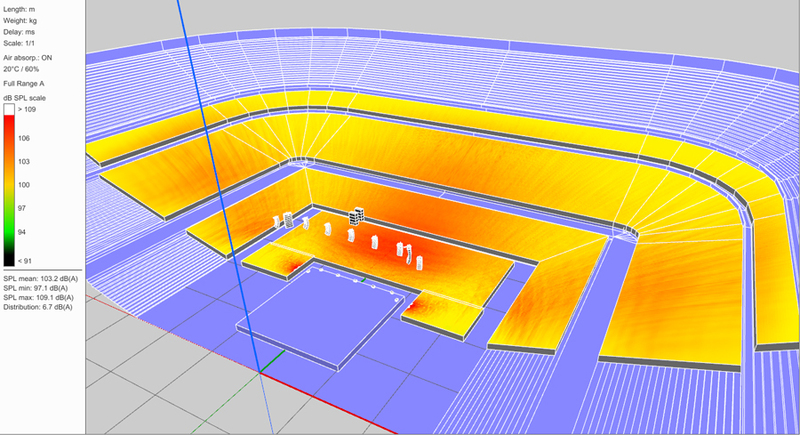 With L-ISA we are coming closer to an acoustic solution; let’s say not even amplified, a concert hall where everyone does not have the same sound image, but where everyone has a spatialization related to where he is. Sound and lighting FoH, entrenched low in the stands facing the stage and the system. François Gabert : I may be shooting myself in the foot, but amplifying an orchestra is cheating. 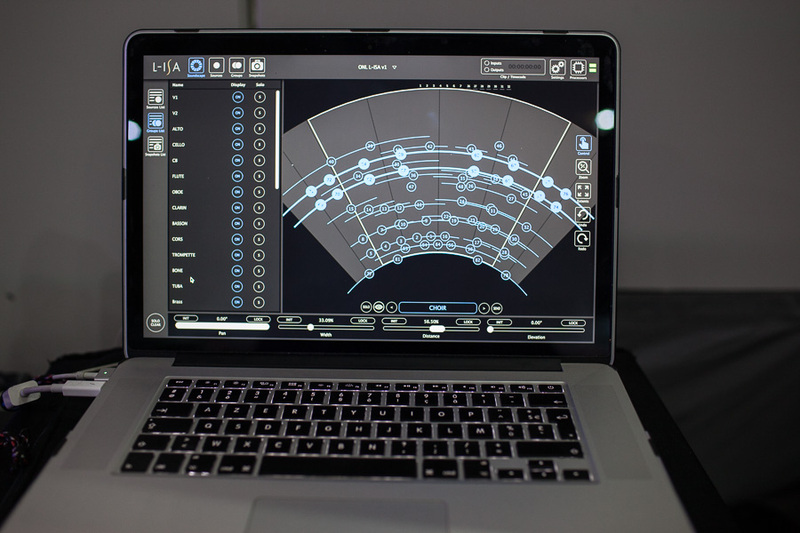 With L-ISA it is possible to recover some of the natural acoustics that an orchestra can have in a concert hall. 55 intense minutes and then the release. Since it would be difficult and improbable to do an encore of a Requiem, Francis can also enjoy the applause of a delighted audience. François Gabert : Yes! It’s sort of what we are doing here, since I distribute the elements of the orchestra in the Kara systems based on their placement on stage. I’m only lacking a little airiness in the sound from the mics to sweeten up the instruments with a natural sound that can be very harsh in proximity. The little harshness you mentioned off the track in the violins, is due to this. This is not because of the algorithm of the L-ISA processor or the digital microphone, but the difficulty of maintaining a distance from the source while, at the same time, maintaining the level and the precision in the room. To conclude, L-ISA is not perfect, but it’s infinitely better for the audience than the usual left/right. William Duvet, a technician who played a key role in bringing L-ISA to the ONL. We made sure to get him to tell us about his role as facilitator, without which Verdi would have had only two arrays. William Duvet with, to his left, the computer that controls the L-ISA Processor. SLU : Apart from really loving L-ISA, and spreading the word about it, what do you do? William Duvet : I am a technician, mostly focused on systems, but I mix as well. I work in northern France and in Paris for Audio Intelligence. 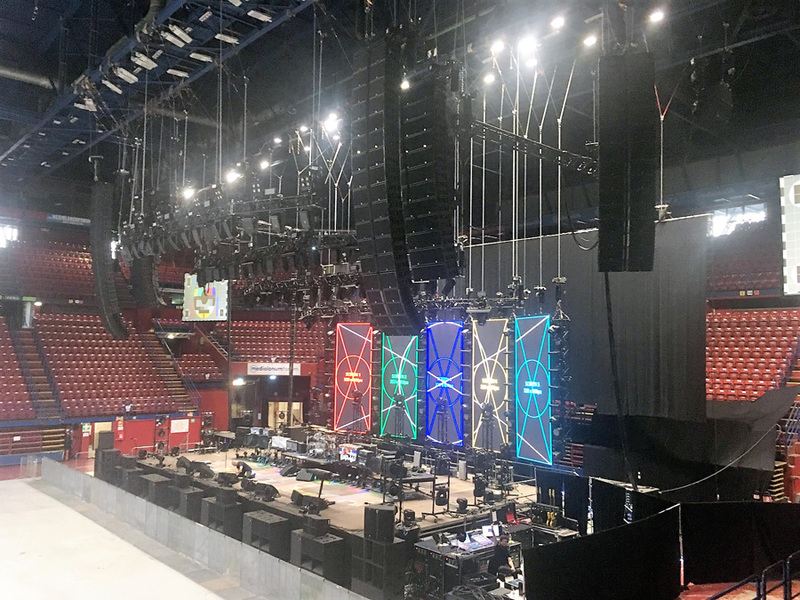 For some years, I’ve been using L-Acoustics products and in early January, after surfing around the web and discovering this system, I spoke with Fred Bailly (super application engineer for touring at L-Acoustics – ed.) and I thought it might have been interesting for this show, which had already been done three times with a traditional sound system. 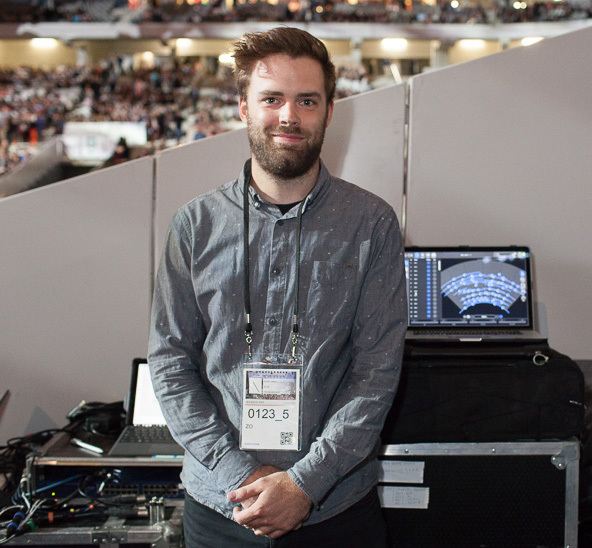 So, with the help of L-Acoustics, I acted as a liaison with the ONL, even though I had never worked for them before. Sherif El Barbari, the L-ISA field man who, as Christian Heil will tell us later, never misses an opportunity to measure, listen and discuss this system. SLU : But you are from Lille and are here on behalf of Alive, the audio vendor at this event. William Duvet : Yes, absolutely. I’ve also worked at Mauroy Stadium with other vendors. SLU : That still doesn’t tell us how you got into the operation with the ONL. William Duvet : That was through Frédéric Blanc-Garin and François Gabert, who is a colleague. 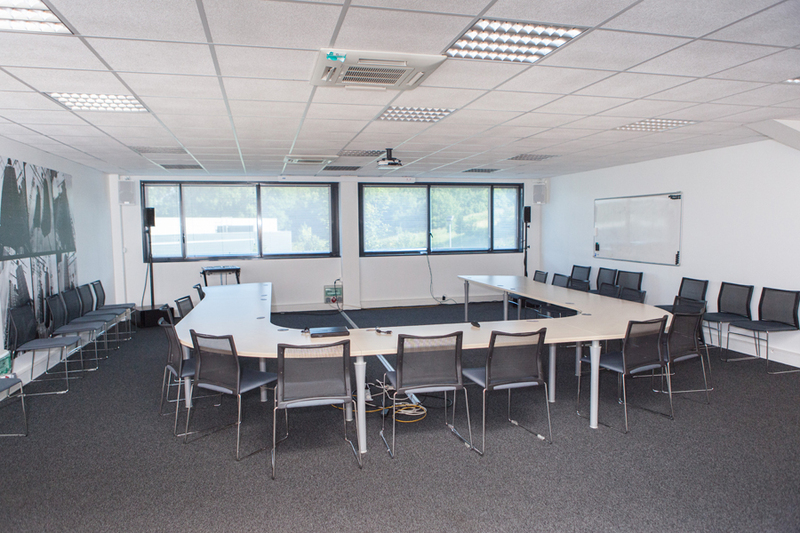 Frederic found the idea interesting and set up a meeting to discuss it, then he wanted to meet with L-Acoustics to move the project forward. In the meantime, I was trained by Fred Bailly and the wheels were set in motion, up until the final bidding and the choice of the vendor in charge of deploying the L-ISA system in the stadium. The LA-RAKs, then nine Kara of the number 1 array and the eight K2 of the stage-right lateral array. SLU : What is your role in the production itself? William Duvet : I managed installing all the gear, verifying the cabling and rigging with L-Acoustics and, finally, assisting François to allow him to find his space and his console pans in the processor. SLU : Exactly, why is the controller display screen on the side and not facing the mixer? William Duvet : François wants it this way. He doesn’t want to see it or play with it during the show. We decided on the placement during the soundcheck. If, in the end, he decides to make changes to, I’ll take care of it for him. He wants to keep his hands on his faders and not be disturbed, let alone pick up the mouse to do it. Integrating the L-ISA plug-ins into DiGiCo consoles will make it remarkably more comfortable. SLU : How did you go about setting up the matrix for the show? I know that “matrix” is not an accurate term, but we understand each other (smiles). William Duvet : We started from what we did in trials last month, during testing. We set the patch of the show and we worked on it like a virtual soundcheck, with the multi-track recordings of last year’s show. This is not the same piece of music, but the microphones, console and stage were very similar to the concert tonight, and it gave us an initial idea. Then we used the recordings of this morning’s rehearsals. SLU : How many inputs are being processed? William Duvet : 84, two of which are wireless mics for announcements. The 84 “objects”, as François positioned them in the controller. At the bottom of the screen are those that are most similar to the original signal; at the back, those that are processed by the ambient algorithm incorporated into the processor, and attenuated in level and presence to simulate the distance. Note also the “wings” on either side of each object, which represent the extent of both sides of the system or systems that reproduce the source and, therefore, the width of the image. SLU : Can you explain the setup to us? William Duvet : The Lawo console outputs MADI to the L-ISA processor. After processing, this sends the signals, still in MADI, to an RME converter that converts the output channels in AES/EBU, and it is these digital outputs that will drive the amplified controllers that feed each array separately. We use the MADI clock. SLU : Where is the L-ISA processor? William Duvet : It is at the stage end, near the stage rack of the Lawo. It would be useless to have it here. Again, the screen of the L-ISA controller. All the way down, beneath the numbers 77, 78, 81 and 82, the reverb effect returns in the foreground: the “distance” is set to zero, but the “Width” is set wide enough to create a very broad and overlapping front. SLU : At what sample rate is it all running? SLU : Absolutely agreed. Why are there eight zones on the L-ISA controller screen? William Duvet : There are eight sectors and, if you look closely, seven dotted lines that correspond to the seven Kara arrays. It‘s a graphical representation that facilitates the localization of objects in the sonic image. But don’t forget that each array opens at 110°. We’ve also used the auxiliary outputs of each object to create the mix for the fills, a mix which is adapted in level and content. The sub channel is simply the mono output of all objects. SLU : What are your plans after this production? William Duvet : System engineering for Intelligence Audio. William Duvet : (he laughs) Yes, and it seems that there are lots of us! That being the case, the North is also moving and there is plenty of work right here, too. 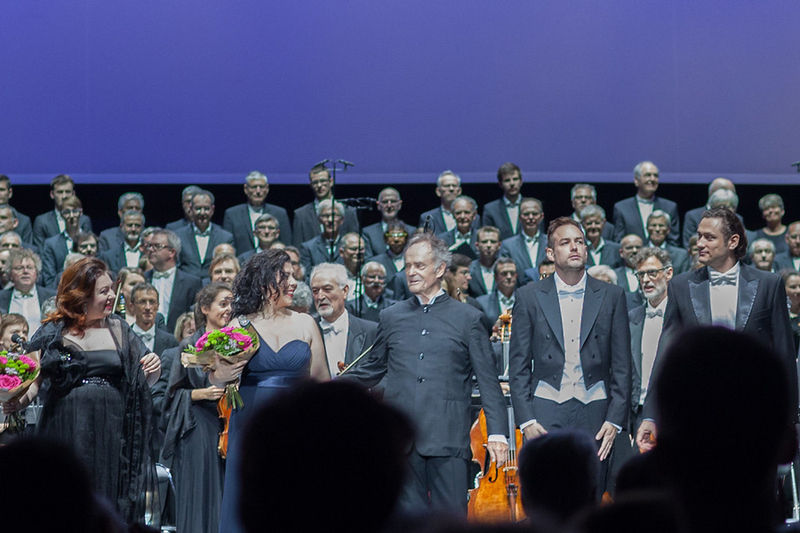 Jean-Claude Casadesus, the ONL, his four soloists and his 200 singers greet a captivated audience. The power of the Requiem – emotional as well as sonorous – has been perfectly reproduced by the L-ISA system. 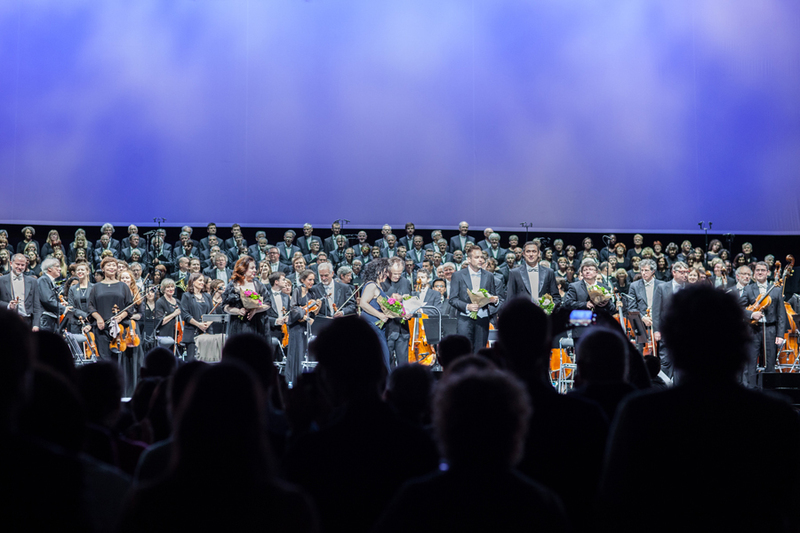 After the description of this beautiful production of classical music, we’ll move on to the technical aspects in the second part of our report, with Guillaume Le Nost, head of R&D at L-ISA and, finally, to the interview with Christian Heil in the third and final installment. We know about RoomMatch, Bose’s system with constant-curvature and DeltaQ technology designed for flexible vertical and horizontal coverage. Now we have ShowMatch, a new system that gives even more with mechanical optimization provided by DeltaQ coverage but also offers the possibility of working with line source configurations, therefore allowing you to reach new “Show” markets where SPL, weight and dimensions really count. A demonstration was organized in Paris by the American manufacturer. SLU was there and we’d like to share our first impressions. 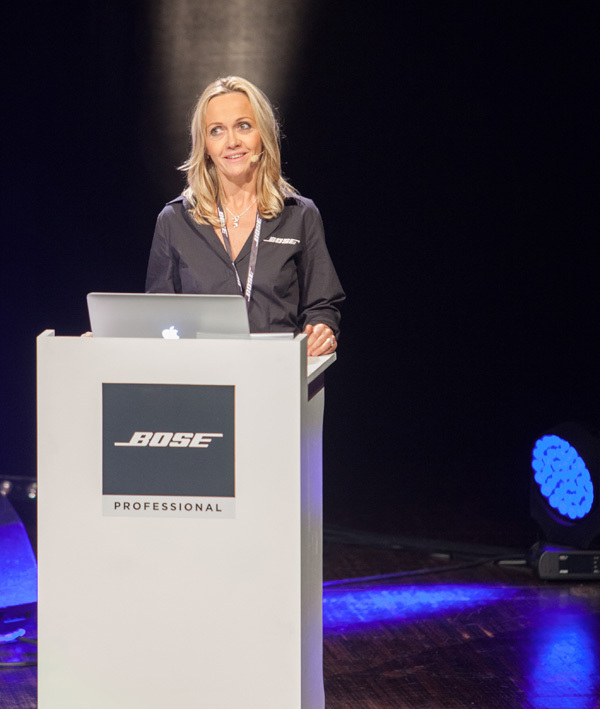 Congratulations to Sophie Molitor and the entire Bose Pro France team for truly perfect organization.. The petit fours were quickly eaten and we were able to see and appreciate the design, transducers and the materials via a static display of a number of enclosures. For anyone that may have missed our coverage of the ShowMatch presentation during Infocomm 2016, let’s revisit the main characteristics of this new system. The SM5 equipped with 70° lateral panels, a tight horizontal coverage helping the throw. 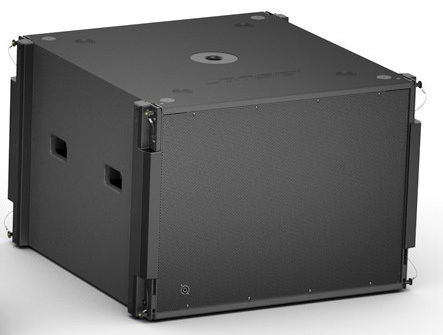 This two-way system consists of three enclosures (SM5, SM10 and SM20) and an SMS118 subwoofer of the same width, allowing for ground stack or array positions. 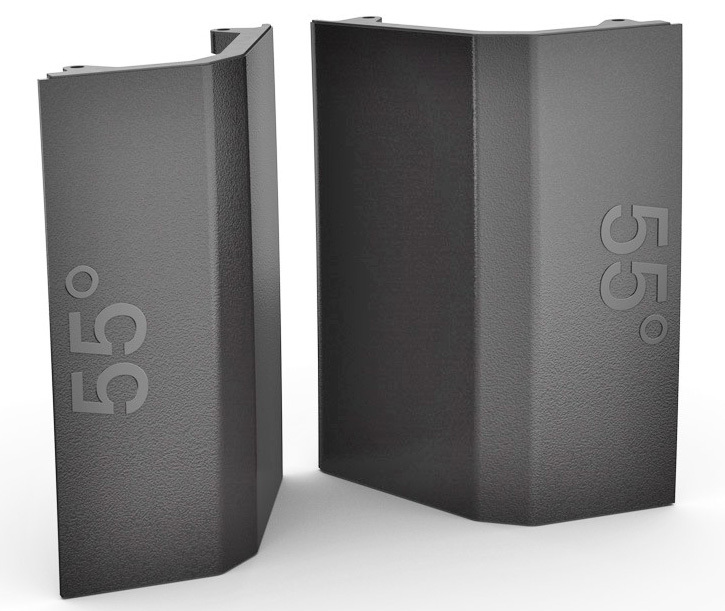 The three enclosures differ in their vertical coverage (5, 10 or 20°) and their box shape at the back, meaning angles are even more refined and the load volume is slightly reduced. In contrast to specialist systems, ShowMatch can be arrayed in constant curvature with boxes chosen based on vertical coverage desired and SPL sought based on distance. Variable curvature is also an option with the 5° coverage model, which has a rigging system that allows angles to be adjusted by 1° increments. This is a first for the American manufacturer, opening up the touring market for it in a big way. . 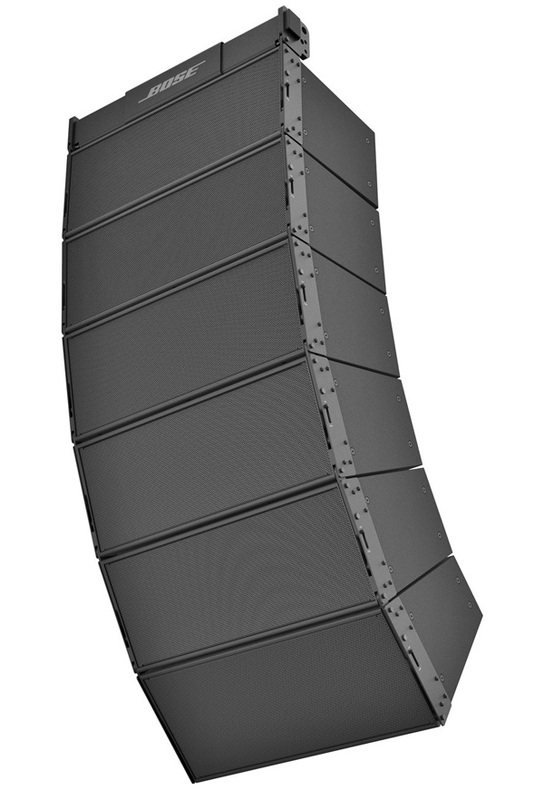 The SM20 with 20° vertical coverage and a tapered shape allows for a constant-curvature line array. 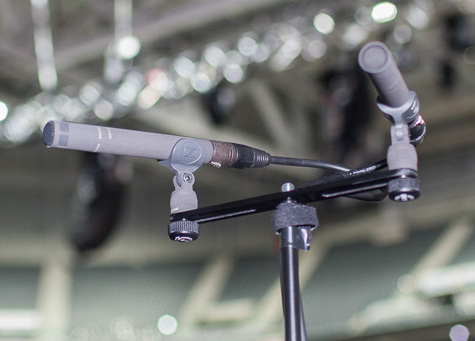 The 55° kit included as standard with the SM5 offering the ultimate reach and SPL. But if you’re talking about DeltaQ, you’re talking about the possibility of varying horizontal coverage as well. In contrast to RoomMatch, which as a perfect install product requires you to choose your coverage option at purchase, ShowMatch gains flexibility via its 4 interchangeable side panels that can be removed with the aid of four screws to change the horizontal directivity from 70 to 110°, with two kits shipped with each enclosure. Don’t jump in and complain, the optional 55° and 120° panels offer an even greater number of combinations. Finally, as with other manufacturers, combining two coverage options is possible for asymmetric directivity. It suffices to say, virtually any application is possible with this system from small halls to live applications that are much more ambitious. 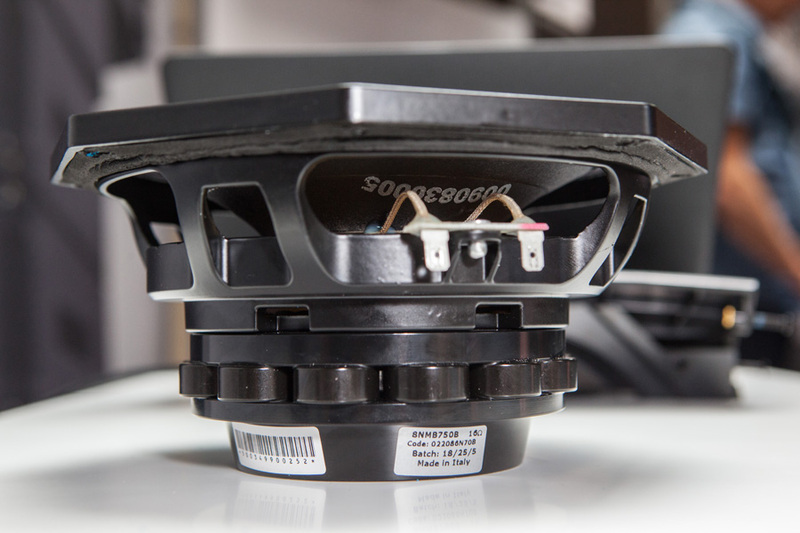 With regard to transducers, Bose has not overlooked quality and quantity, fully aware that live applications requires close attention to SPL. The proof is in the peak values of 127 dB (low frequency) and 132 dB (high frequency) for the SM5 model. To reach these levels, in spite of its small size and very modest weight of around 30 kg, the old RoomMatch drivers have been improved through modifications to their relatively low starting frequency. This is because the drivers only take over at 800 Hz with ShowMatch. Now known as EMB2S, the drivers deliver 4 dB more than the previous model. Configured in four parallel series on the CADS (Continuous Arc Diffraction Slot) wave guide. The 8-inch woofer, ventilated, powerful and Made in Italy on Bose specifications. 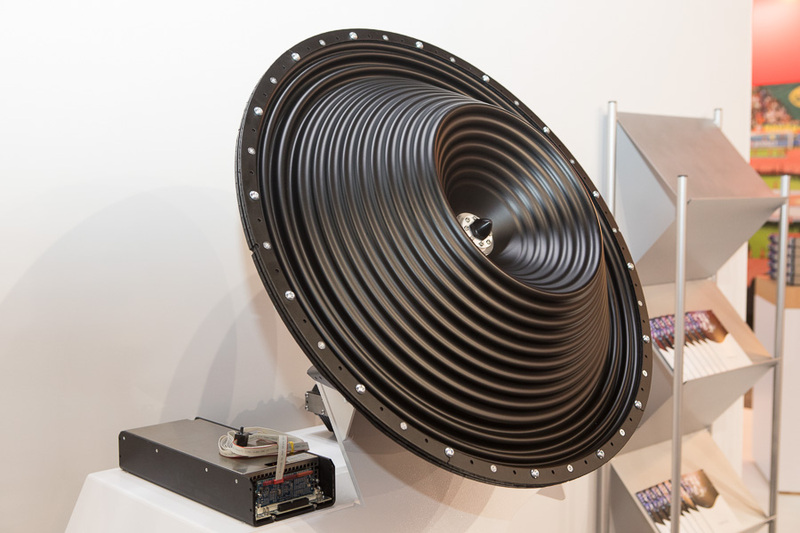 A cardioid array with three SMS118s. This is facilitated by double sockets on the front side. they work very well with the pair of 8’’ maximum-performance woofers, a 3’ voice coil and a neodymium magnet (which is made in Italy and beautifully manufactured). We will see its inner workings and its descending capacity for low frequencies later on. The 18’’ SMS118 bass reflex subwoofer also has high excursion and a neodymium magnet. It’s designed to be fitted at the top of a line or at the base of a line. 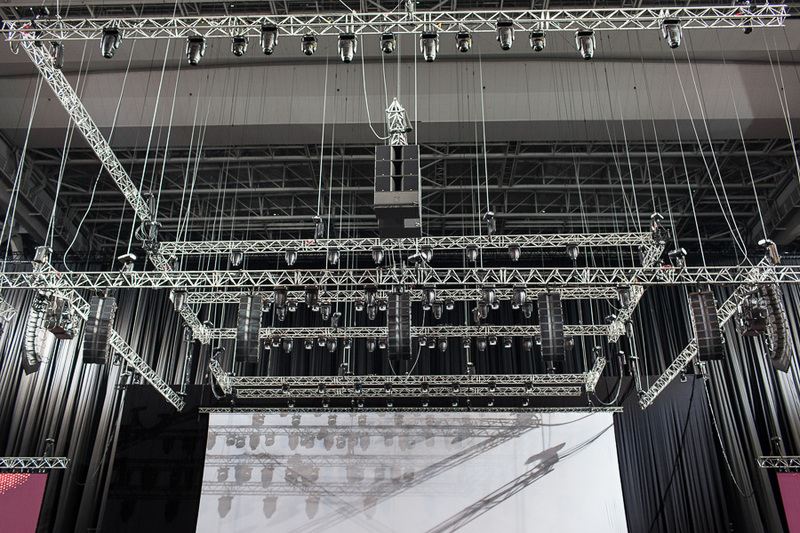 ShowMatch is equipped with a number of accessories and notably rigging that enables 24-enclosures hang with a 10:1 safety factor. For amplification, Bose offers two solutions. For install, the PowerMatch PM8500, a smart amplifier, is powerful and flexible like the range of speakers. It benefits from the ability to bridge the eight 500-watt channels that make it up (we will see how later on). 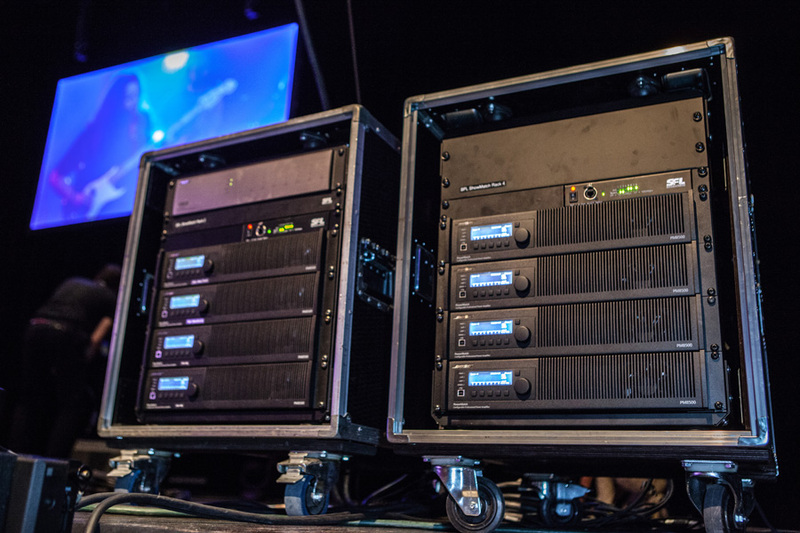 Racks for the PM8500, the multifunctional Bose amplifier, as they travel from town to town for this series of ShowMatch demonstrations. 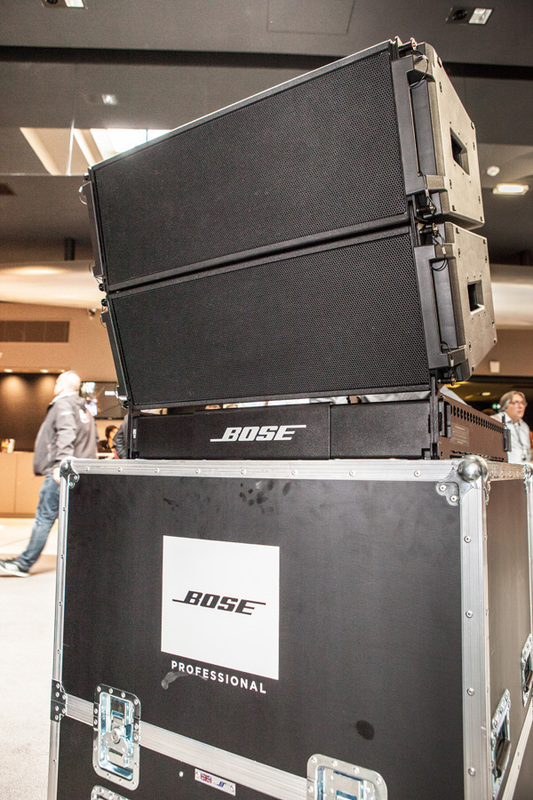 When it comes to touring, Bose has selected Powersoft, which needs no introduction. Bose will provide Powersoft with the presets necessary for the ShowMatch system. Sophie Molitor explaining the development of sound and her pleasure to present us with this highly promising new product. After this brief presentation, we resume our afternoon of ShowMatch discovery in the theatre hall where Sophie Molitor, Manager of professional systems & live music at Bose France and Blaise Dupiellet, Manager of the engineering office at Bose France, are waiting for us. When it comes to decibels, we are in for a treat. 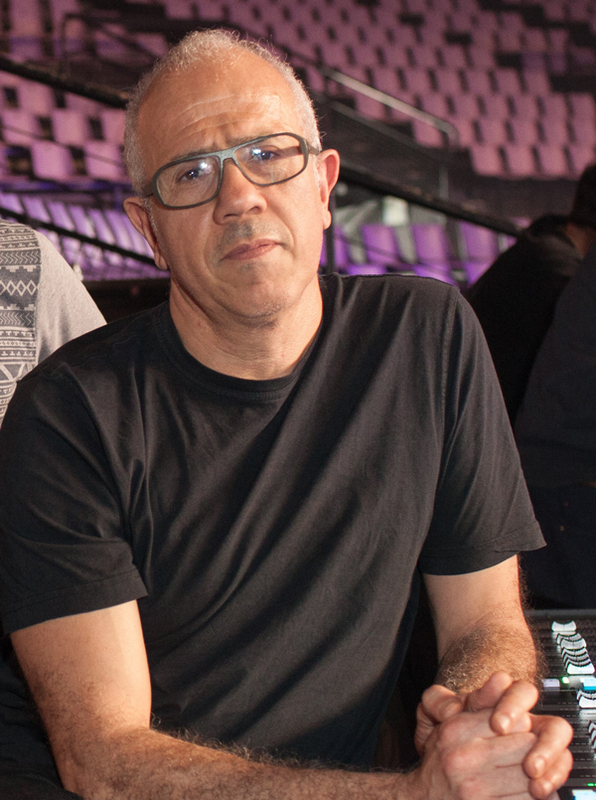 Blaise Dupiellet delighted with effects coming from the samples of music during the ShowMatch technical introduction. Seven boxes on the right and left-hand side, along with four subwoofers arrayed on the ground were deployed. This is the same system that is touring to European distributors and brand subsidiaries. Seven ShowMatch boxes in array. 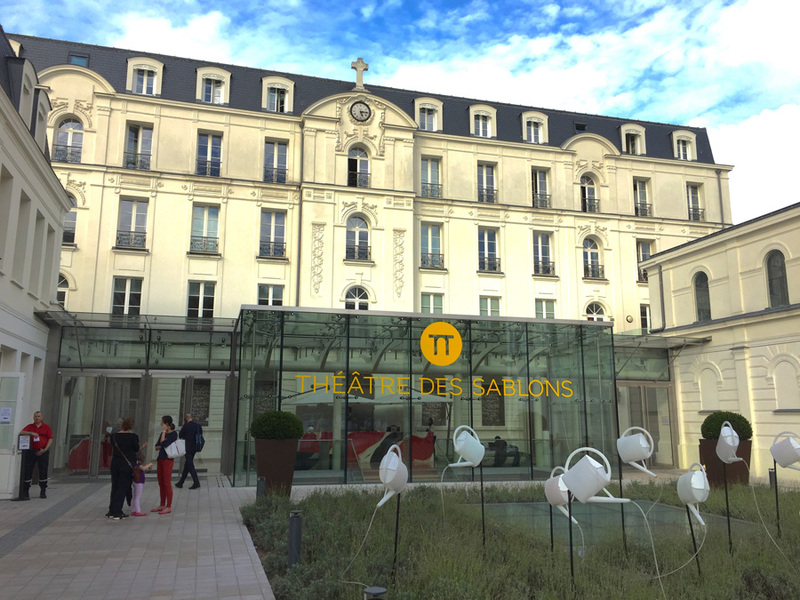 This configuration has ample capacity to fill the Théâtre des Sablons. SLU : What type of box is hanged ? Blaise Dupiellet : We have four 5° and three 10° enclosures to complete the line. 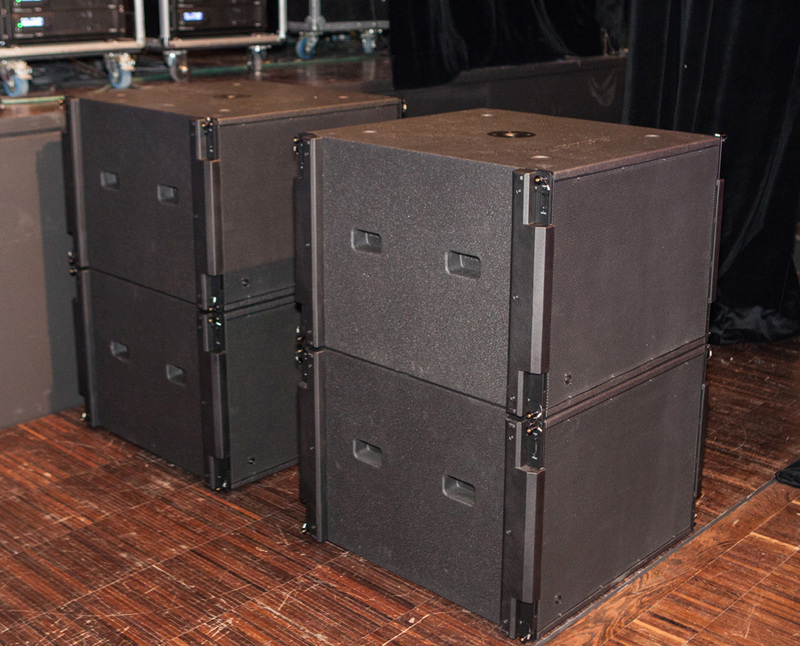 On the edge of the stage, we have four 20° enclosures and eight subwoofers in groups of four in a cardioid array. For amplification, we use PM8500 power amplifiers where we bridge two channel pairs and the remaining four are used for a parallel/bridge configuration (known as Quad mode), which allows you to reach 2000 W at 4 ohms. Therefore, the amplifier divides into three channels: two 1000 W channels and one 2000 W channel. This powers enclosures pair in parallel and a subwoofer. The enclosures are 6 ohms for the high-frequency section and 8 ohms for the low-frequency section. The subwoofer is 4 ohms, so, it’s very comfortable. SLU : The current presets are relatively straightforward..
Blaise Dupiellet : That’s thanks to standard filters, equalizers, delays and limiters. We have chosen a relatively flat response with an alignment that has essentially been carried out with console in mind. However, because our amplifiers are designed for install, Bose has reached an agreement with Powersoft to enable ShowMatch to travel around. This offers ShowMatch to benefit from a DSP platform that is more elaborate. 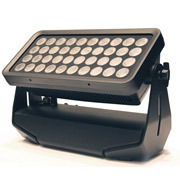 We recommend the X4 and X8 for high-profile install and touring. The ShowMatch presets for Powersoft will be available when we have finalized the delivery package. Four SMS118s with end fire installation. You need two PM8500s to power them. We also have a “shooter” for RoomMatch and ShowMatch, which is simple but effective and allows you to design a direct field quickly. This is the Bose Array Tool. The aim is to come up with a design in less than five minutes and to export a report with all the information required for setup. You can also make use of an option that suggests the number of enclosures needed based on coverage area. Arthur Boutin (left) and Romain Gamundi (right). We left Blaise Dupiellet to the rest of the integrators, technicians and clients present and took our multitude of questions to Arthur Boutin, a commercial technician with Bose who has a solid technical background. We asked him for some more precise details about the system. SLU : The EMB2 drivers seem like a force to be reckoned with. 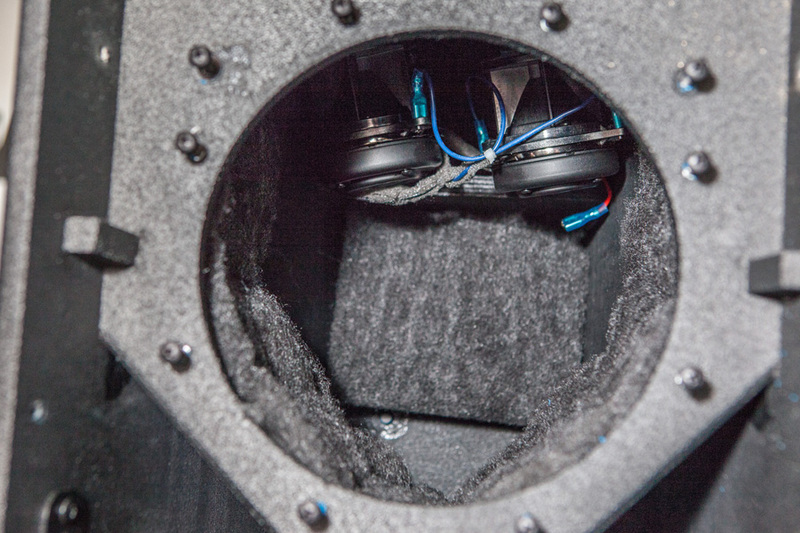 Arthur Boutin : They have been modified to accommodate the 8’’woofers. With RoomMatch they were working with six at a time but with two 10’’ woofers and they were going down to 500 Hz. ShowMatch’s cutoff frequency is set at 800 Hz, which gives the newly named EMB2s a better response for high frequencies and enables them to deliver 4 dB more from 8 to 16 kHz. This is essential for a line-array and prevents too much boost in the presets. This image clearly shows the outlets in the waveguide. Here, half of the 100° panel has been removed intentionally. SLU : : Is there a total of four set of panels that modify the horizontal coverage of the boxes? Arthur Boutin : Each enclosure has its directivity that will be included with delivery. For example with the SM5, we fit a 70° set of panels at the factory but you can fit a second option or even a third depending on what you include in the shipping box. 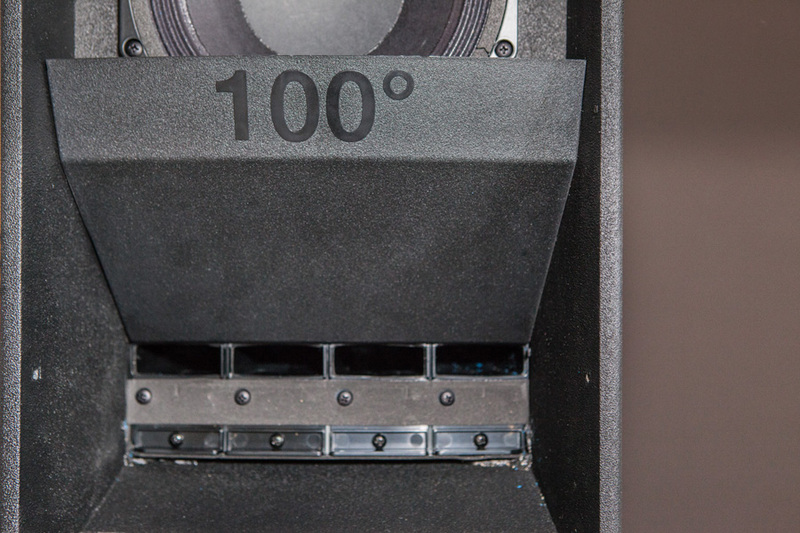 To sum up, the SM5 is compatible with 55°, 70° and 100°, the SM10 is compatible with 70° and 100° and the SM20 is compatible with 70°, 100° and 120°. So you have eight possibilities in total. The preset is the same for the eight directivity variants. You can also combine two different coverages to avoid, for example, hitting a horizontal wall or even a catwalk that an artist with a microphone in his hand is using. With regard to directivity, you must be thorough in your work. You can’t change from one 55° box to a 120° one. Modeler is really helpful for seeing whether or not combinations of different models work. 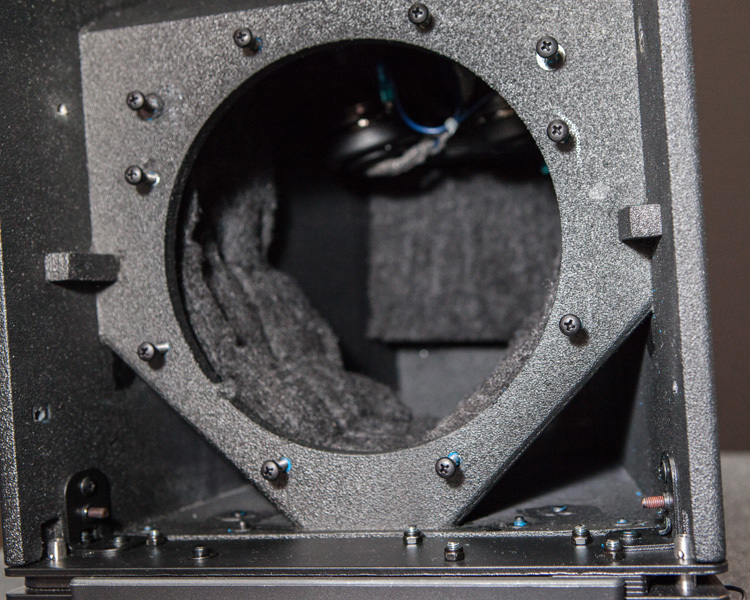 A view of the load volume of the 8-inch woofers that equip the ShowMatch enclosures. We can see the drivers in the load volume. The four air vents are wide in size. SLU : How are the two 8’’ woofers loaded? Arthur Boutin : The unique nature of this enclosure is in the distribution of the entire load volume between the two transducers. This gives a fairly wide response for low frequency. It’s only really the waveguide and the four drivers that take up much space. RoomMatch used to distribute the volume in two parts and the drivers were separate. SLU : Anything to add about the subwoofer? Arthur Boutin : It was developed at the same time as ShowMatch and uses the same dimensions meaning that you can use it in any way for ground stack or array positions. Bose made sure that a Speakon was fitted on the front side to facilitate cardioid arrays. The SMS118. 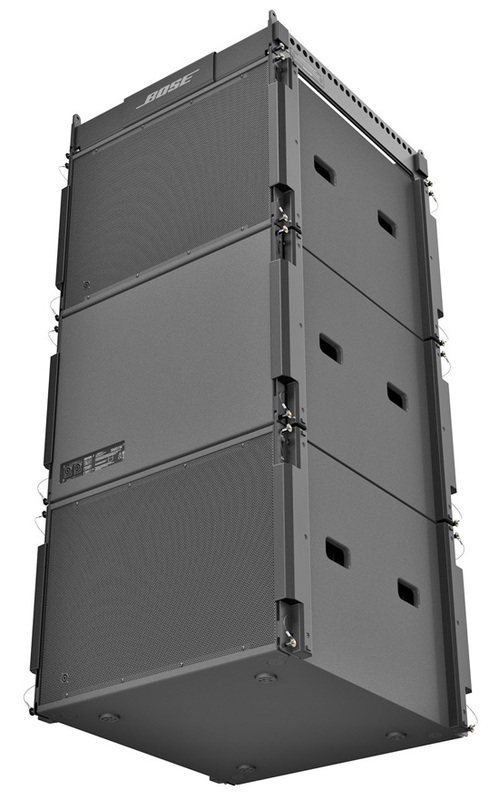 With its rigging system it weighs 62 kg and has a peak level of 135 dB SPL for ground stack and 129 for array positions. SLU : And the woofer? Arthur Boutin : A super 18-inch one manufactured in Italy based on Bose specifications. It has a huge excursion and neodymium magnet, which gives it, amongst other things, a modest weight. SLU : I’m going to ask this question again because we feel that there is unearthed potential in this system. What is the status of the presets? Arthur Boutin : Today, we have presets that are defined but we know that this software lives with the system and its users, so it’s going to change. The enclosures in « install » mode. The space saving and discretion are striking. 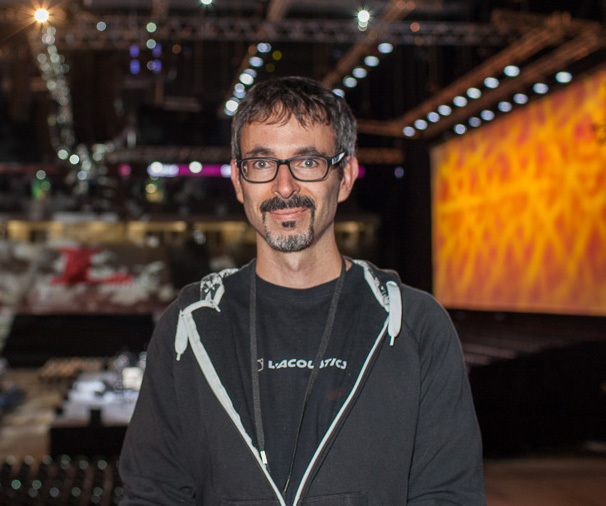 SLU : All line-array systems need a software platform. Arthur Boutin : Our platform is Modeler, a powerful electro-acoustic simulation tool that is the equivalent of Ease and CATT. As an example, it considers venue materials and acoustic characteristics as well as complex shapes. 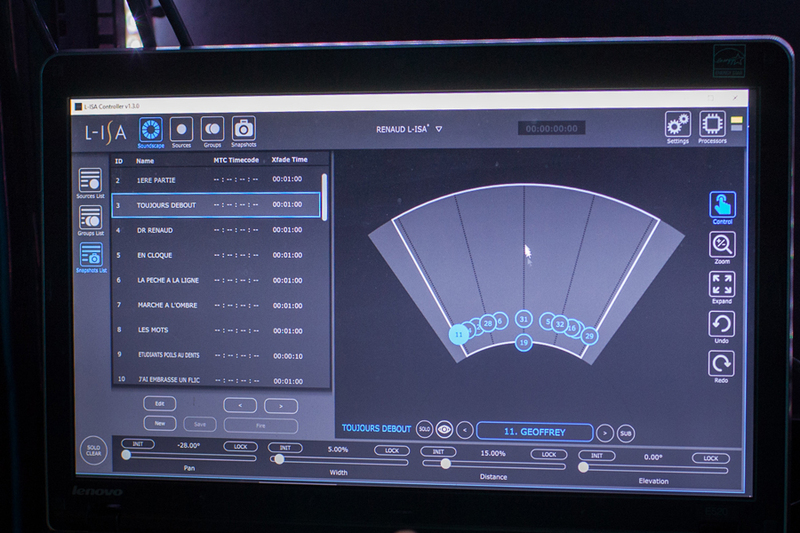 Knowing that install and touring can’t be treated in the same way, we decided to create a tool that was more straightforward, intuitive and quick to use. We called it Bose Array Tool and it operates based on Modeler with the same design tools. SLU : Let’s go back to install. Do you have any variants of ShowMatch dedicated to this market? Arthur Boutin : No. 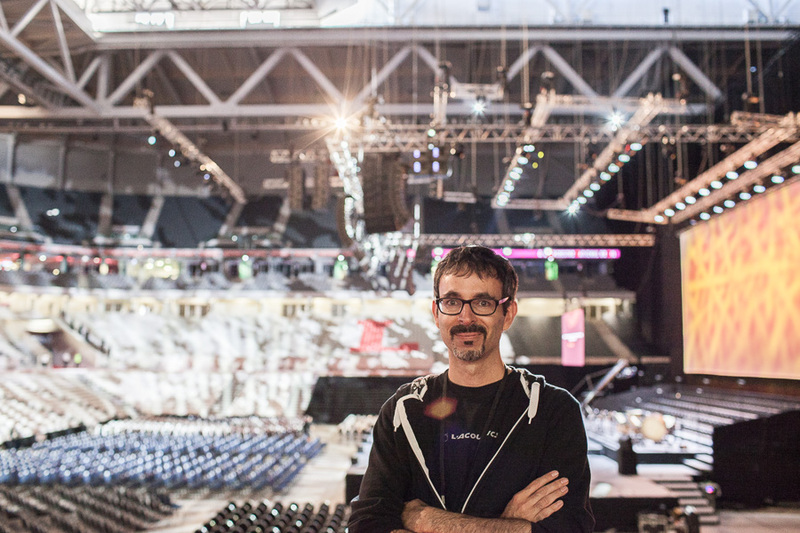 ShowMatch is designed with both install and touring in mind. For this reason, the two rear transport carrying handles and the flanks, which have two other molded handles, may be removed. The same goes for the pins that are designed for touring. These have been replaced by smaller and shorter models. All of this allows you to gain space and gives the boxes an even more discreet design. A view of the rear splay mechanism at the back of the SM5. You can distinguish the touring pins with the double locks that move aside when you press the clearly visible golden button. Each pin is securely attached thanks to a steel lining. Arthur Boutin : That’s normal. This model will essentially be the one used for touring and speaker arrays. We offer from 0 to 5° by increments of 1°. The SM10s and SM20s will be mainly installed with a DeltaQ constant-curvature. Attaching these with short pins is enough. Talking of the pins, the touring pins have a slider to hold them in place and they slide really well (laughs). SLU : What materials are used for your enclosures? The back of a panel held by Arthur Boutin. This is the part that borders each 8-inch driver and ensures its phasing. Arthur Boutin : Baltic birch plywood for the enclosure, steel for the rigging system and polymer makes up the rest for greater lightness. The advantage of using this type of wood is its resistance to water and temperature changes. The system is resistant to light rain but that being said, we don’t have enough information to be able to judge how it will hold out over time. Arthur Boutin : They are. They reduce certain interferences from the 8’’. They also modify and optimize polar response. SLU : Do you have an idea of when ShowMatch will be available for purchase? 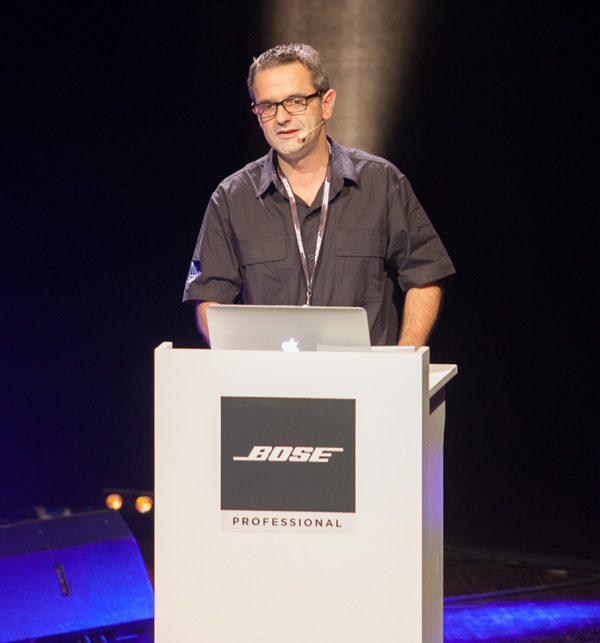 Romain Gamundi (Marketing & Events Coordinator for Bose) : Ok, I’ll answer that. Everything should be available at the start of December 2016. SLU : Any idea of pricing? Romain Gamundi : The three enclosures will have the same price of €3,850 before tax and the subwoofer will be €3,400 before tax. The extra panel (both sides) will be sold for €110, and finally the large frame will be €2,950 before tax. This pricing is about 30% lower than the best-known brands and it allows you to use the system in three ways. 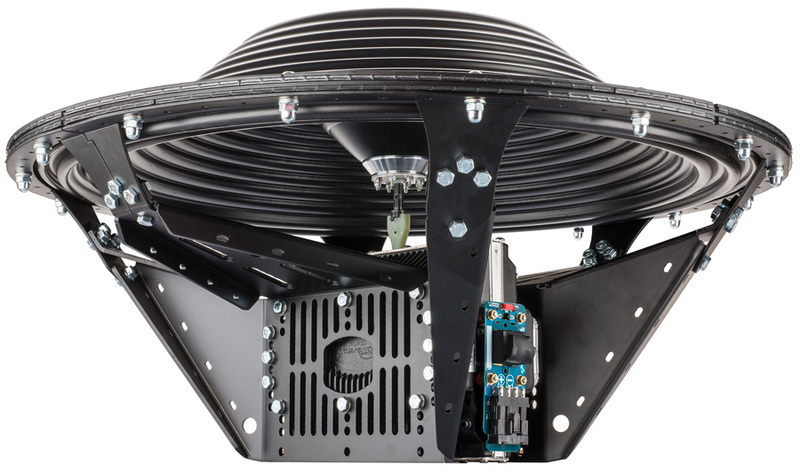 For example, with three SM20s with either a 70° or 100° horizontal directivity, you have a point source system that is both affordable and powerful. By combining more enclosures and directivity, you have a full DeltaQ system with all of its advantages for install, but with more SPL and a smaller size than with RoomMatch. Finally, by using the SM5 and SM10 enclosures with variable curvature, you can easily reach 50 to 60 meters, throwing sound for large events. Take clubs for example, you can equip the smallest and the biggest by taking advantage of our new subwoofers, which go down to 32 Hz. SLU : Are you able to provide complete touring configurations with the amplifiers? The Powersoft X8, which is brilliantly designed thanks to its powerful DSP and amplifiers delivering up to 40 KW over eight channels. Blaise Dupiellet : Of course. 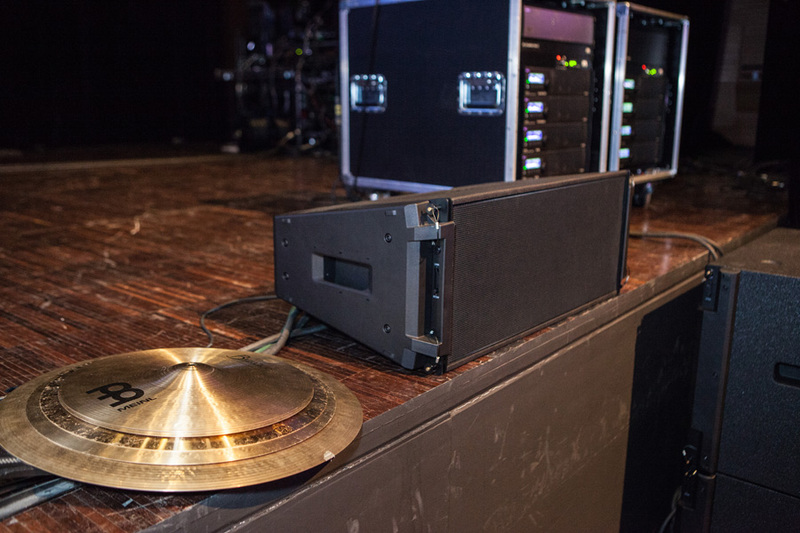 In addition to 100% Bose install configurations, we will be selling touring racks specifically designed for ShowMatch and equipped with Powersoft amplifiers . There is a Belgian company that deals with assembly of products based on our specifications. 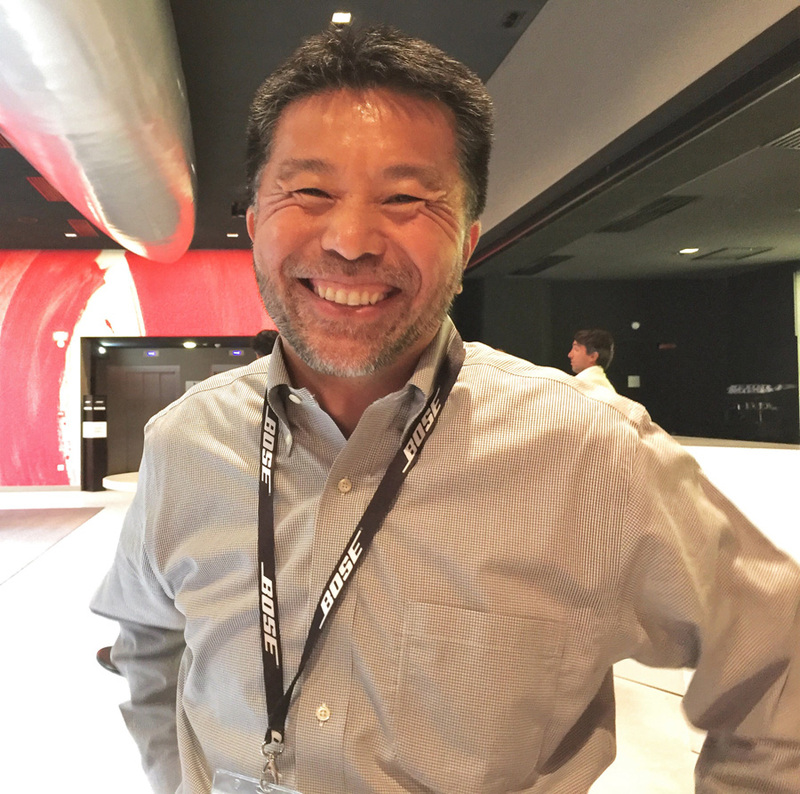 We finally had a chance to talk to Akira Mochimaru, the General Manager of the Professional Systems Division at Bose Corporation, a man who is rarely seen on French shores. We asked him why Powersoft was chosen for touring amplifiers. Akira Mochimaru, an open man with a big smile. Akira Mochimaru : PowerMatch is an excellent amplifier. It’s very robust and, quite simply, I’m sure that it can take to the road. It’s just that it is configured for install with Euroblock connecters, which aren’t suitable for touring. Rather than setting strict guidelines, we have decided to allow users to freely use other models, especially Powersoft, which is an excellent brand that is reliable and offers high-quality products. In addition, they have a very good network of distributors that provide after-sales service. Finally our agreement includes access to their DSP platform where we can integrate our presets and remote control of the system. I’d like to stress that we’re not saying that people have to use Powersoft amplifiers, but it is true to say that we haven’t tested or approved other brands. On the other hand, trials that have been carried out in Bose laboratories with the Italian brand have been very convincing. Brave and, some would say, daring. 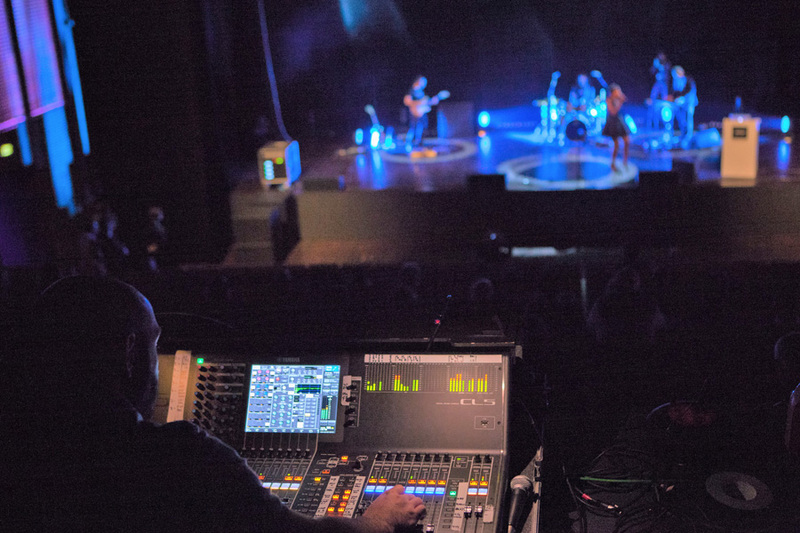 With ShowMatch, Bose is throwing itself into the deep end of line array with the aim of considerably extending its usage range through its DeltaQ technology. 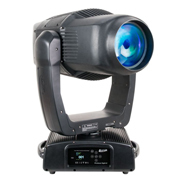 Bose also benefits greatly with the smart choice of Powersoft to provide power and advanced features that are vital in attracting clients from the touring sphere. Hearing the system in action strengthened our positive first impressions from the very first notes. With mastered music, the high frequency and medium frequency appear exact and pleasant, prolonging a low frequency that is interesting and sufficiently edgy where the connection with the subwoofers flows nicely with the exception of a small loss of impact, at least in the hall where we had our brief listen. On the other hand, the lone enclosures have an attack and interesting playback with low frequencies, ideal at low levels and for vocal groups. Listening to the live mix from the band playing especially for Bose improved our impressions. Voices were reproduced with clarity and definition, without sounding rough. The same goes for the instruments, drums and keyboards alike. The playback truly is “live” combining the punch and color you need to bring in large audiences. The feeling of power is very apparent thanks to pressures ranging from 100 to 102 dB(A), which seemed more than enough to us. There is nothing like real instruments and authentic voices with all their dynamic power to test a system that is set to take sound reinforcement companies by storm. On the other hand, I did notice a few little details that could be adjusted with regard to polar coverage. The system’s mono summation leaves room for improvement and the classic bump at the 0° point of the enclosures needs to be smoothed out. It can’t be denied that the hall is partly responsible for this and 12-meter distance between the hangs isn’t ideal for a room that is quite small overall. Also, let’s not forget that we listened to a system that’s filtered with good old Butterworth, when the competition works with FIR and that no improvement was made via the DSPs. So, I’m very eager to hear ShowMatch again when it’s equipped with Powersoft and particularly when driven by the specific presets allowing it to benefit from the processing power that these amplifiers possess. Also, I’m eager to hear refined polar audio, which will lead to longer lines and an even more in-your-face sound. Also, maybe these new presets will take the various possibilities for symmetrical or asymmetrical coverage into account. Our group in full swing with ShowMatch! When all is said and done, ShowMatch is undoubtedly well conceived from a mechanical and acoustic point of view and with the work that will be carried out based on consumer feedback, it will establish itself in its professional landscape. NEXO has posted new 2017 dates for its popular ETC training seminar programme. Dates have been set for six different seminars exclusively in France, taught in French or English. As a reminder, all Nexo seminars are free of charge and courses take place over 2 days. The training room waiting for you in Plailly. The scope of the ETC programme ranges further than just NEXO products. 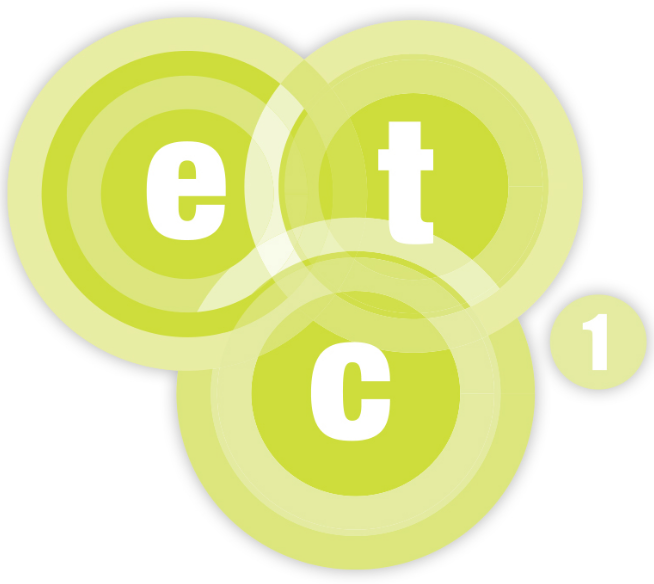 ETC1 is designed for sound technicians and engineers and looks at generic issues of sound reinforcement such as acoustic fundamentals, and the theoretical approaches of point source and line array systems. 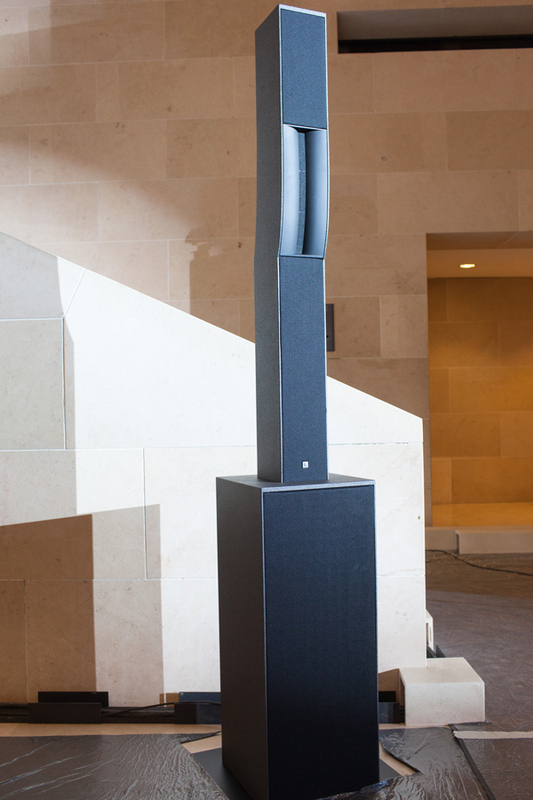 All seminars include practical hands-on training with NEXO’s own loudspeaker technologies. 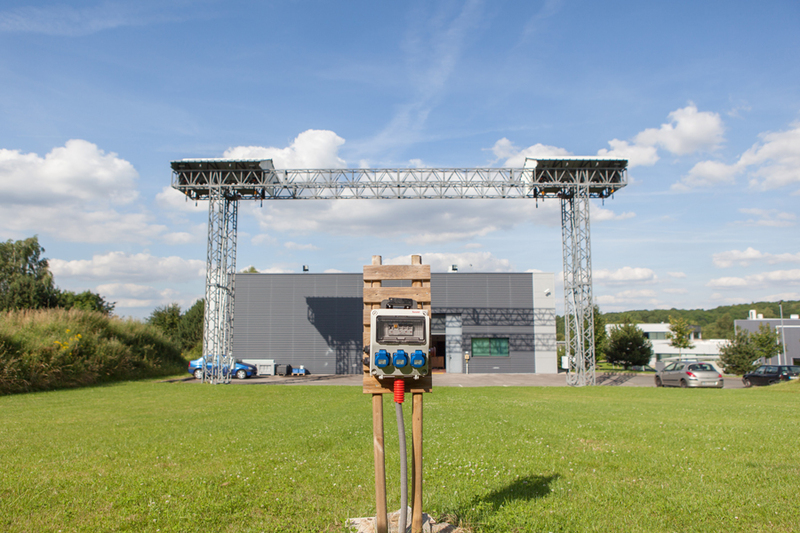 When the weather looks too British, a simple way to hang some enclosures inside Nexo’s HQ. ETC2: is designed for system techs and engineers. This course starts with theoretical classes on acoustics and NEXO technologies, and progresses to practical hands-on sessions covering system management and tuning with NEXO loudspeaker systems. 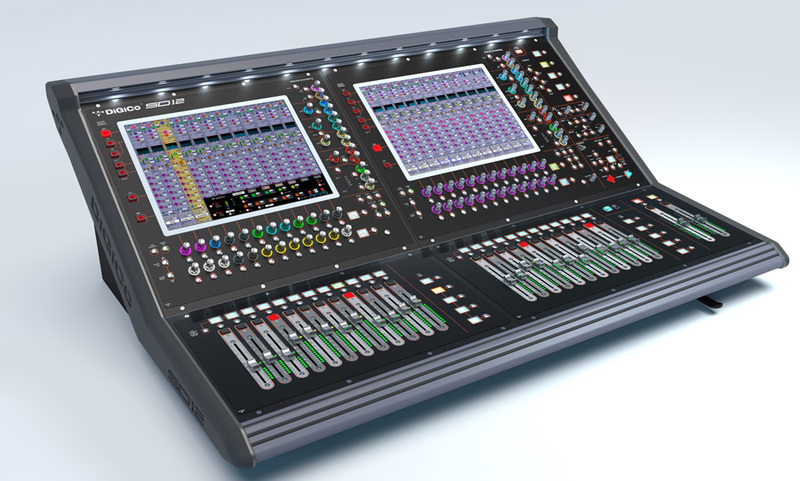 This year, DiGiCo celebrates 15 years of manufacturing exceptional digital mixing consoles. It has enjoyed phenomenal success, with the D5 Live establishing both the company and the concept of digital mixing. The SD Series followed, delivering a powerful new way of working, with the flagship SD7 becoming the market leader. In 2015, it launched the affordable S Series with a new, modern workflow. In 2016, it introduced Stealth Core 2 software, which multiplied the power of the SD range of consoles exponentially. Now, at the very beginning of 2017, it has unveiled Project Vulcan, the new SD12. The SD12 is the culmination of everything that DiGiCo has learned over the last decade and a half and encapsulates the best features of both the SD and S Series. Utilising the latest generation of Super FPGA, it is compact in size, but delivers the power and capability that is now synonymous with DiGiCo consoles. The SD12 features 72 input channels with full processing, 36 aux/group busses with full processing, a 12 x 8 matrix with full processing, LR/LCR buss with full processing, 12 stereo FX units, 16 Graphic EQs, 119 Dynamic EQs, 119 multiband compressors and 119 DiGi-TuBes, 12 Control Groups (VCA) and SD Series Stealth Core 2 software, making it compatible with all other SD Series sessions. One of the SD12’s outstanding features is its dual 15-inch digital touchscreens – previously only seen on the SD7 and SD5 – which provide 24 channels in one view, dual operator mode and the ability for the right-hand screen to be the Master, as well as advanced connectivity via optional DMI cards, yet the SD12 still maintains a workflow that will be familiar to anyone working in live touring, corporate, installation, House of Worship, theatre or broadcast. The surface shot vertically. She features two touchscreens and a whole lot of encoders, plus 24 faders. EQ and dynamics controls are aligned perfectly next to both the left and right-hand screens, so that they sit adjacent to the graphic representation that you see when you assign an EQ. 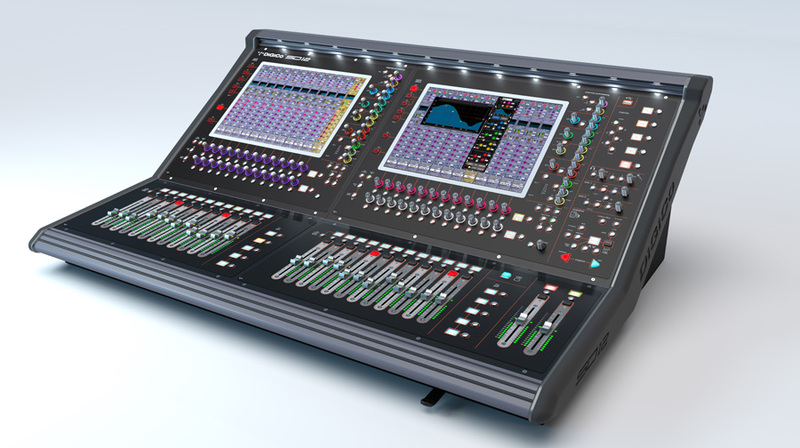 Unusually for a console this compact, DiGiCo has included its famous Hidden Til Lit (HTL) technology, with two banks of 24 encoders featuring an RGB HTL ring, as well as an SD7-style channel strip with HTL EQ encoders. There is also new Dynamics metering on the channel strip and new high intensity meters associated with the faders. The rotaries that sit below the screen indicate, by colour, what parameters they are controlling to allow for fast operation; these are also HTL. Small surface yet offering a full control with a quick and direct access. One of the other important things with a digital console is the feedback of the metering. The Dynamics controls are exactly where you would expect them to be, but with the addition of Gain reduction meters normally only seen on the SD7 and SD5 and metering to show the action of the Gates making the feedback from the worksurface unrivalled at its price point. There is also an assignable Master section on the bottom right hand side of the worksurface, again only previously seen on an SD7 or SD5, and two assignable faders with their own displays and metering, which can be assigned to be any of the channels whether input or output, or Solo Master controls. Dedicated RGB scribble strips, of which there are five, can be assigned to Macros with five banks giving a total of 25 Macros, and there is a Snapshot panel for quickly accessing and controlling the Snapshots list, as well as for firing the next and previous Snapshot. The back of the console with 2 DMI slots ready to welcome any needed card depending on the projects. There are two slots for DMI cards. Options include a Dante module, which can be plugged straight into the back of the console, alleviating the need to purchase an Orange Box. 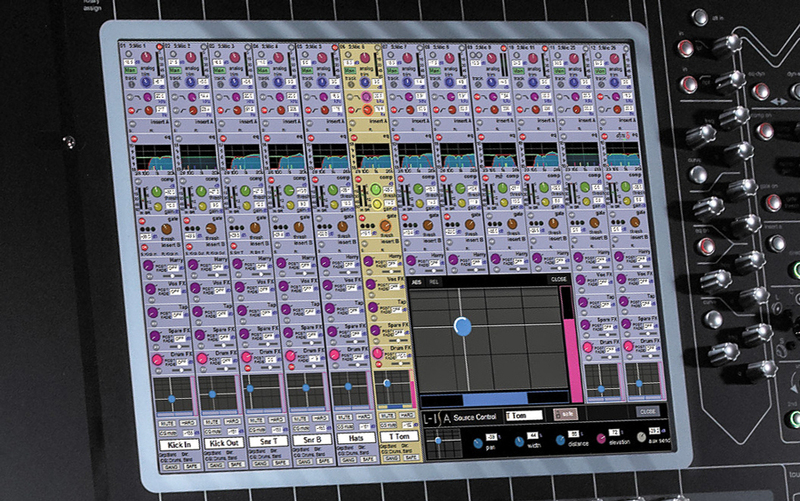 A Waves module can also be fitted to take full advantage of the SoundGrid platform. In fact, there is a huge family of DMI cards that can be plugged in the SD12, which can be changed between different projects or tours, depending on requirements. Adding to its already considerable benefits, the SD12 has a suite of remote control options, including the iPad SD remote app which offers remote control, expansion and show control. Offline software, meanwhile, allows for session preparation and online remote. There are OSC and Ross network protocols; 16 pin GPIO that allows for audio follows video and show control; Serial/MIDI in/out for MMC/MTC, MIDI remote and QLab; second console mirroring and redundancy. And, because the SD12 is an SD Series product, there is also the option to upgrade straight into the Optocore network with not one, but two loop options, allowing the SD12 to sit happily anywhere on a loop with any other Optocore enabled SD product. The SD12 with the dynamics on the screen. Full Dynamic EQ, DiGi-TuBes and Multiband Compression on every processing strip. full function channels across the entire console, whether it is an output or input. Few bands are more immediately recognizable—visually and sonically—than The Cure, whose enduring career is now entering its fourth decade. 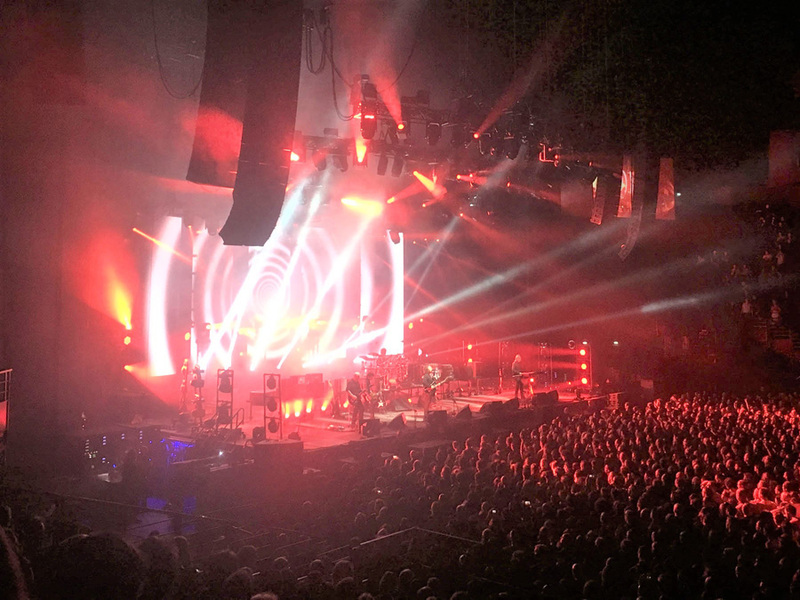 London-based Britannia Row Productions has been with singer/guitarist Robert Smith and his mates for most of that time, since 1979, providing global touring support for the post-punk group, which is currently out on the road with an L-Acoustics K1/K2 system. Aside from a few short jaunts and various one-offs at major festivals, “The Cure Tour 2016”—which played 33 shows in North America this spring and is now journeying through 34 shows in 17 European countries—marks the first real outing for the band since the release of its 13th studio album, 4:13 Dream, and subsequent tour in 2008. 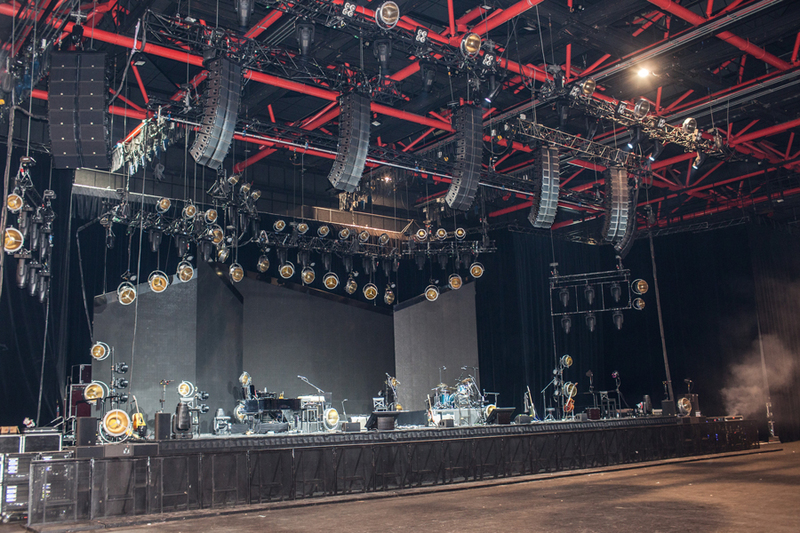 In anticipation of this year’s worldwide tour, Britannia Row added a large quantity of new L-Acoustics products to its already bursting arsenal of gear, including K1, K1-SB, Kara, ARCS II, ARCS Wide, X8 and 5XT enclosures, plus the manufacturer’s brand new KS28 reference subwoofers and LA12X amplified controllers. Selling out every arena, amphitheater and shed on its North American leg—including three nights at both the Hollywood Bowl and Madison Square Garden—The Cure is fast repeating that success on its European/UK run as it performs 40 years of songs, mixing hits, rarities, favorites, and as yet unreleased tracks in a new stage production that culminates with three dates at London’s SSE Arena in early December. 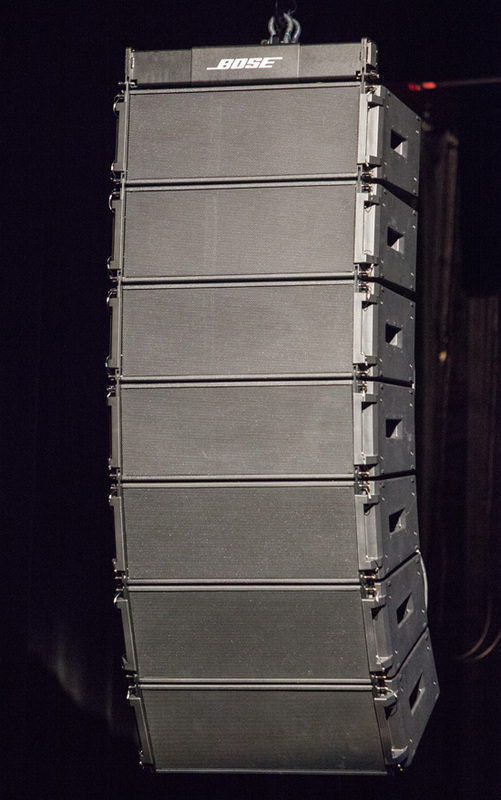 The typical loudspeaker arrangement for the current tour leg features left and right main arrays of K1 over K2 down, plus hangs of K1-SB low-frequency extension enclosures flown behind each K1/K2 array. Additional side hangs of K1 over K2 down address the far left and right seating sections, while dual arrays ARCS II cover the area behind the stage. 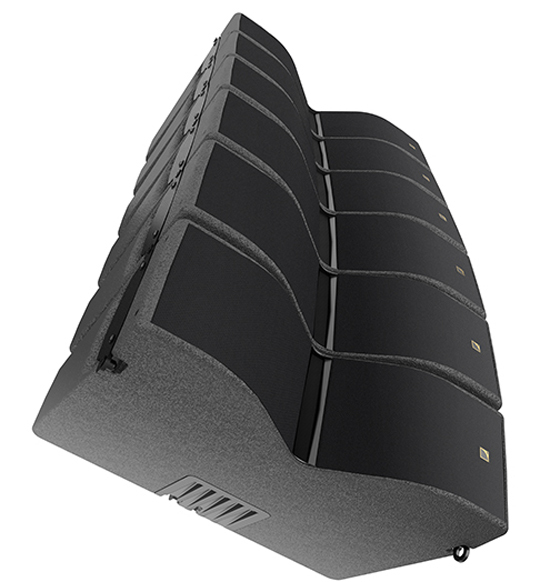 Low-profile Kara enclosures spread out across the stage lip deliver front fill, with ARCS II cabinets on each side of the deck serving as stereo outfills. Ground-stacked KS28 subs anchor the show’s low end, and a combination of LA8 and LA12X amplified controllers power and process the entire loudspeaker complement. The challenge, particularly on the US run was to adapt the system to such a wide range of venues and their ever-changing environments, both indoors and out. “Going from large American arenas to scaled down college basketball floors, huge amphitheaters with extreme elevation, a flat green field site, and then back into sheds—often with dated ‘house’ lawn delays and low tin roofs—was what our technicians had to contend with week after week,” Grant recalls. 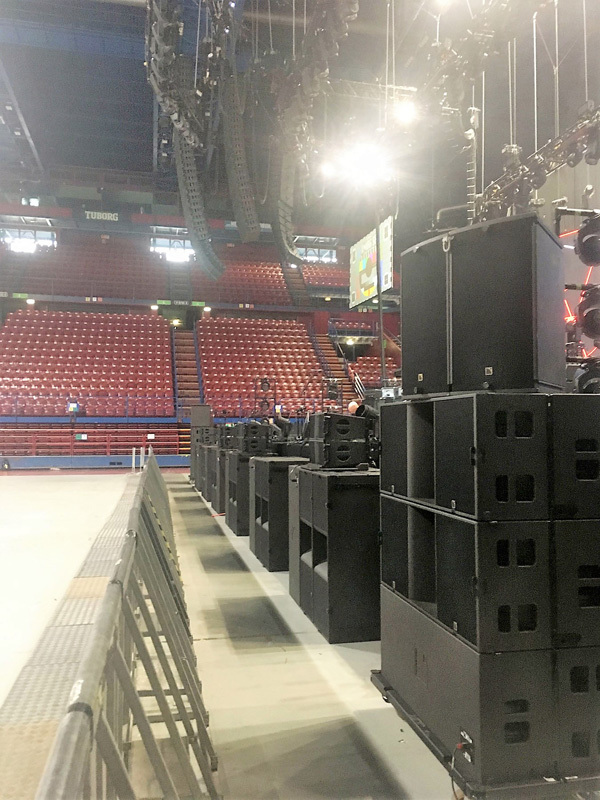 According to Brit Row Business Development manager Dave Compton, L-Acoustics’ Soundvision was absolutely essential in making the 2016 tour a success. “Once the final system spec was confirmed, the majority of work was done well in advance of the tour starting,” he says. 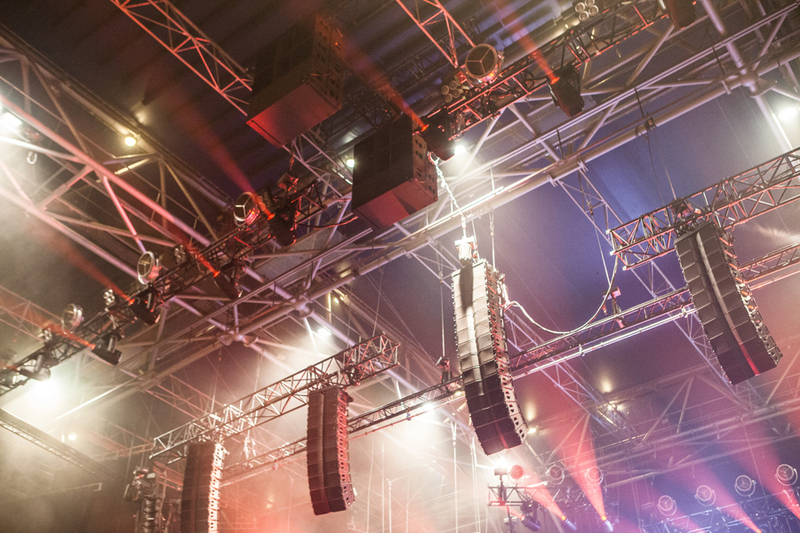 “We pulled room data from the L-Acoustics database, and for venues that were not included, David Brooks and other friends and colleagues from within the L-Acoustics network helped. 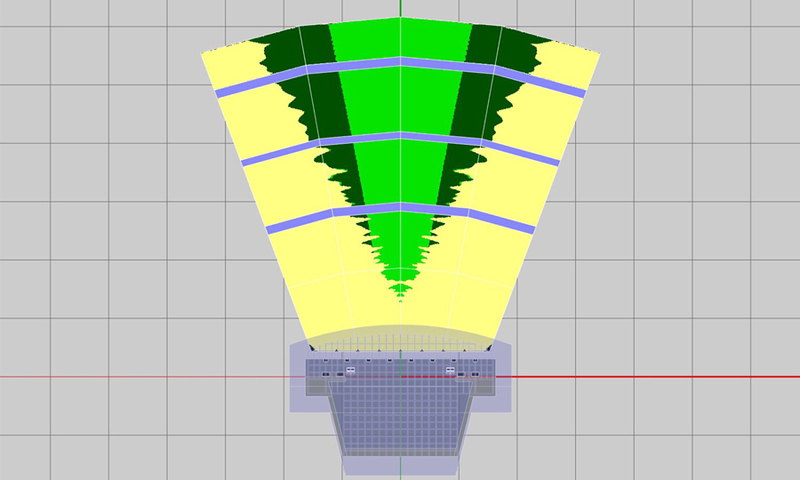 A model was created in Soundvision, containing all the system resources available for the tour, with speaker groups that included different array types, both flown and ground configurations, as well as multiple sub designs. This allowed for a quick start when preparing and working on designs for each particular venue. The mute/hide function within the speaker data window proved invaluable. “Adam Smith, the tour’s system tech and Soundvision operator, then tweaked ‘on the day’ first thing in the morning upon arrival—double checking room data, confirming flown array types and numbers, finalizing ground configurations and sub design, and so on.” Some additional work could then be applied within source settings to achieve the necessary SPL target over distance, Compton notes. 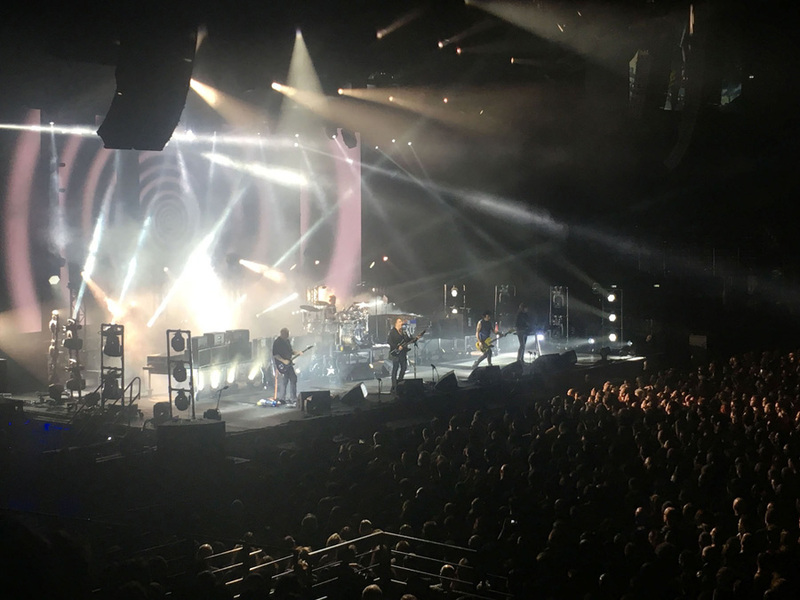 Primary audio crew on “The Cure Tour 2016” includes FOH engineer Paul Corkett, monitor engineer Rob Elliot, system techs Adam Smith and Laurie Fradley, FOH tech Collin Burrell, and monitor/stage tech Luke Chadwick.